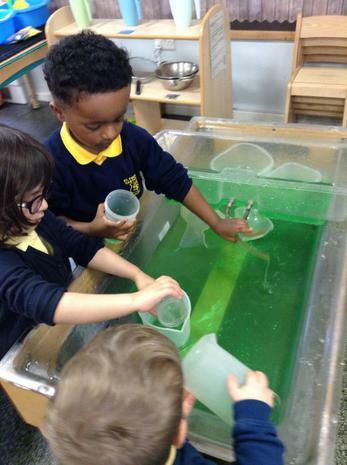 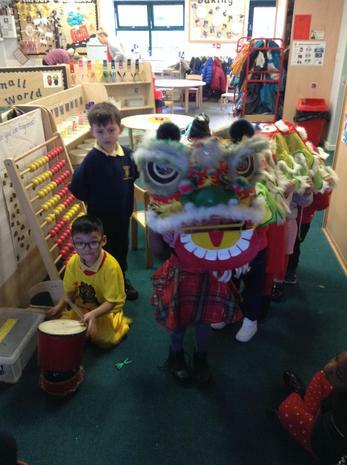 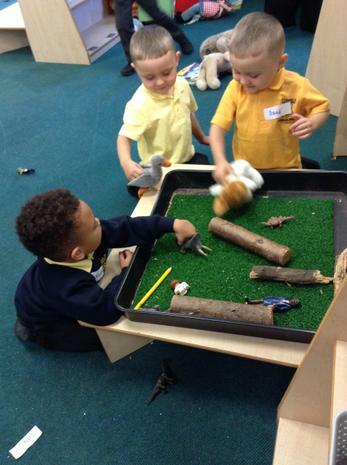 A warm welcome to our friends of Nursery P to our class page, where we will be sharing all of the fantastic things we have been learning in school. 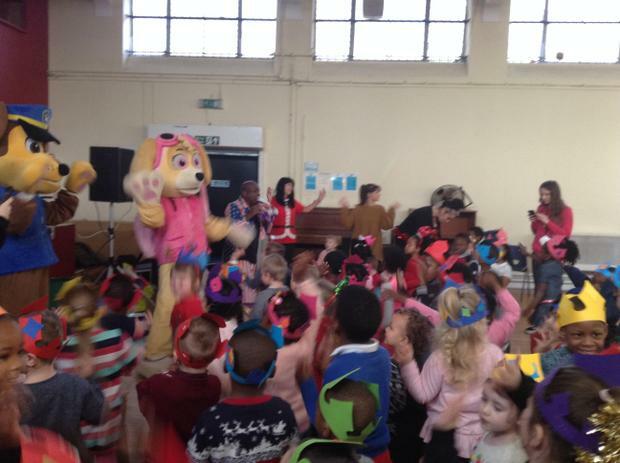 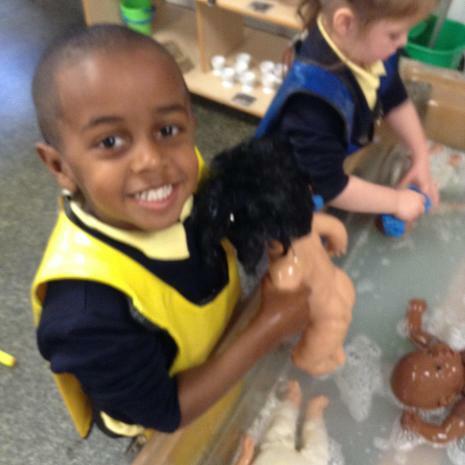 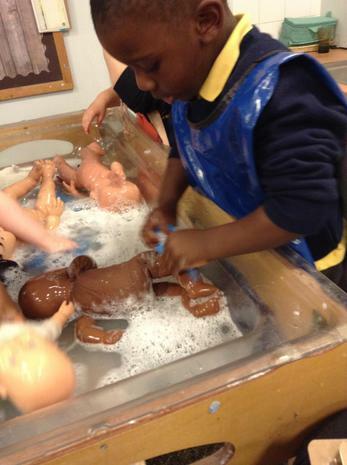 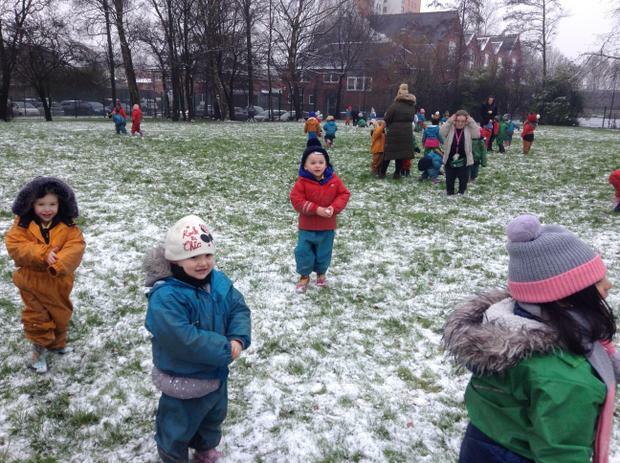 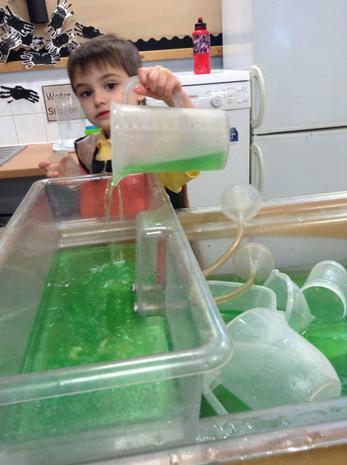 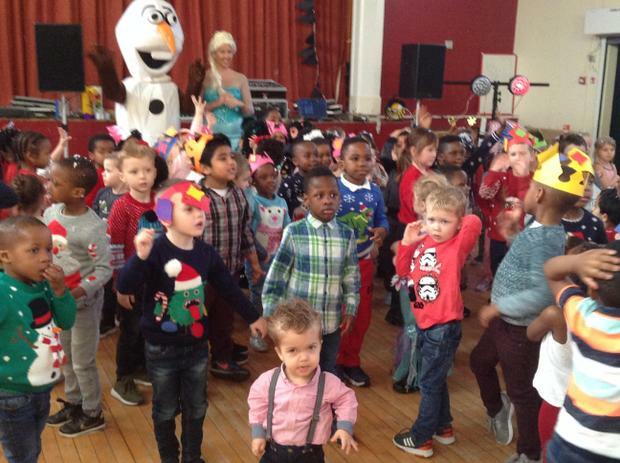 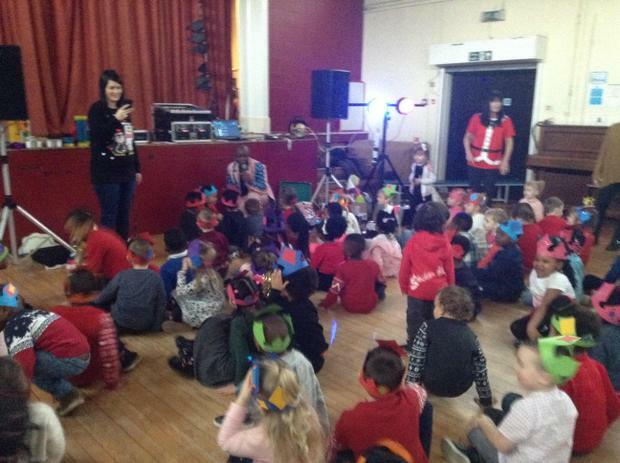 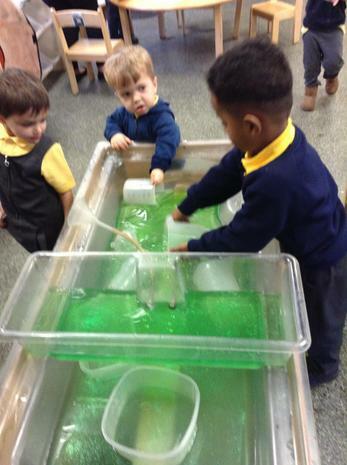 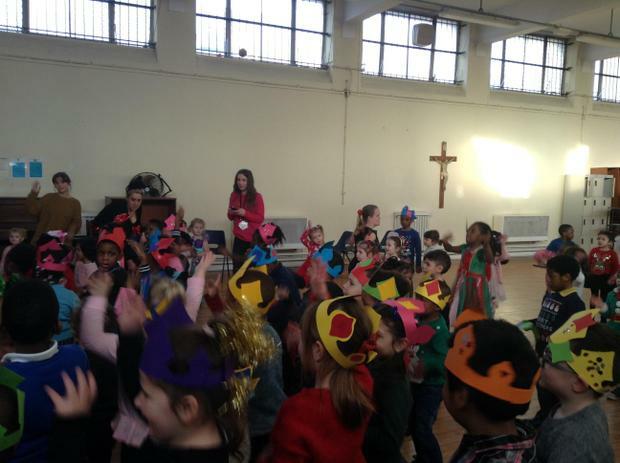 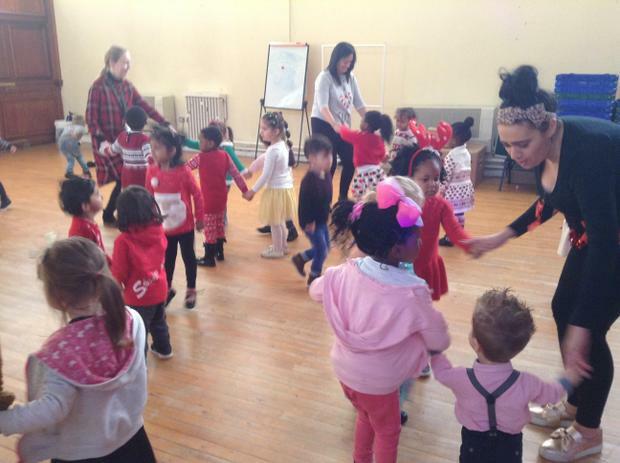 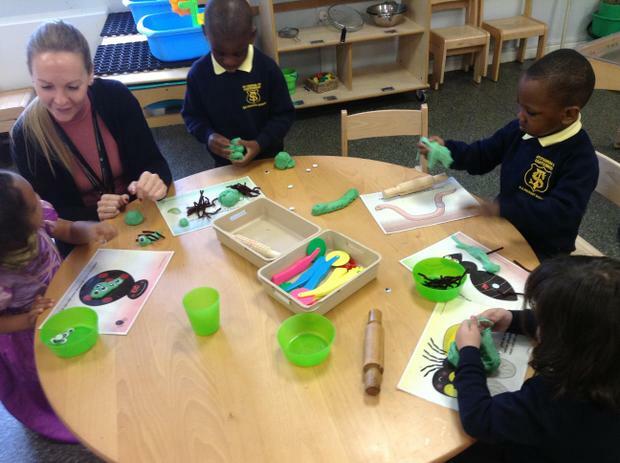 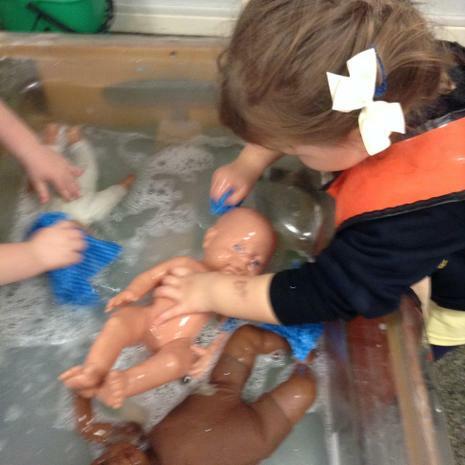 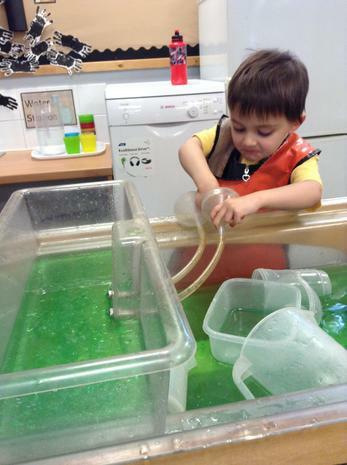 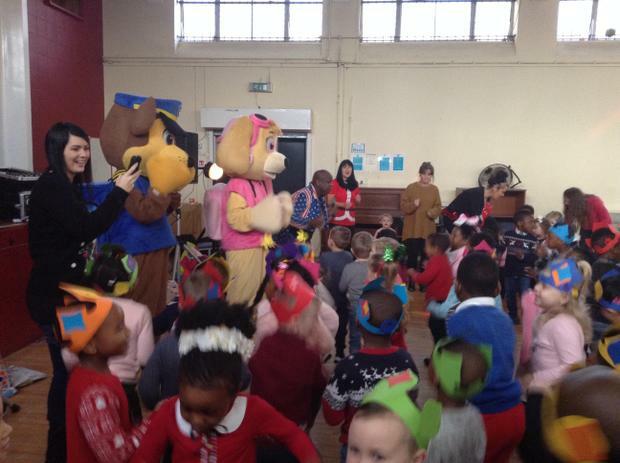 Our Nursery day is a busy one, filled to support the children in all areas of our early years curriculum. 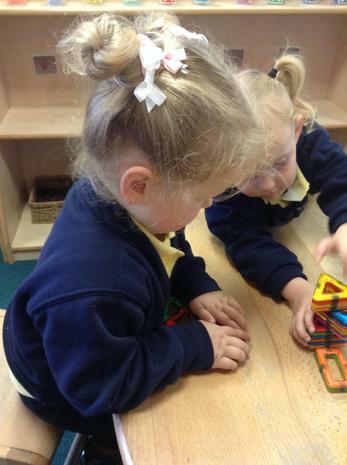 Take a look at our timetable below. 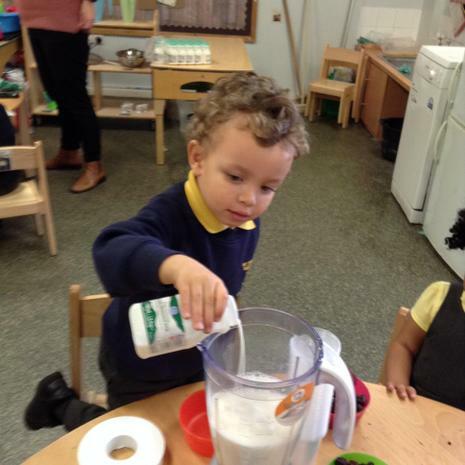 The weekly home learning support activities also play an important role in ensuring your child has the best start to their school life. 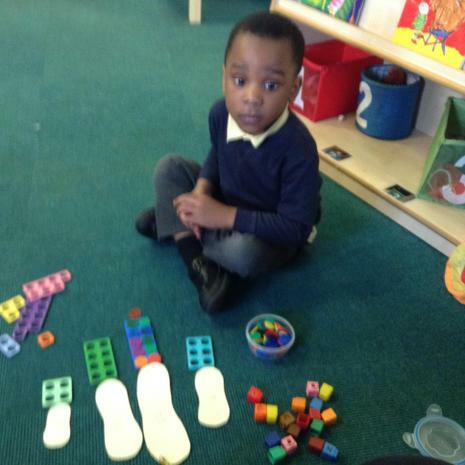 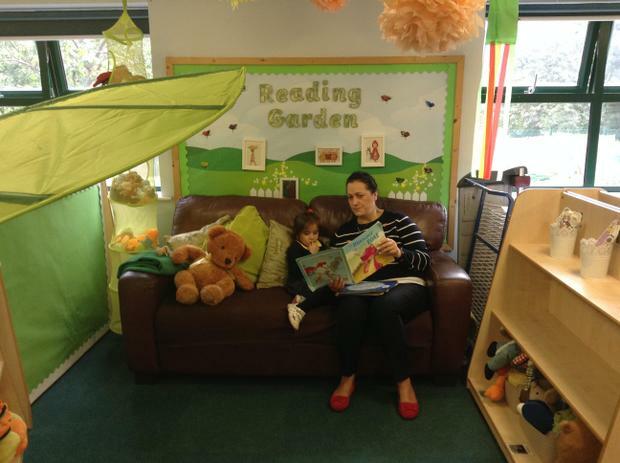 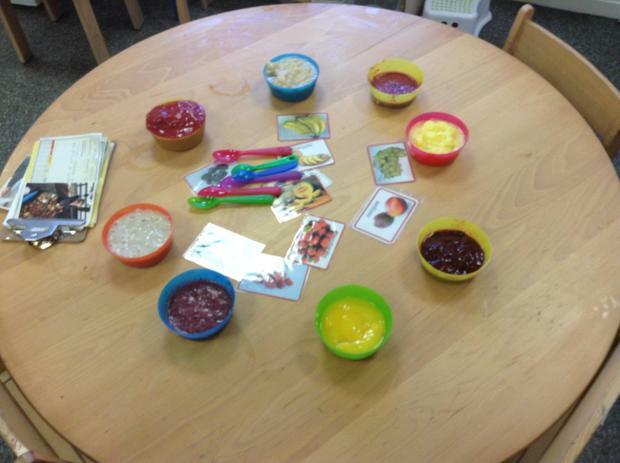 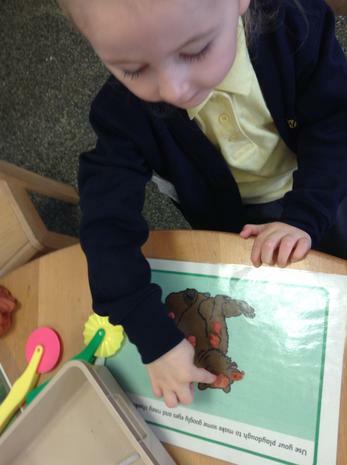 If your need any guidance or support with this, a member of our Nursery team would be delighted to help! 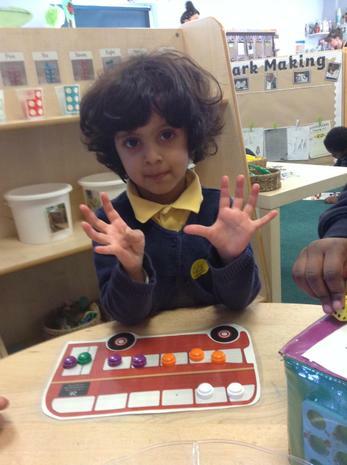 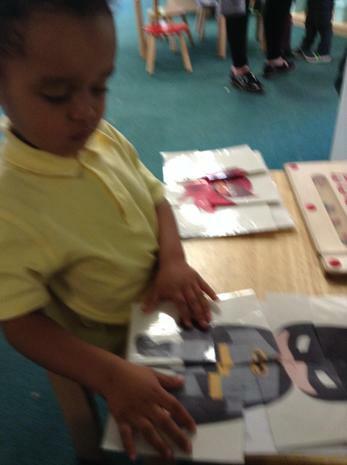 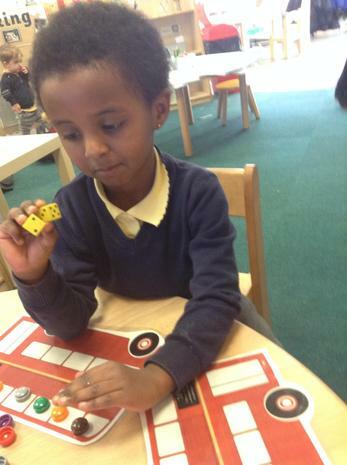 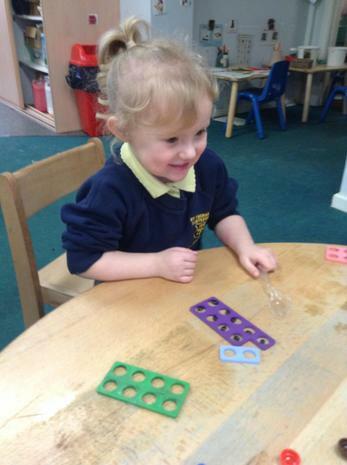 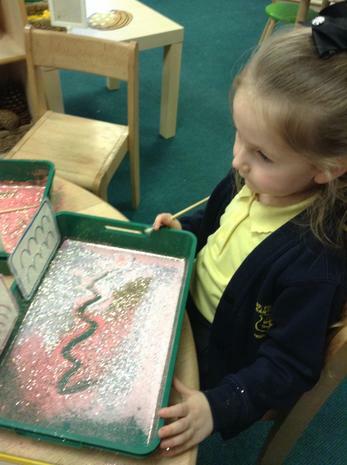 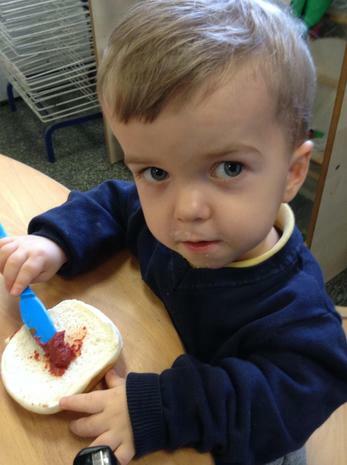 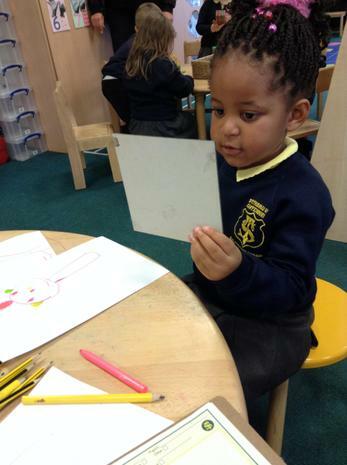 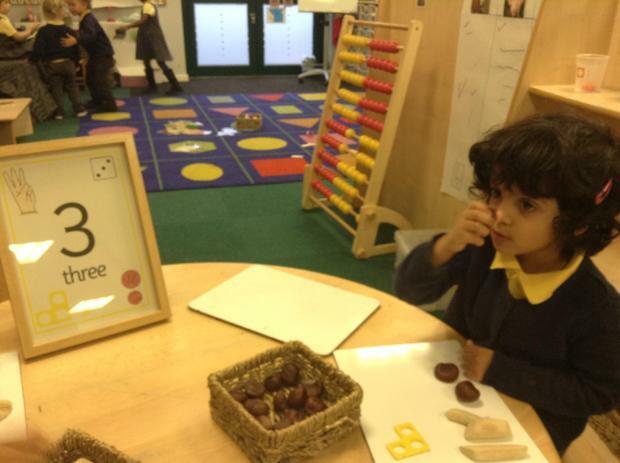 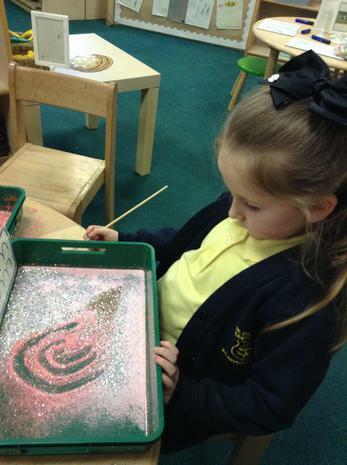 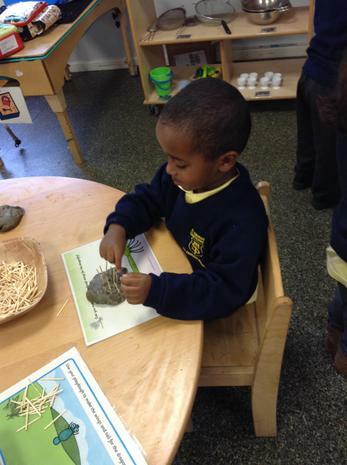 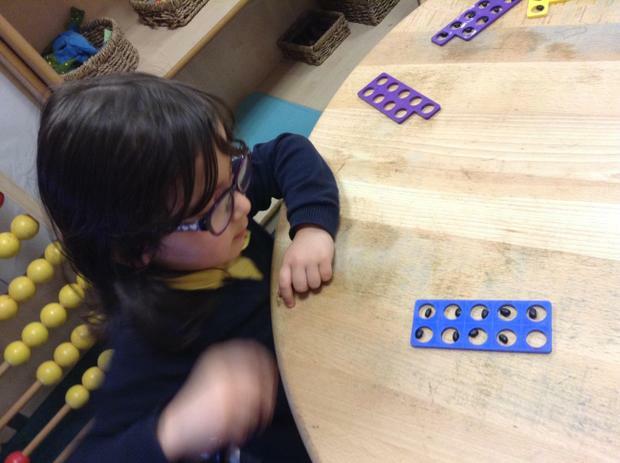 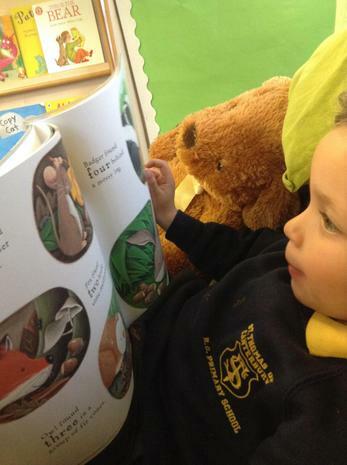 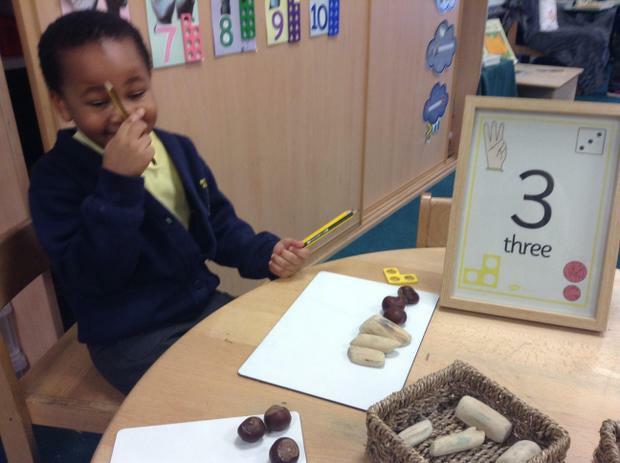 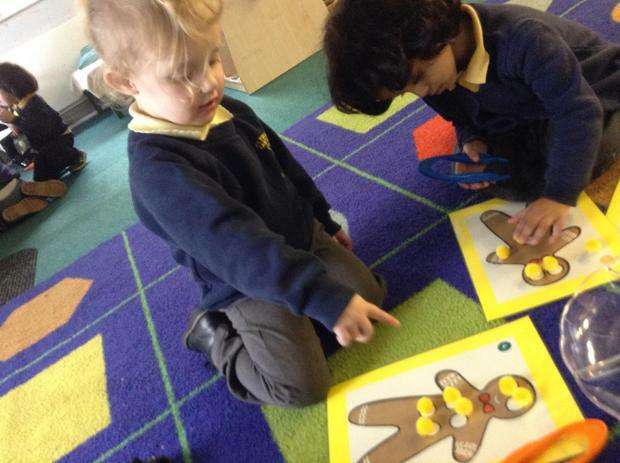 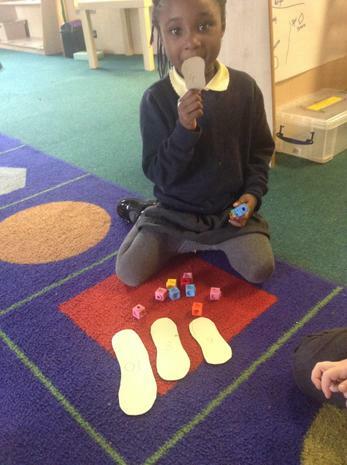 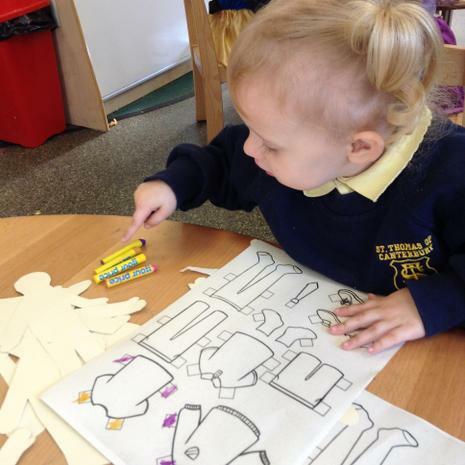 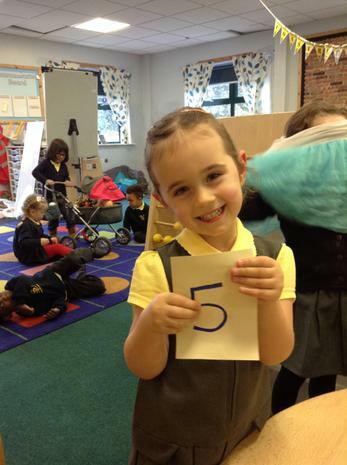 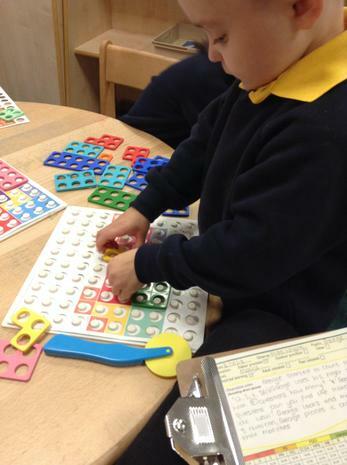 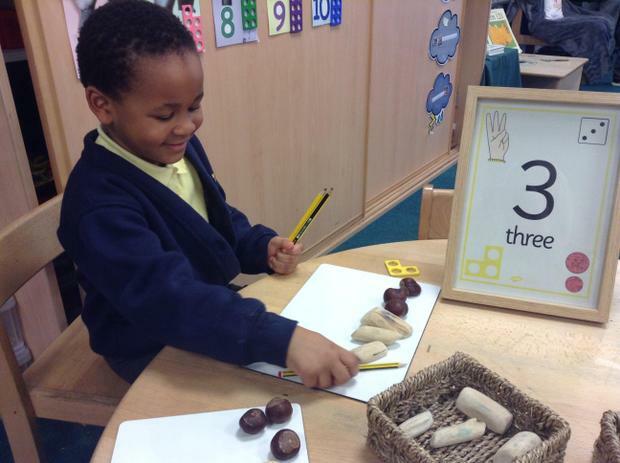 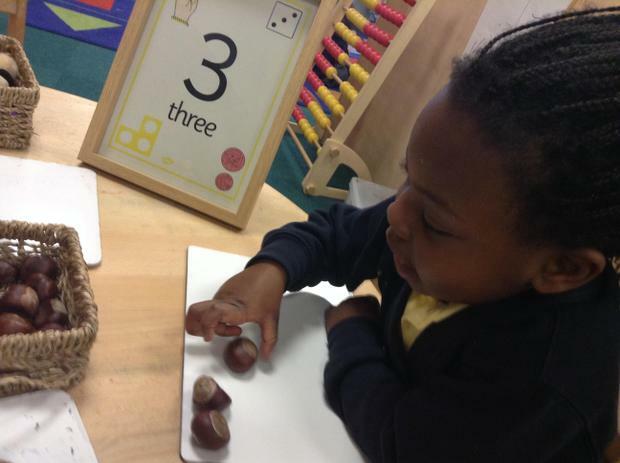 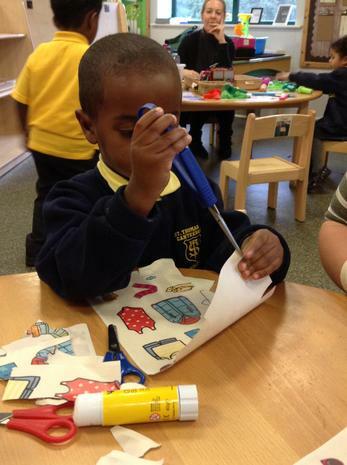 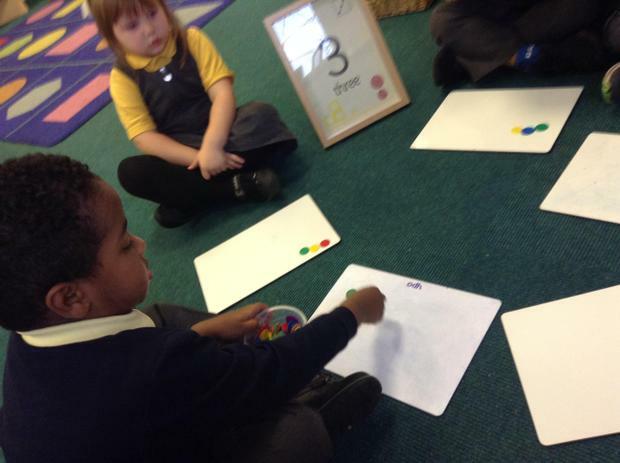 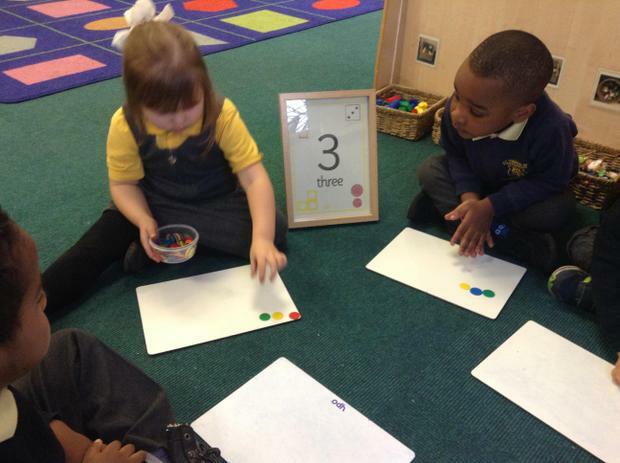 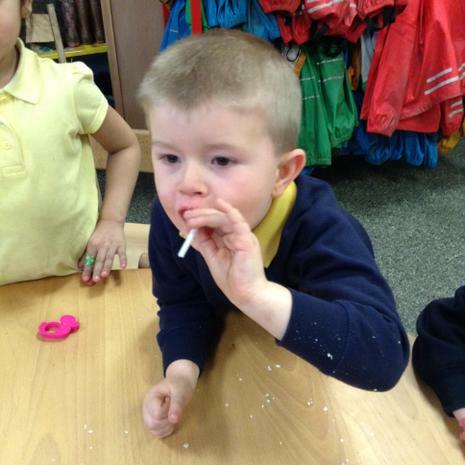 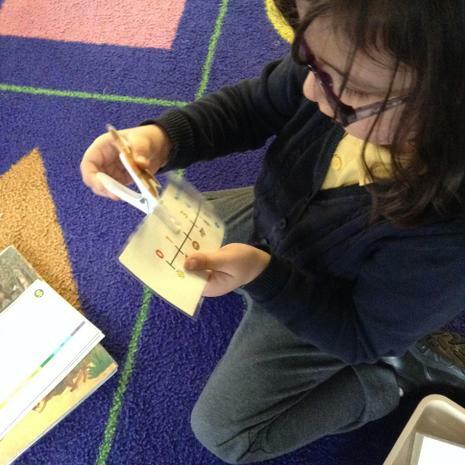 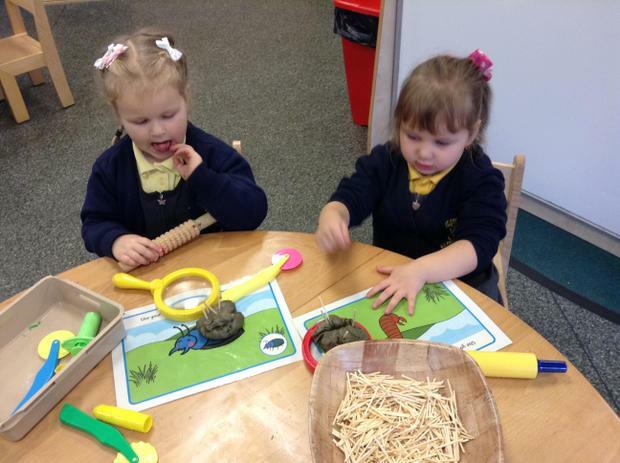 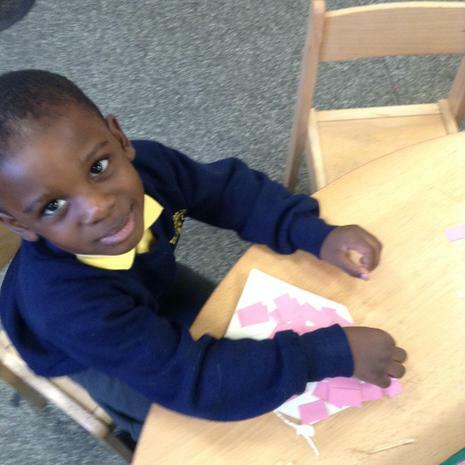 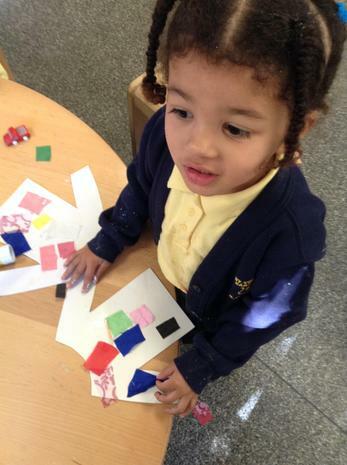 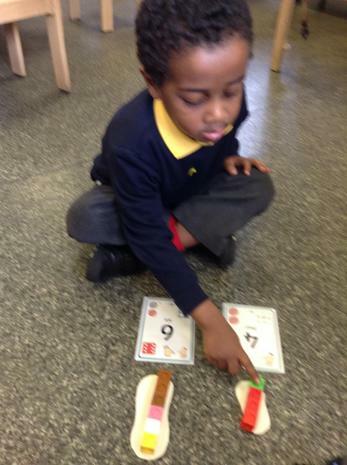 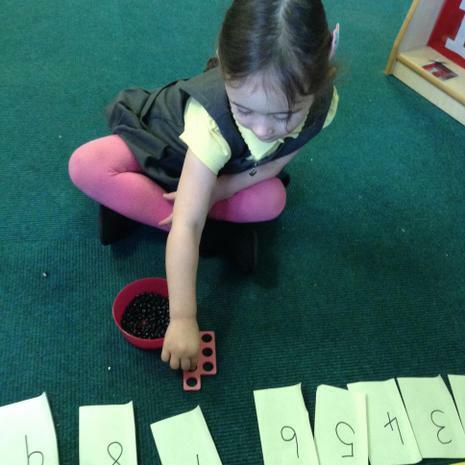 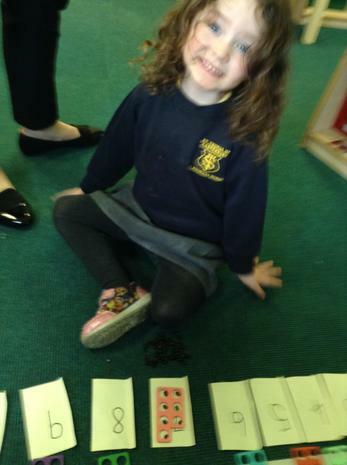 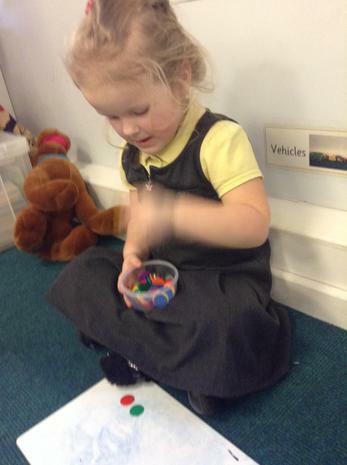 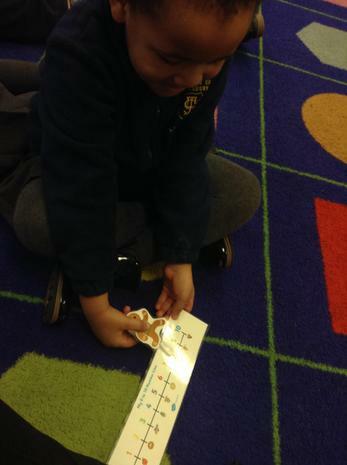 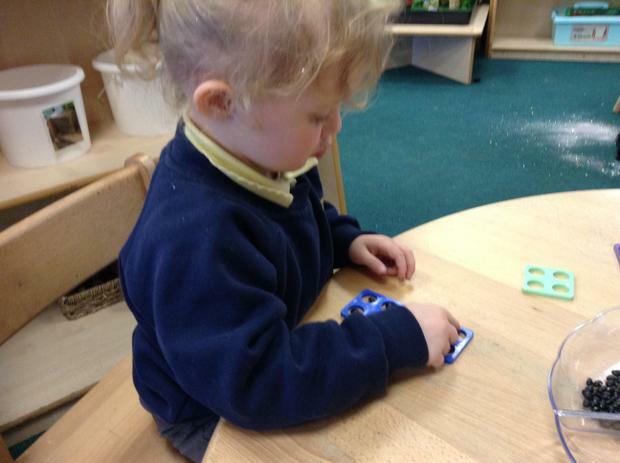 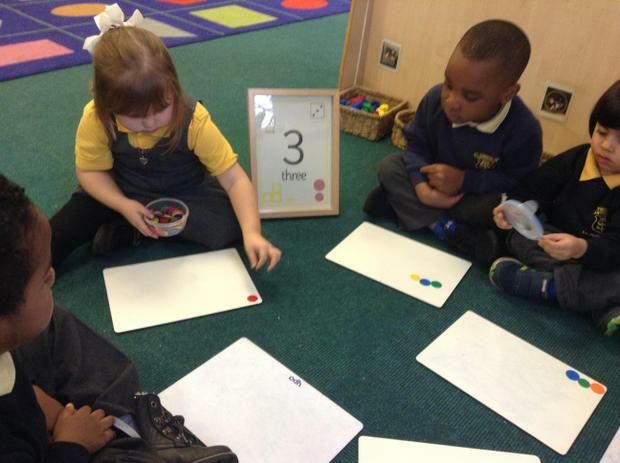 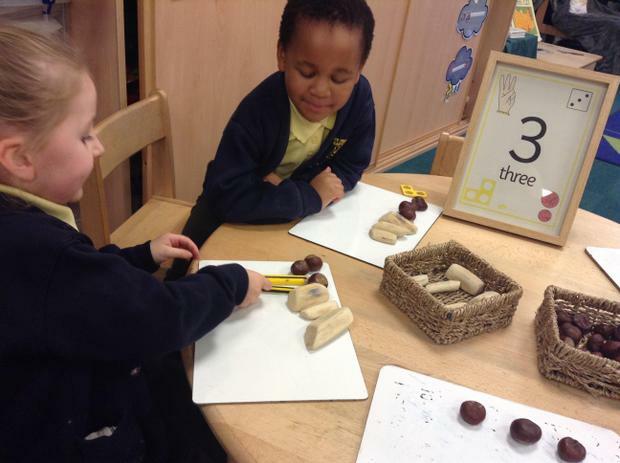 The children in Nursery have begun their reading journey by taking part in daily phonics sessions. 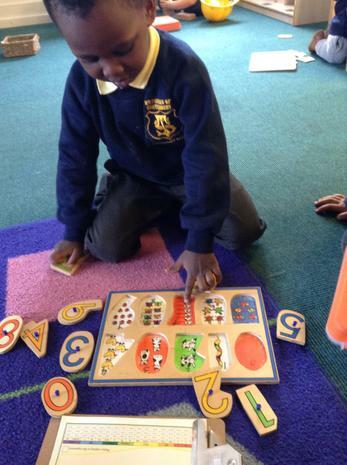 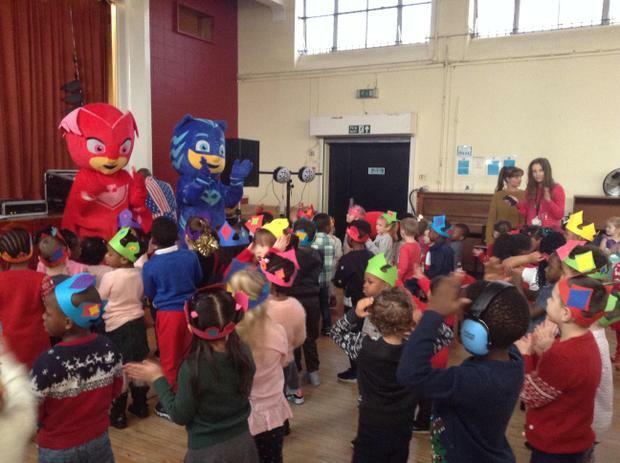 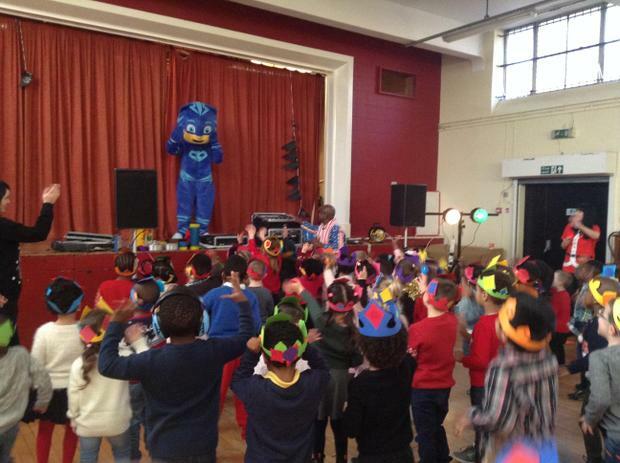 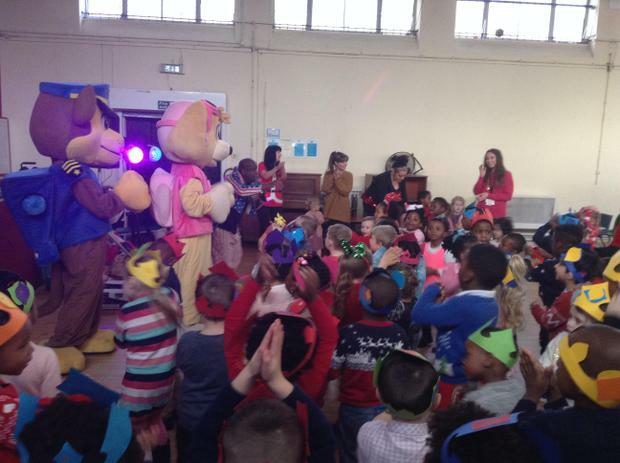 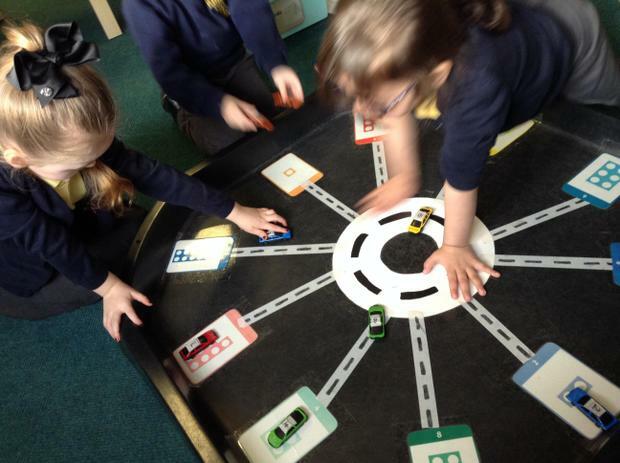 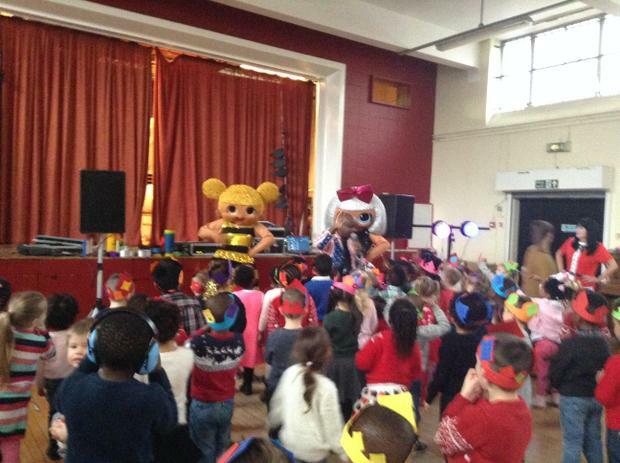 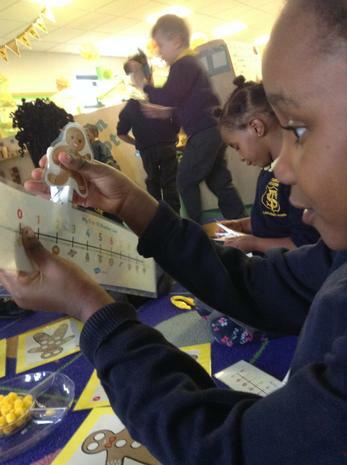 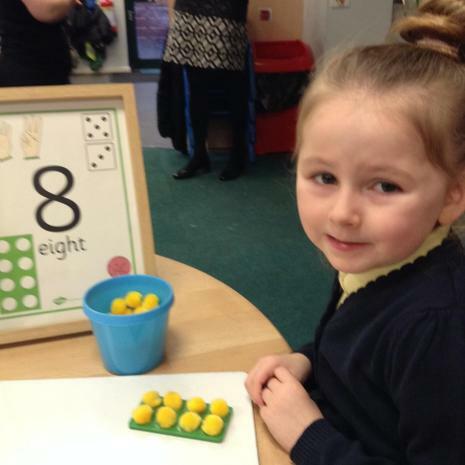 Phonics is a government produced teaching programme which runs throughout 6 phases. 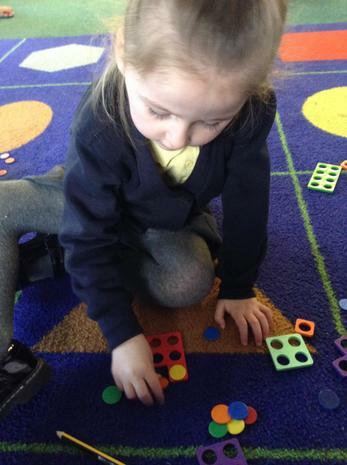 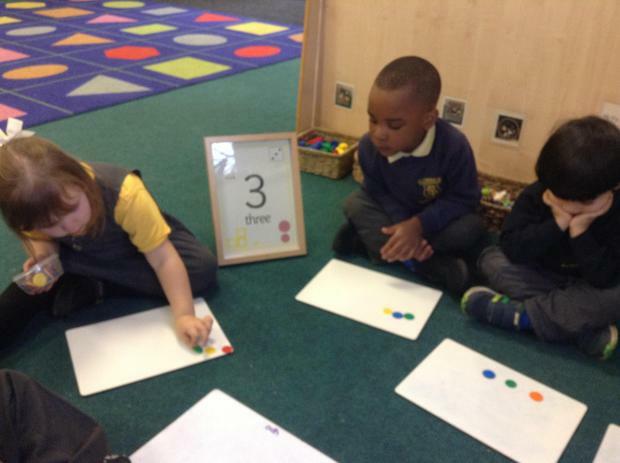 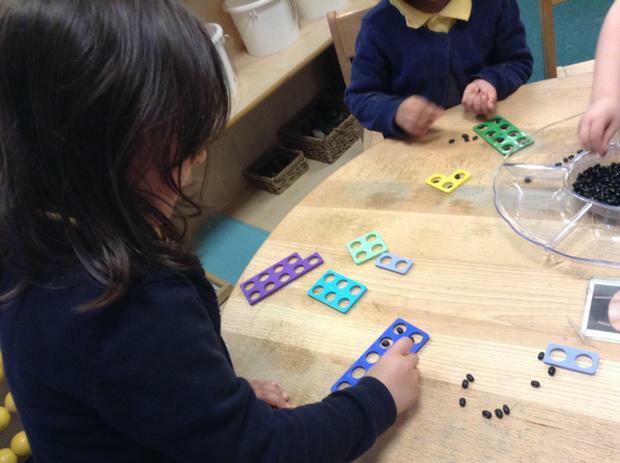 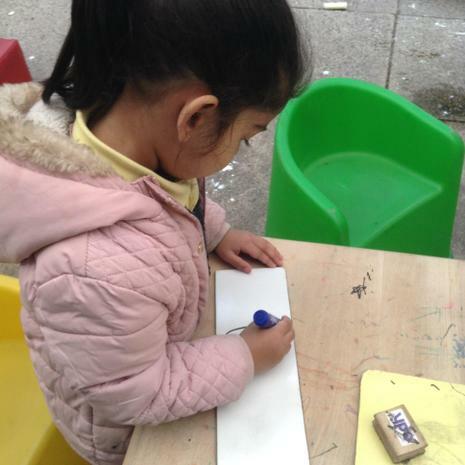 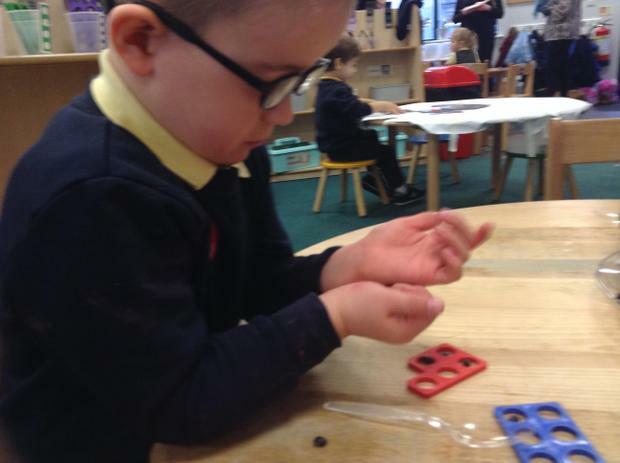 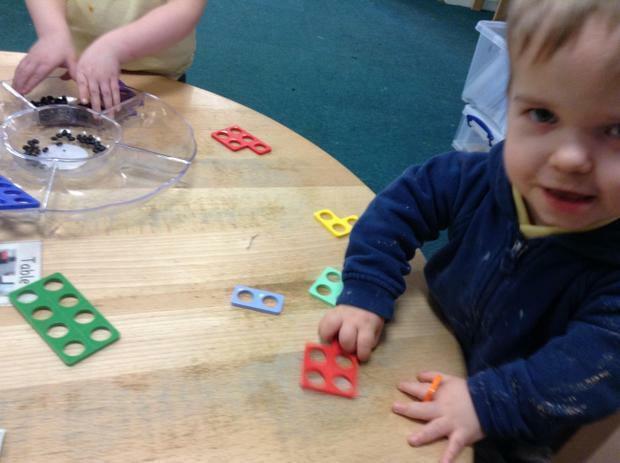 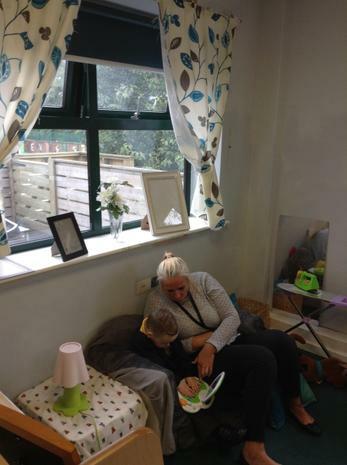 The children are currently working withing phase one of Letters and Sounds which concentrates on developing the children's speaking and listening skills and lays the foundations for the phonic work which starts in Phase 2. 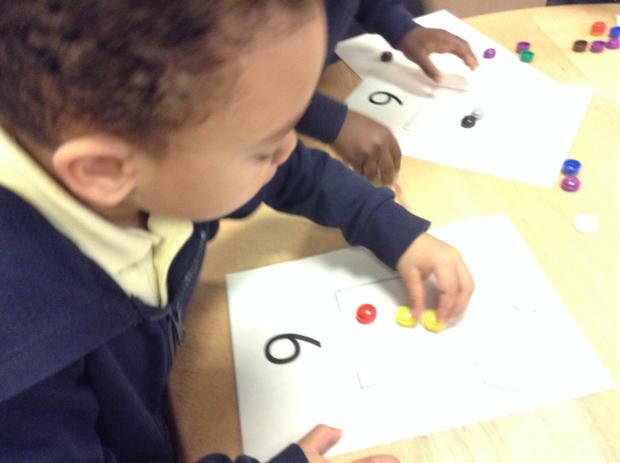 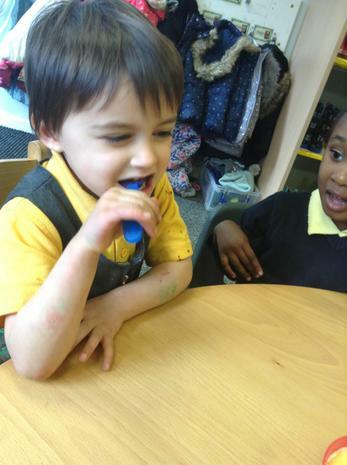 The emphasis during Phase 1 is to get children attuned to the sounds around them and ready to begin developing oral blending and segmenting skills. 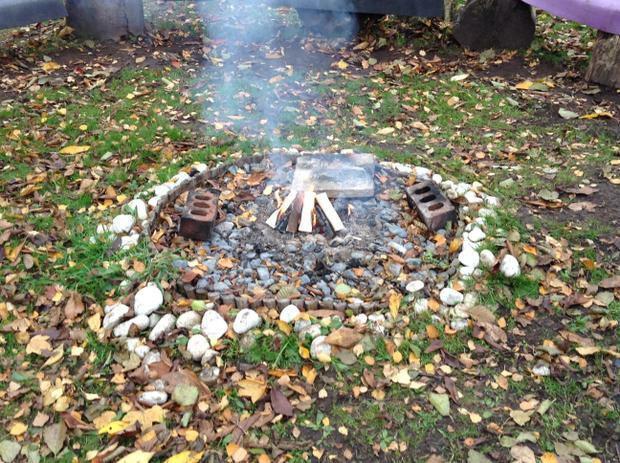 Phase 1 is divided into seven aspects. 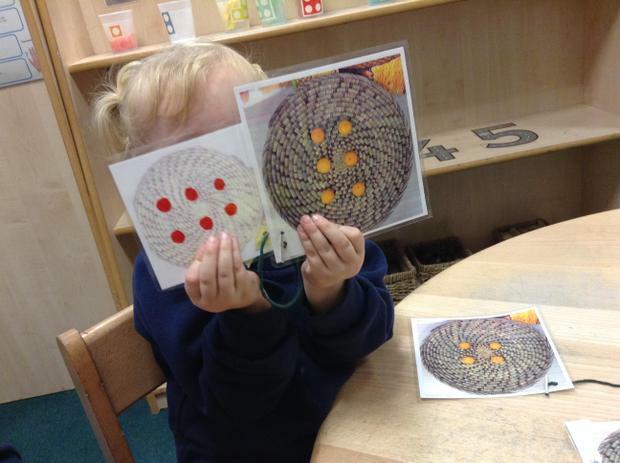 Each aspect contains three strands: Tuning in to sounds (auditory discrimination), Listening and remembering sounds (auditory memory and sequencing) and Talking about sounds (developing vocabulary and language comprehension). 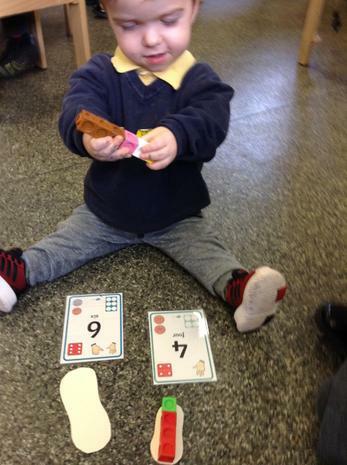 Below are some activities to support your child with phonics at home. 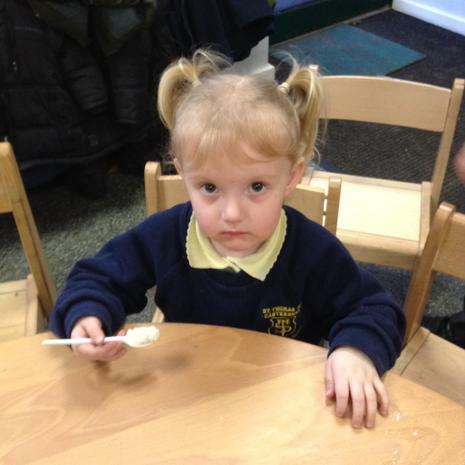 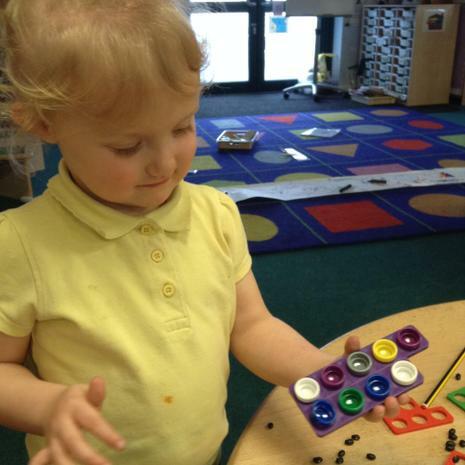 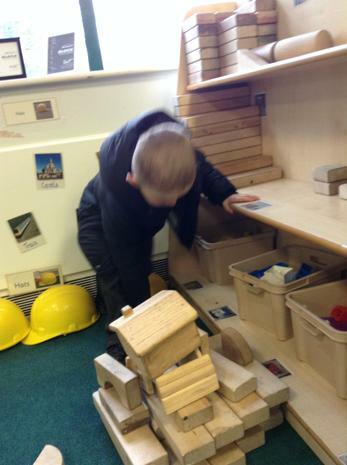 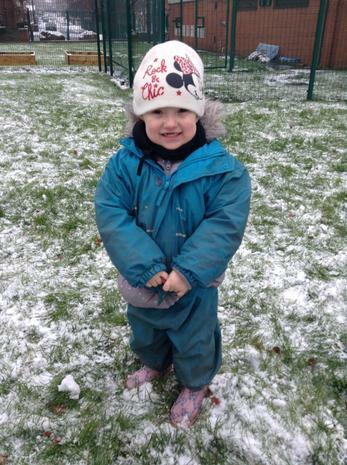 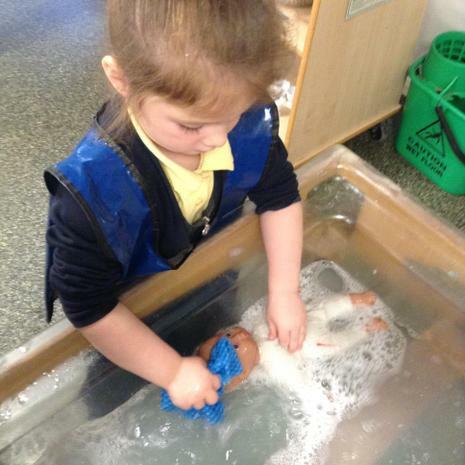 Please speak to a member of the Nursery team if you would like some additional support. 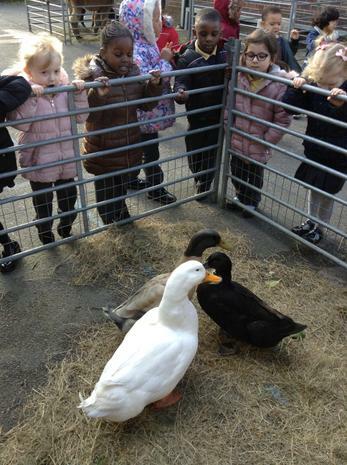 Farmer David heard how well we were looking after the chicks in school, so he wanted our help with some of the other animals on his farm. 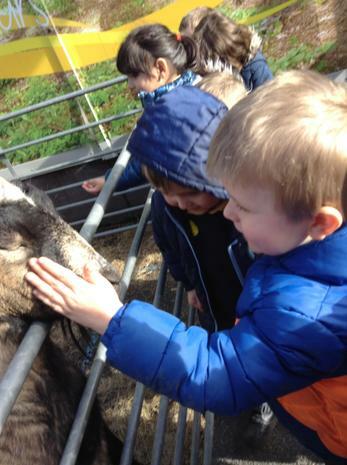 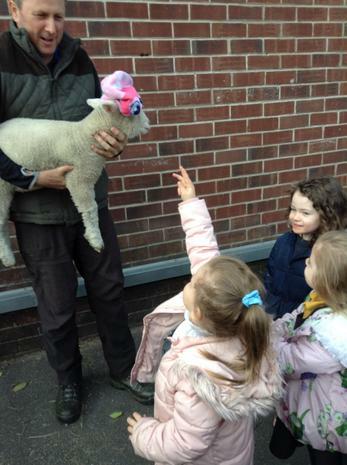 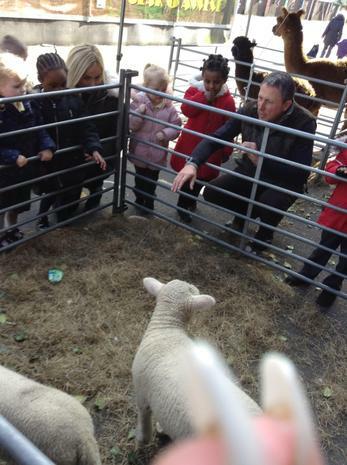 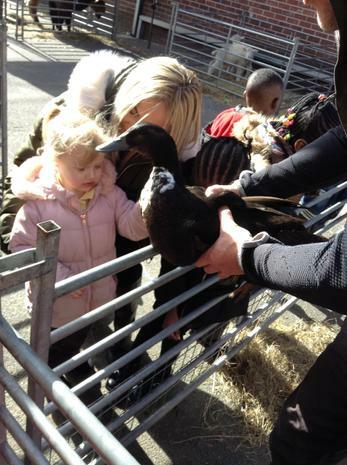 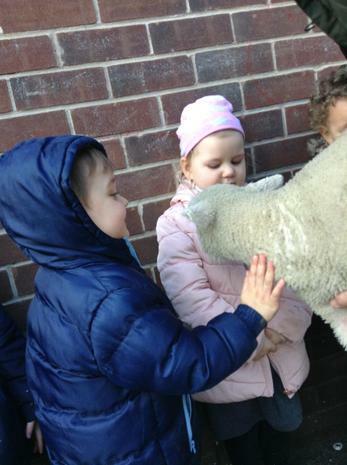 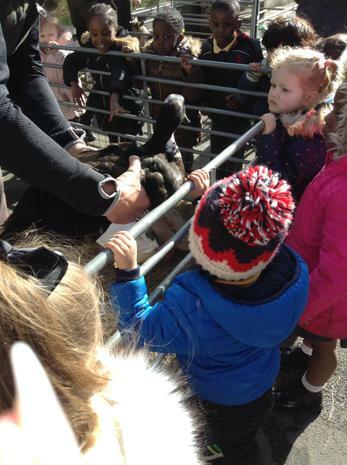 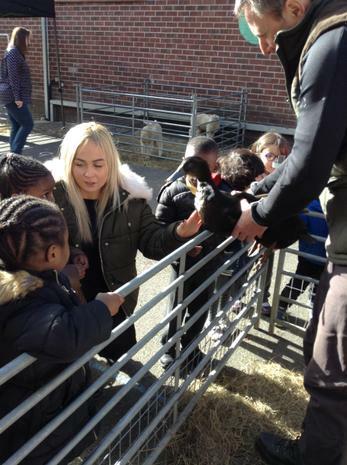 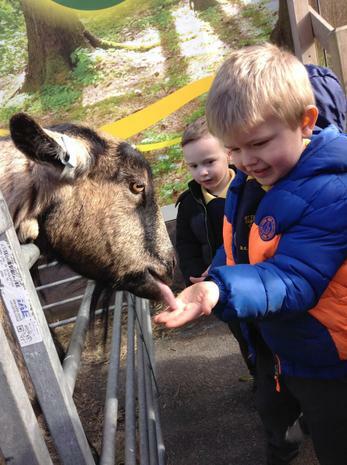 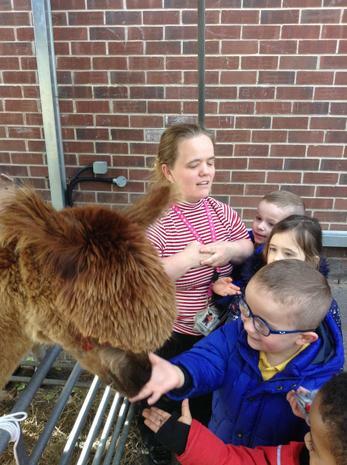 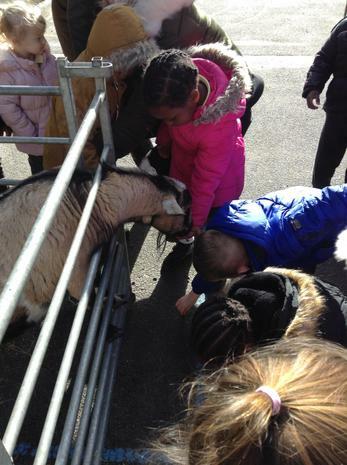 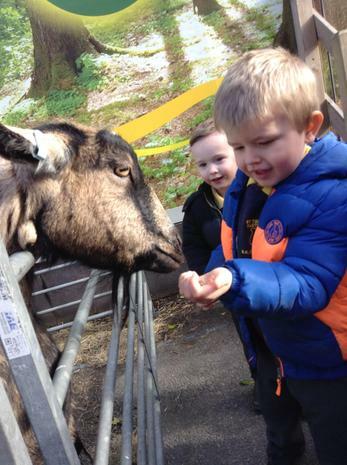 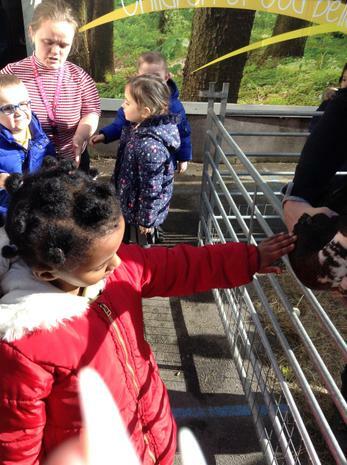 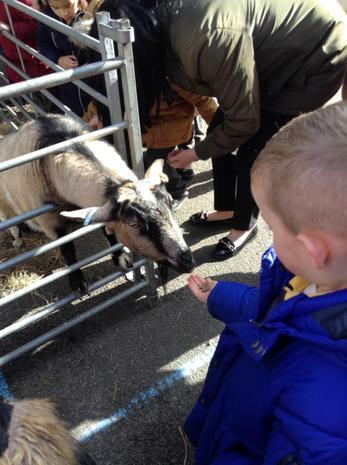 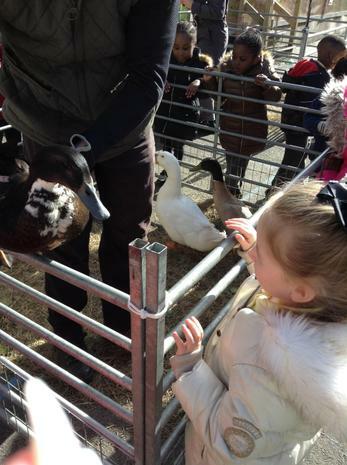 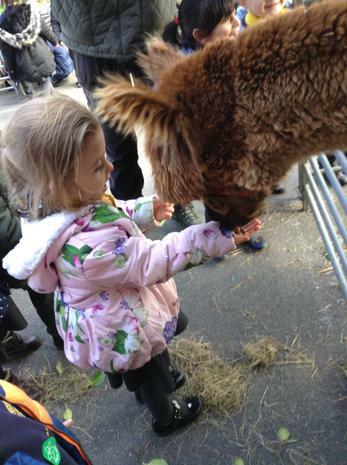 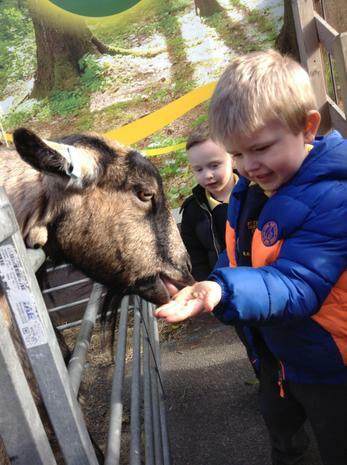 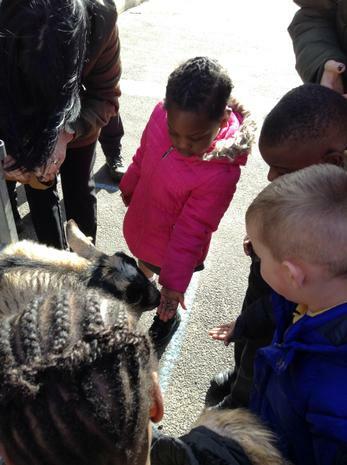 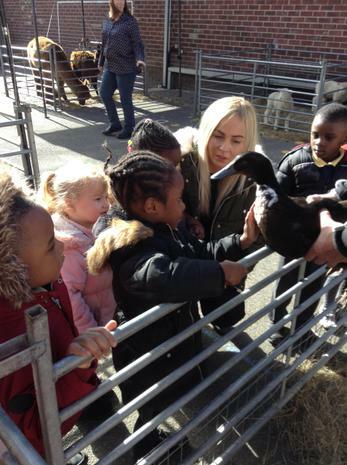 The children loved petting and feeding the animals, and Farmer David shared lots of interesting facts about the animals he brought. 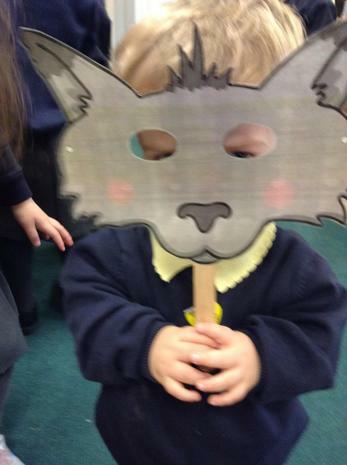 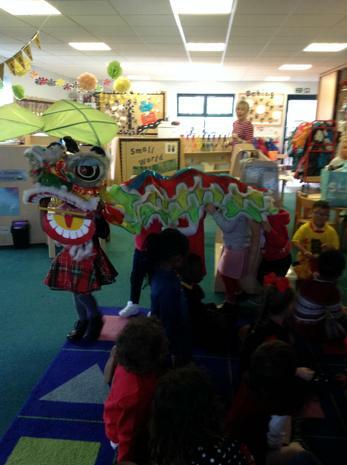 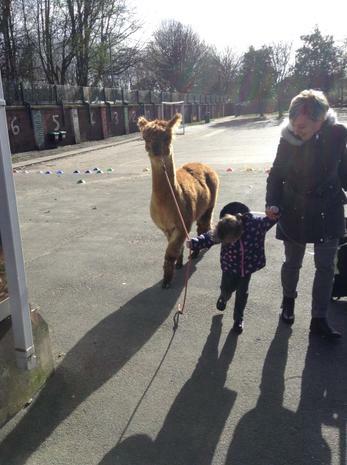 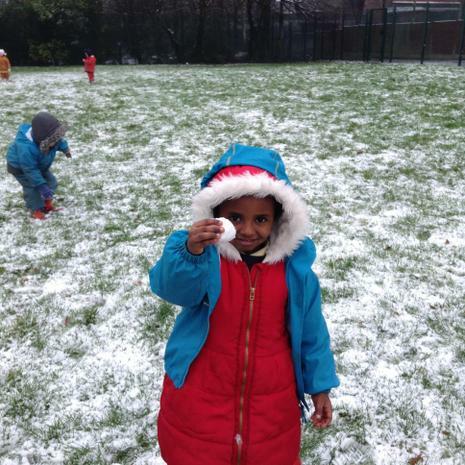 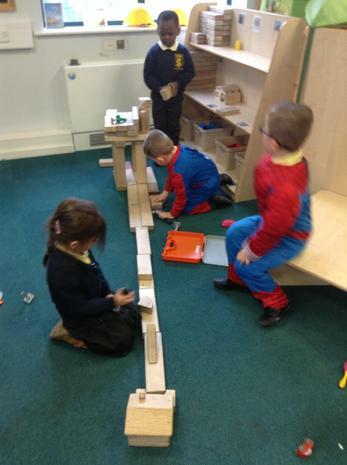 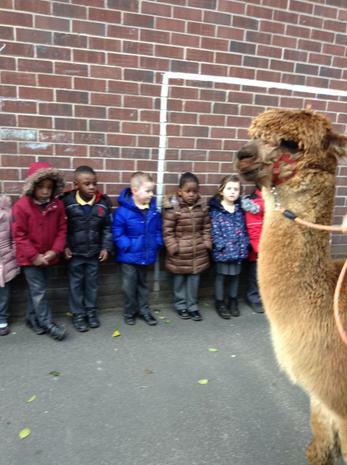 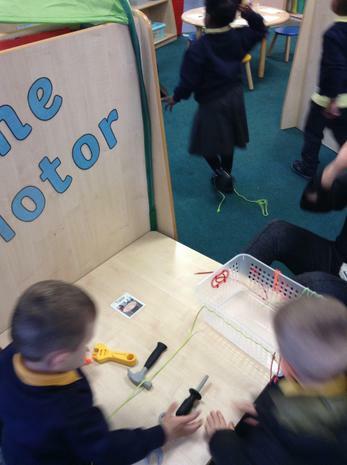 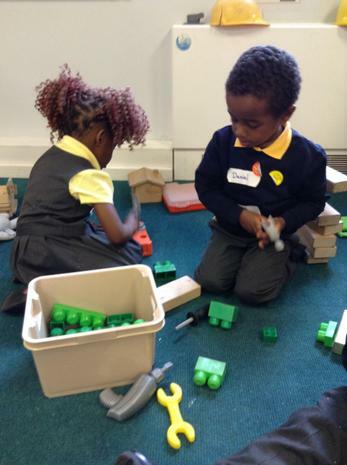 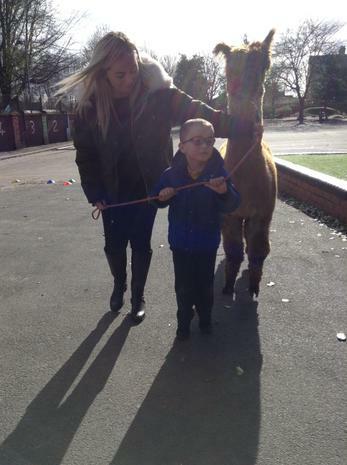 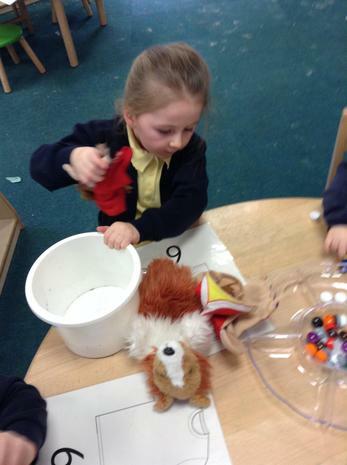 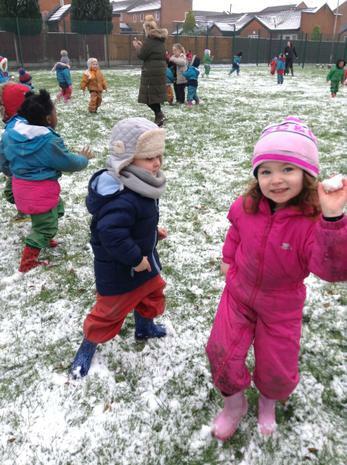 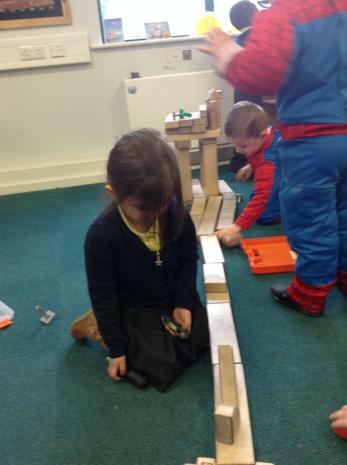 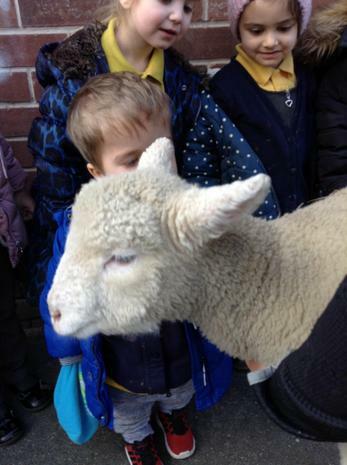 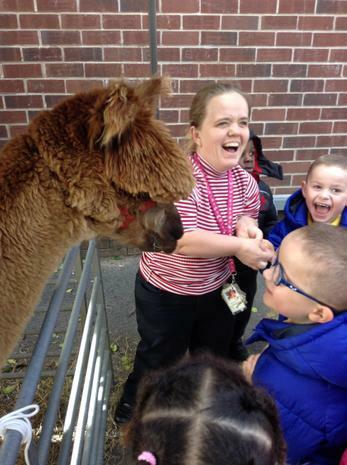 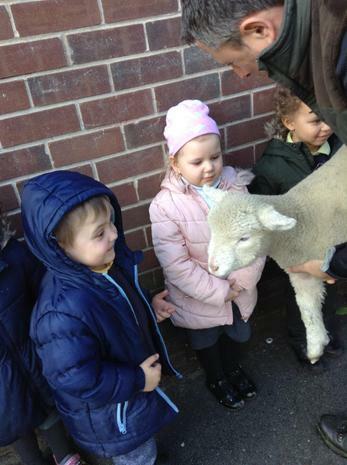 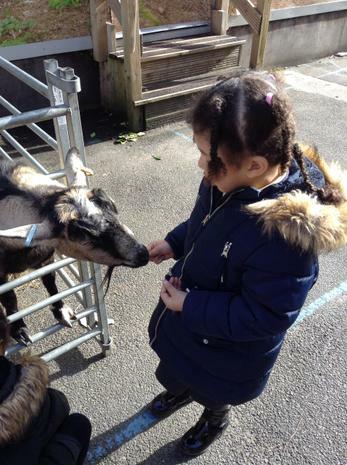 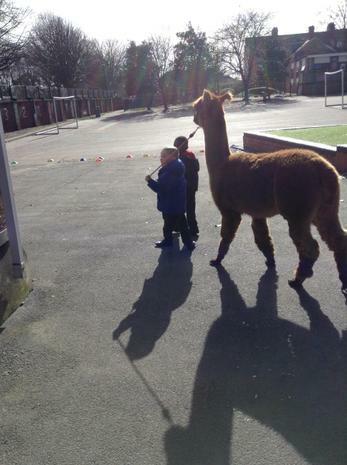 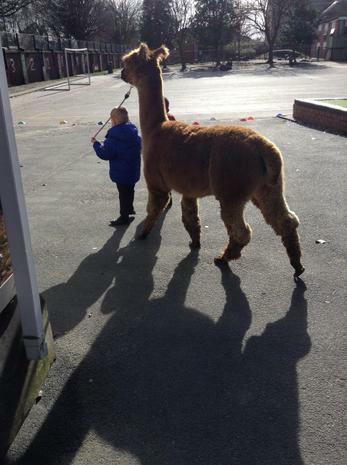 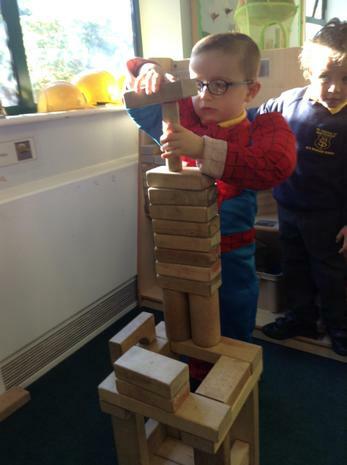 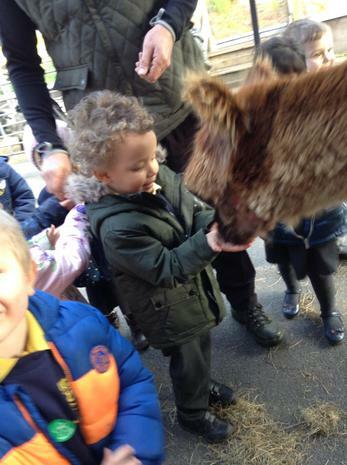 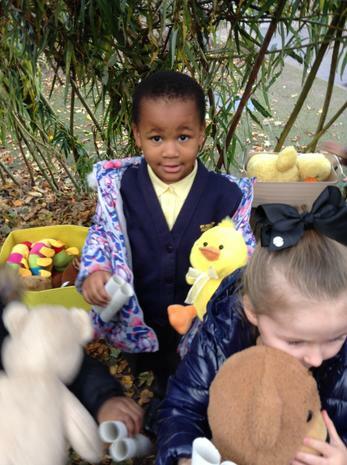 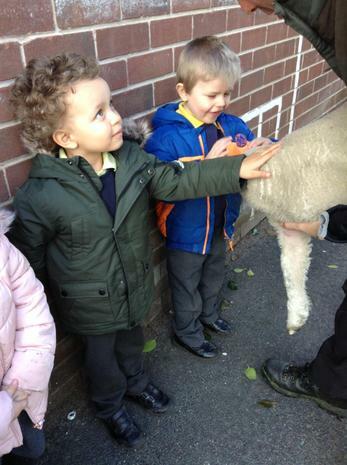 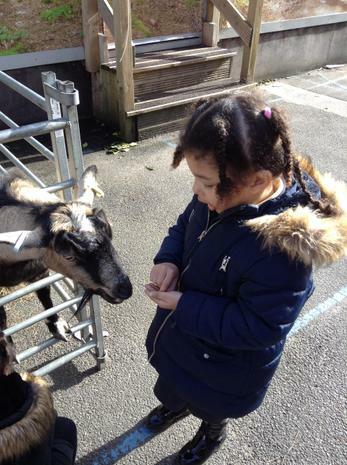 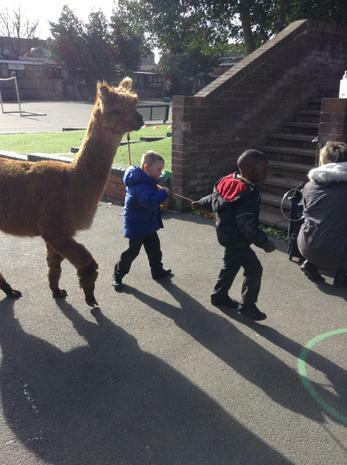 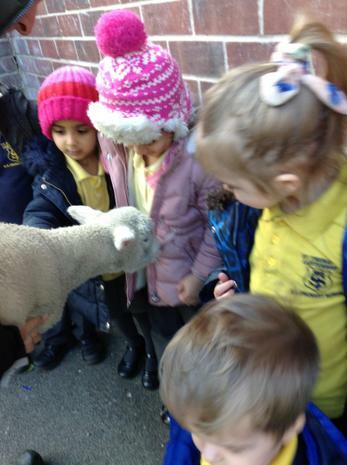 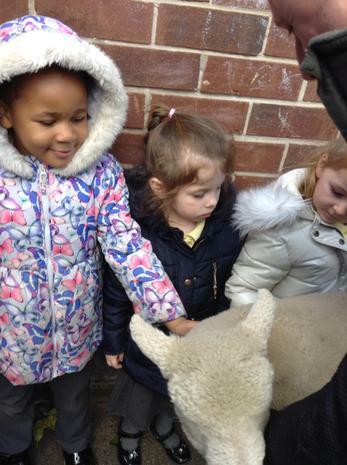 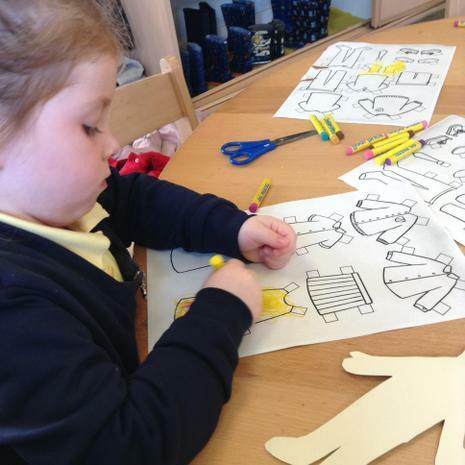 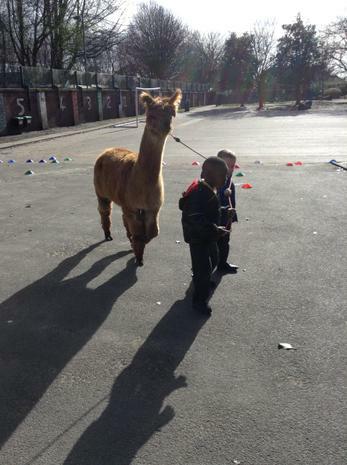 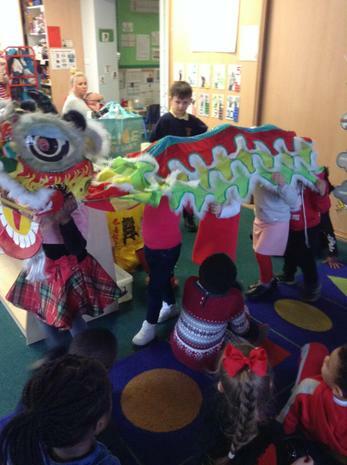 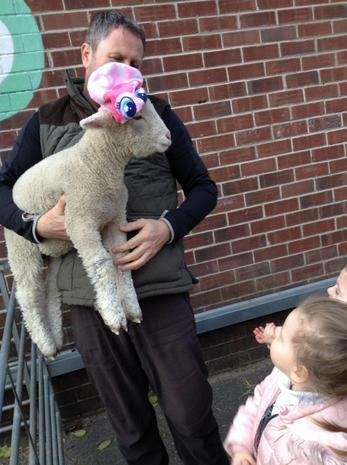 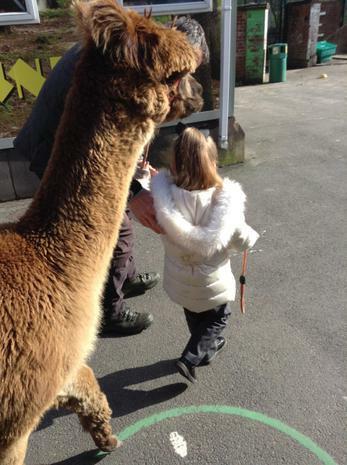 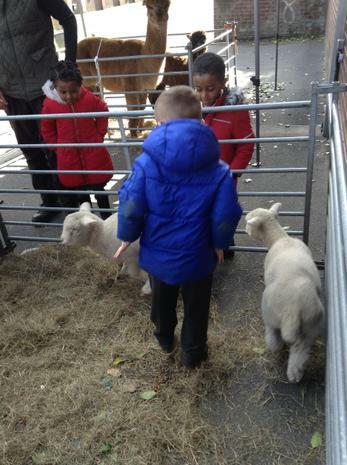 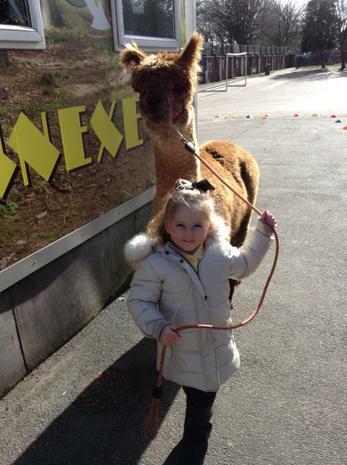 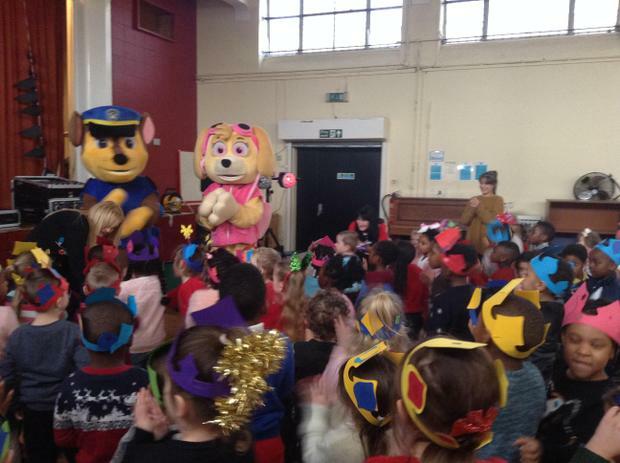 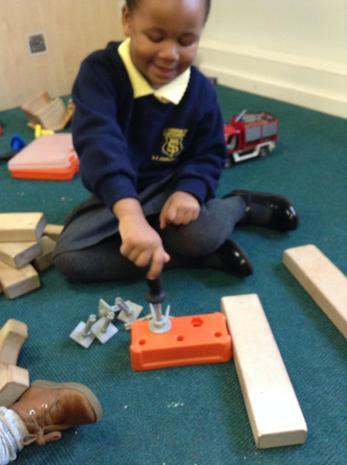 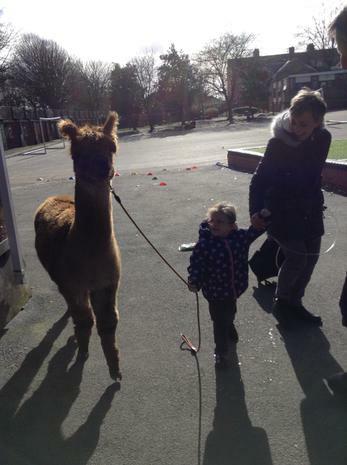 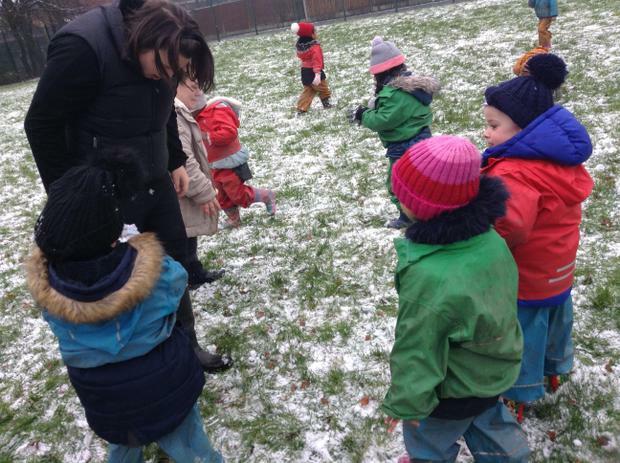 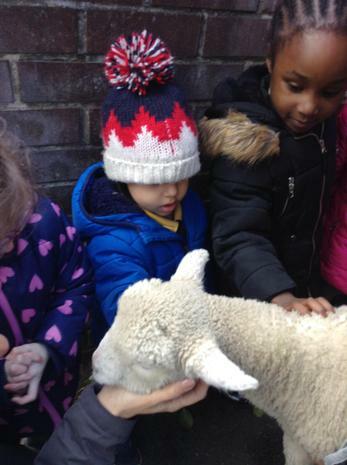 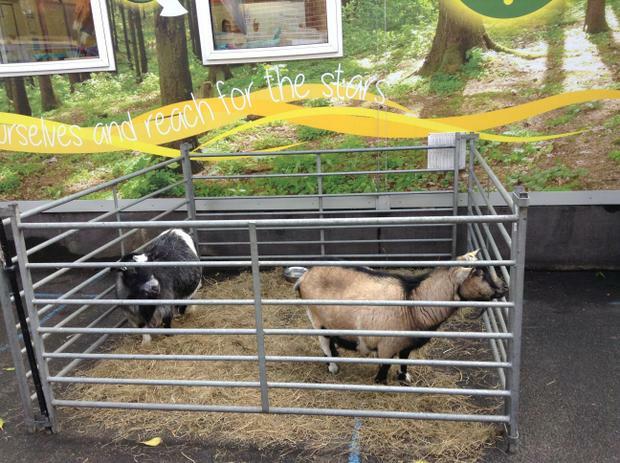 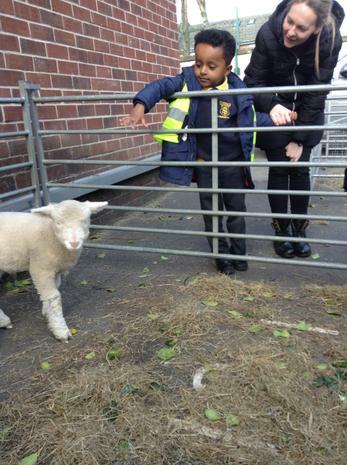 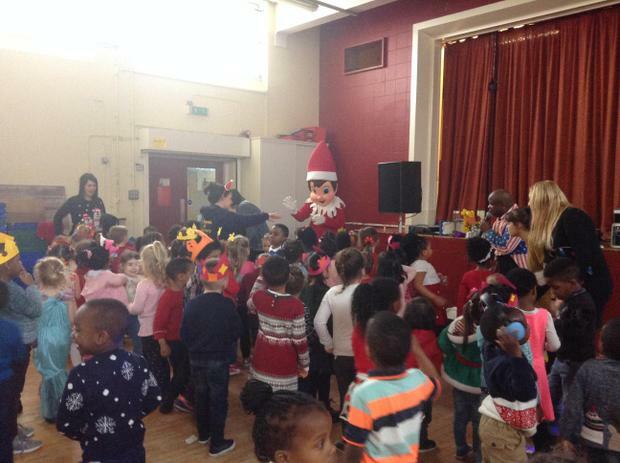 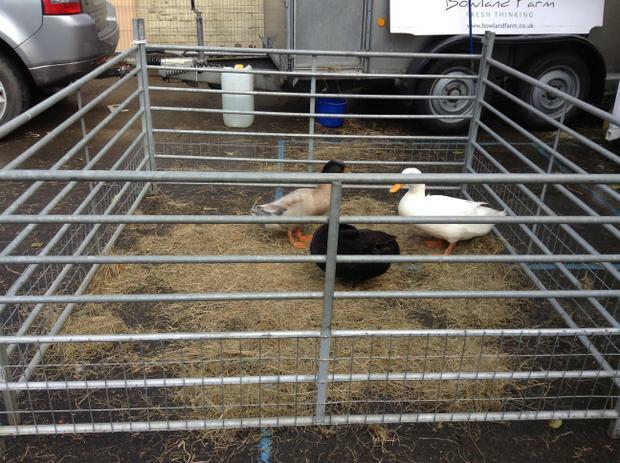 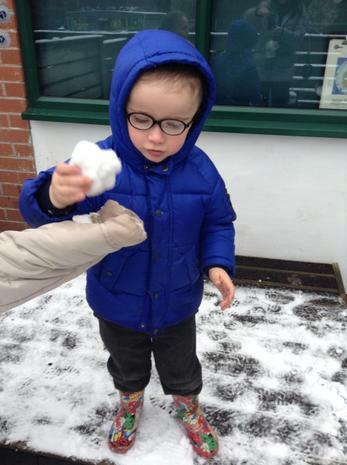 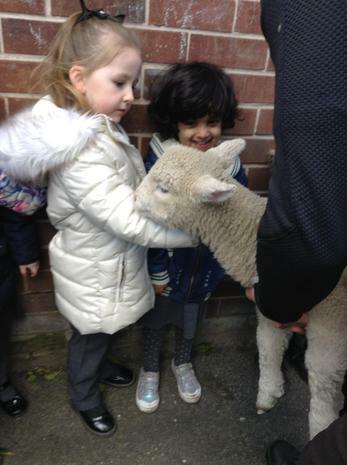 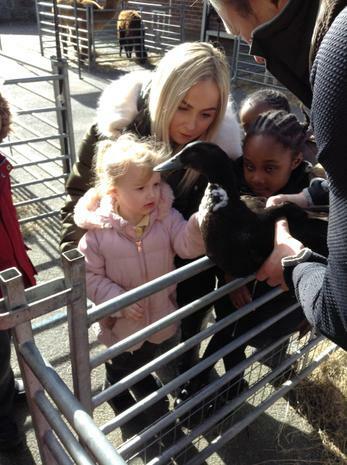 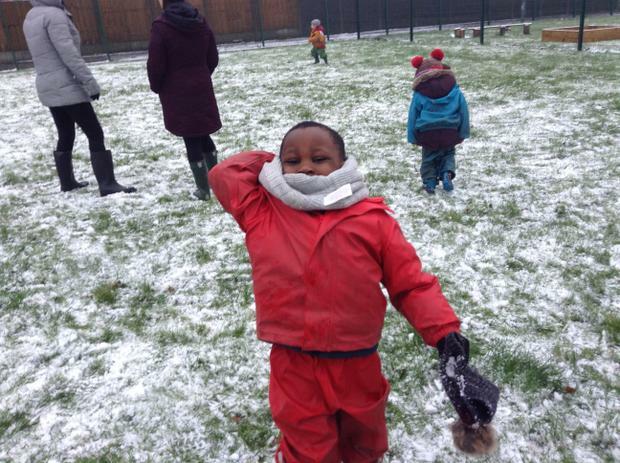 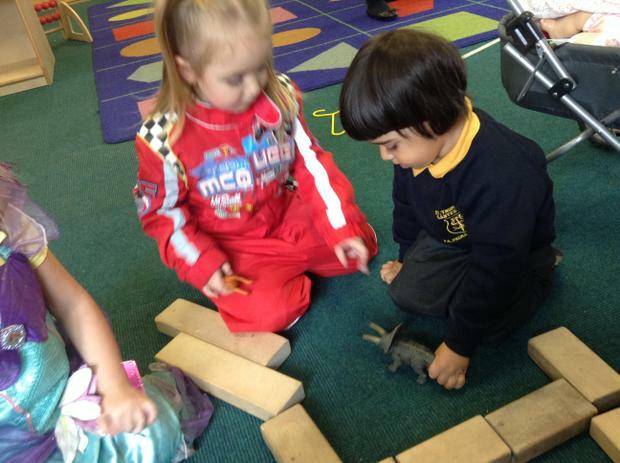 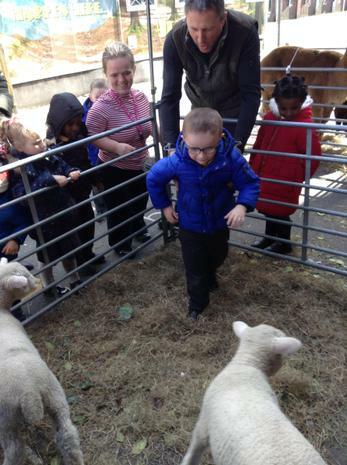 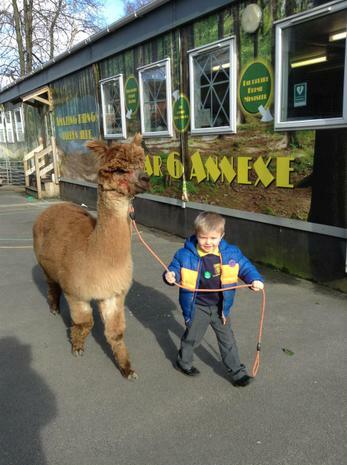 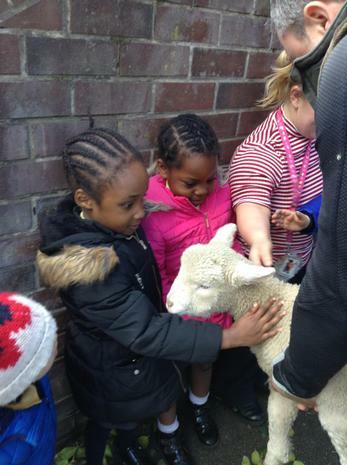 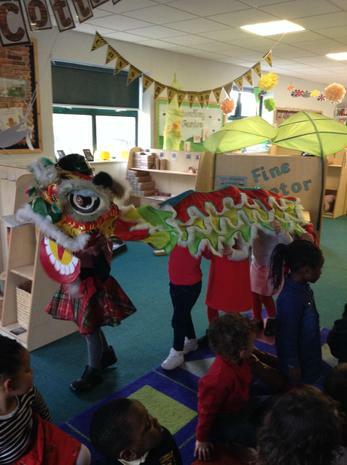 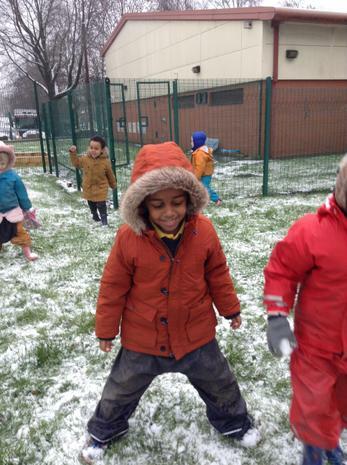 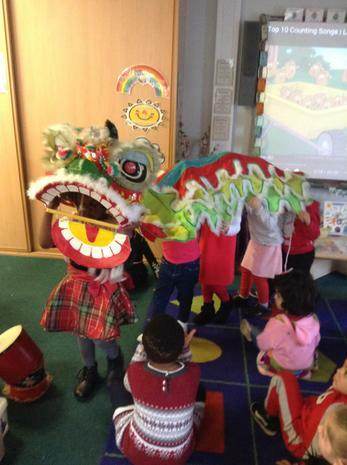 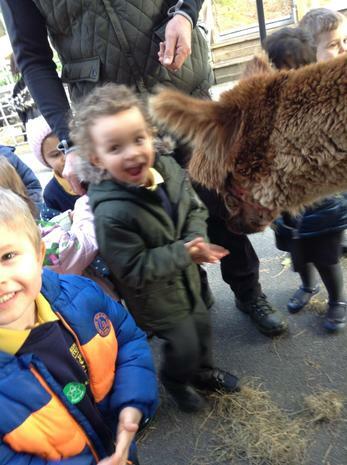 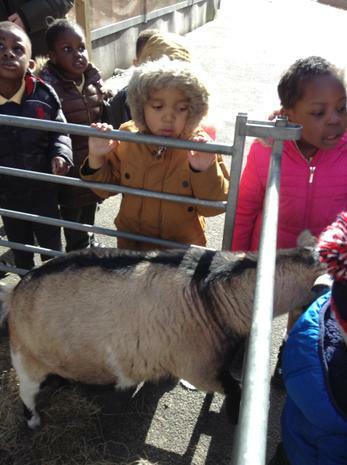 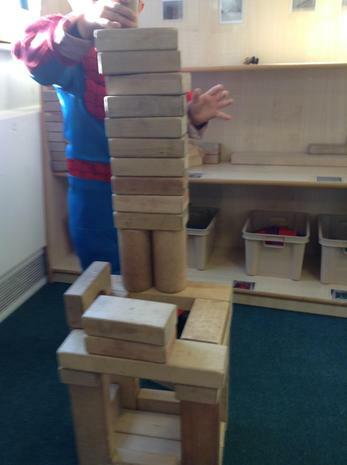 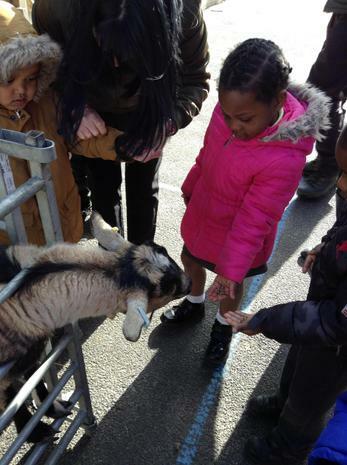 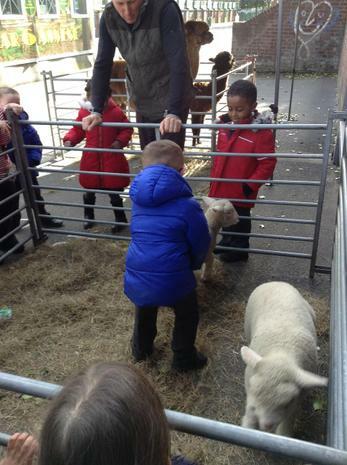 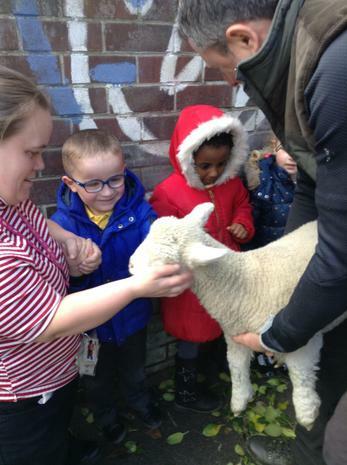 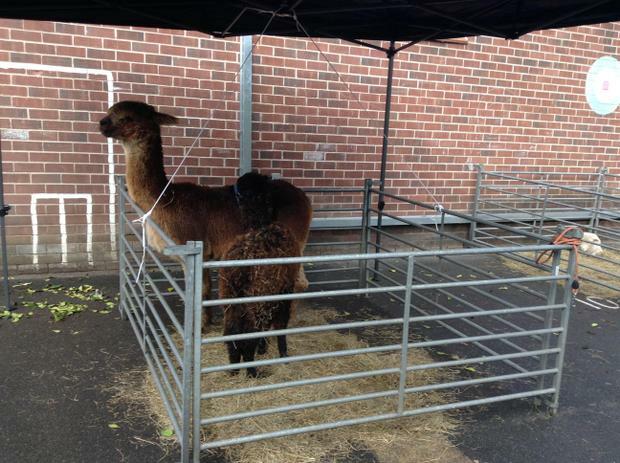 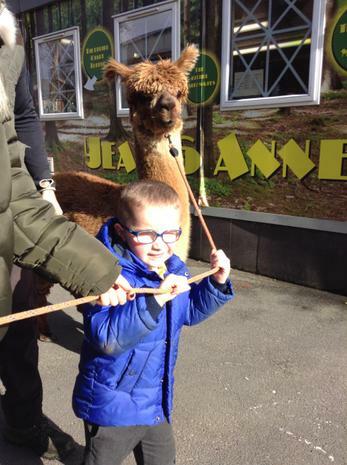 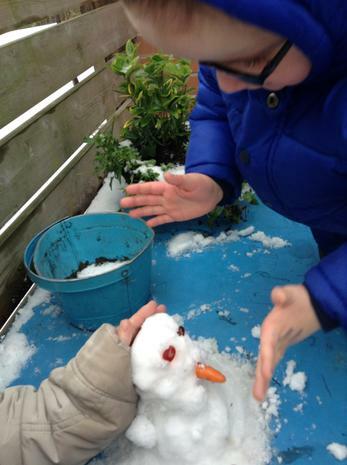 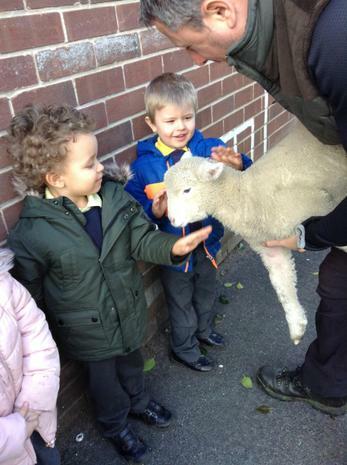 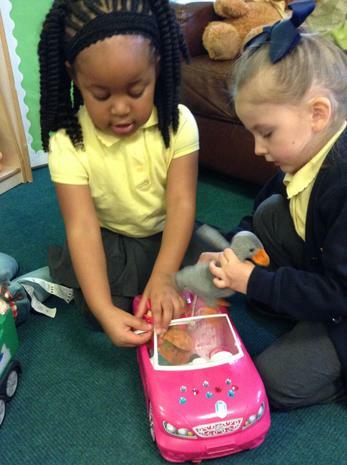 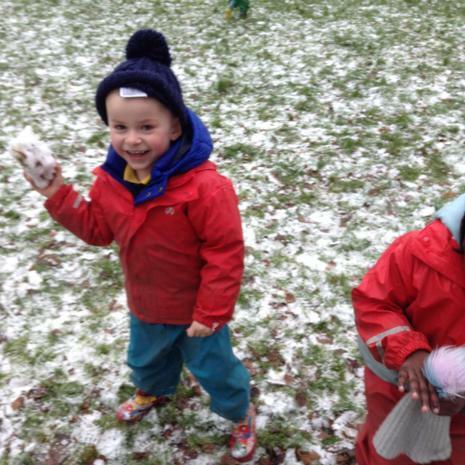 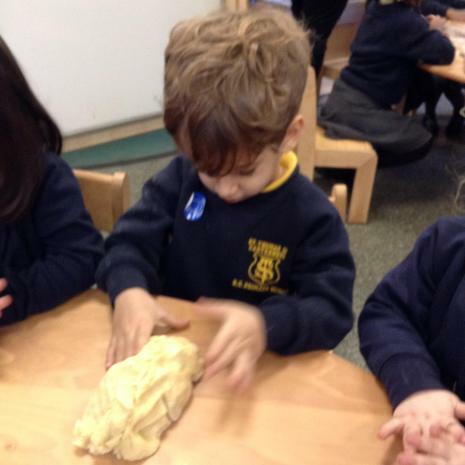 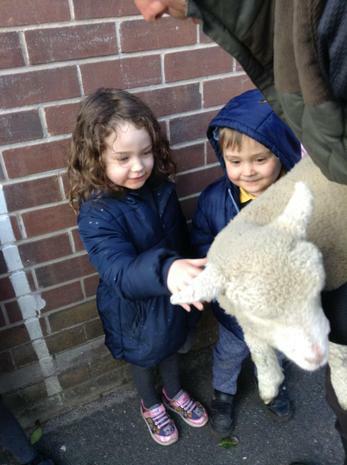 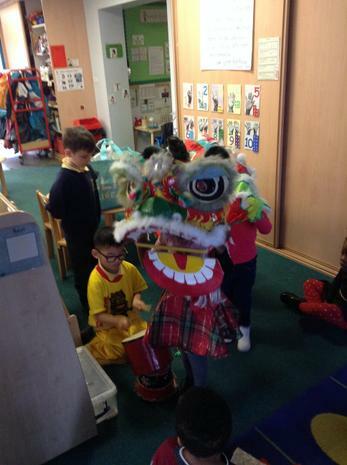 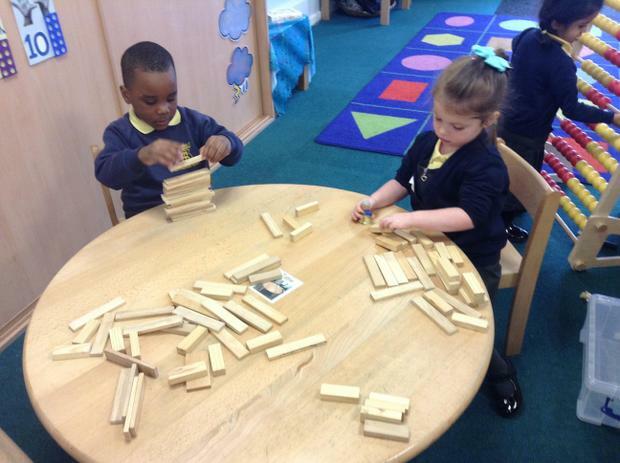 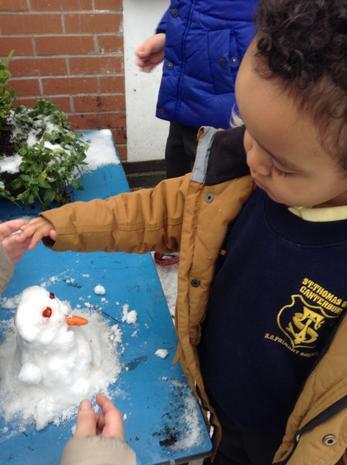 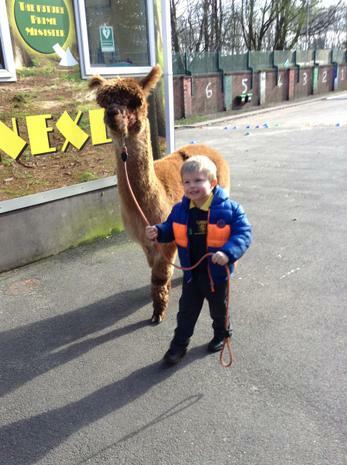 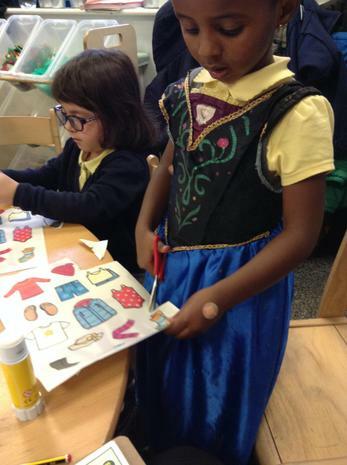 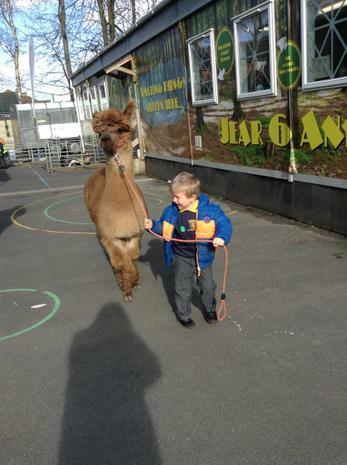 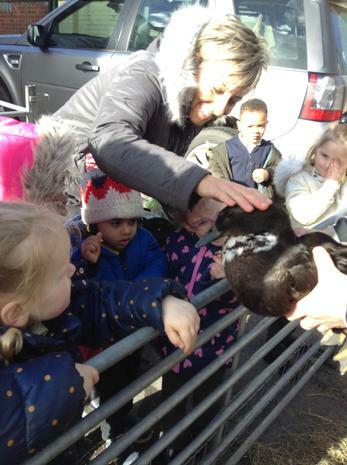 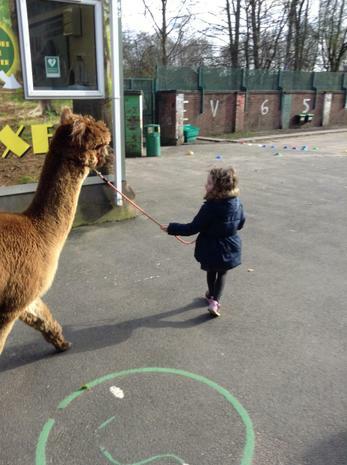 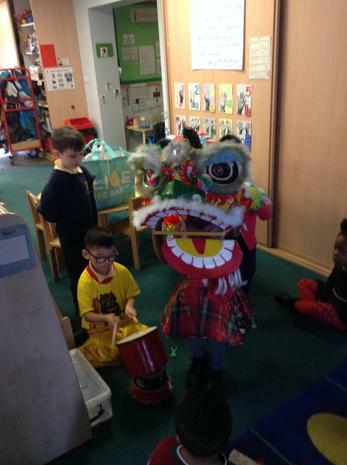 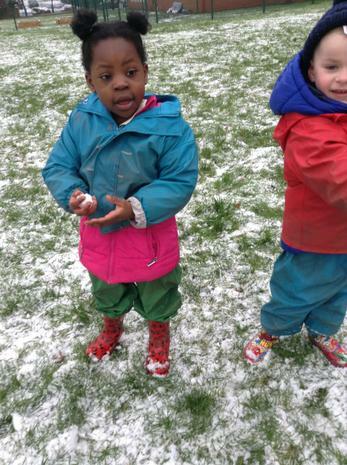 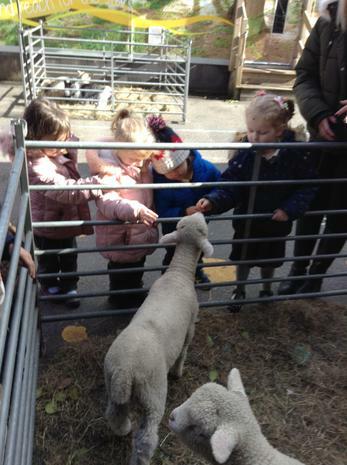 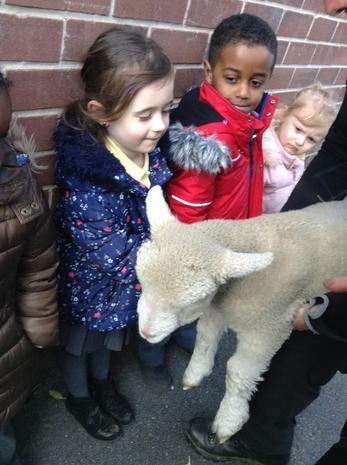 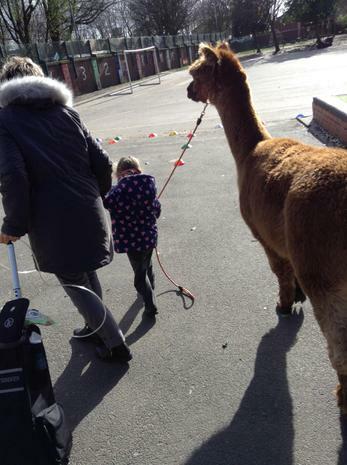 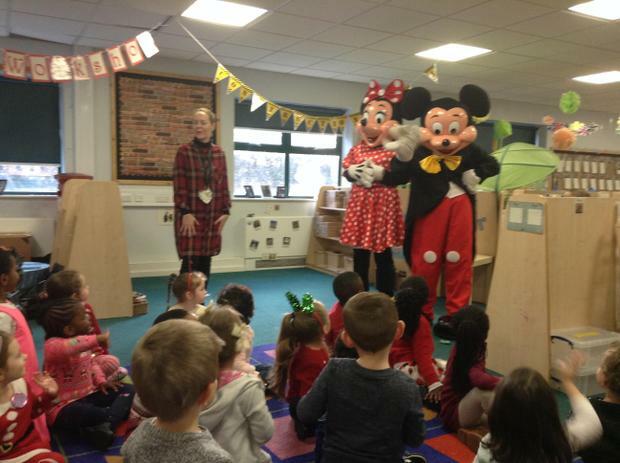 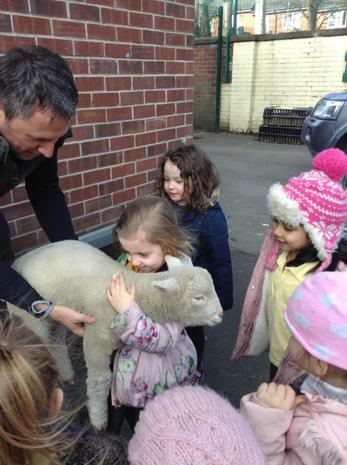 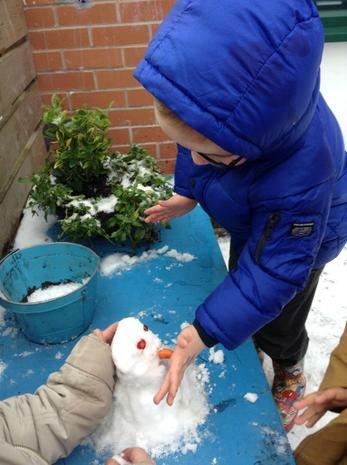 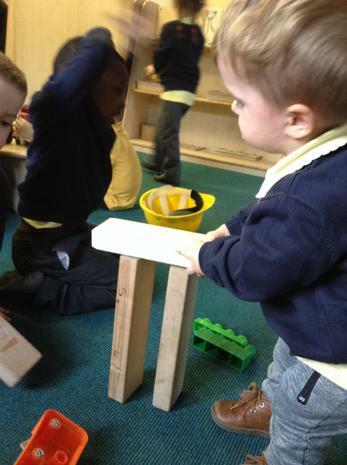 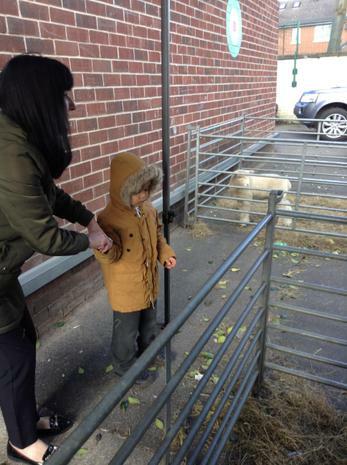 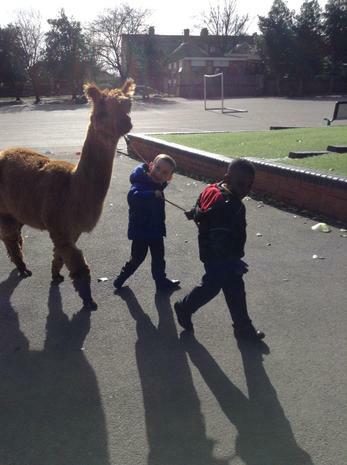 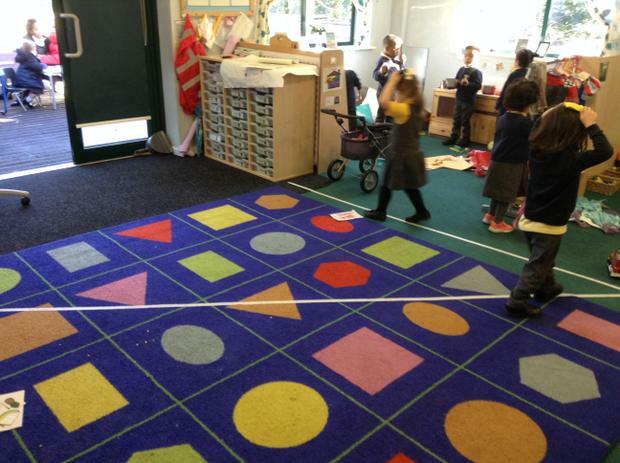 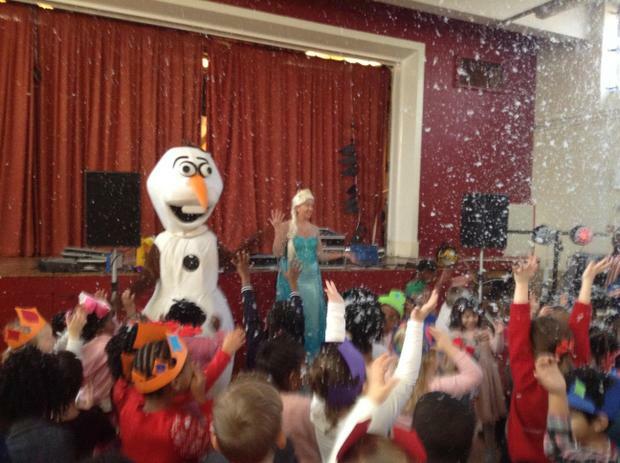 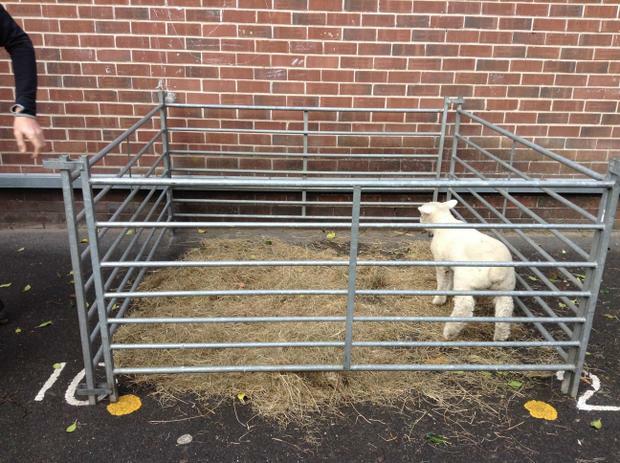 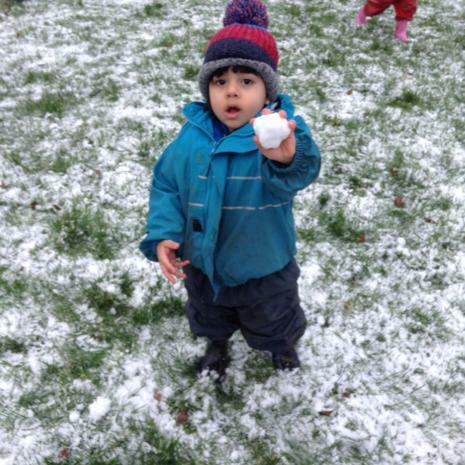 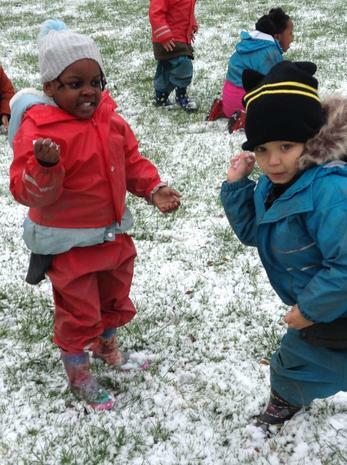 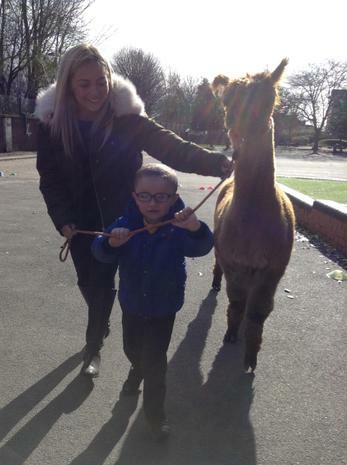 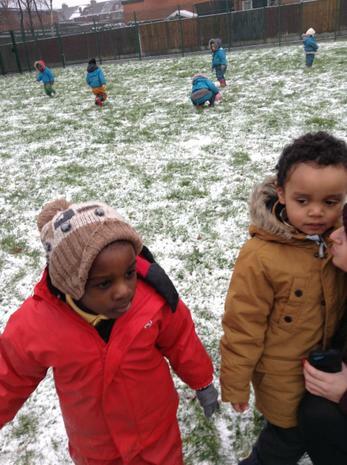 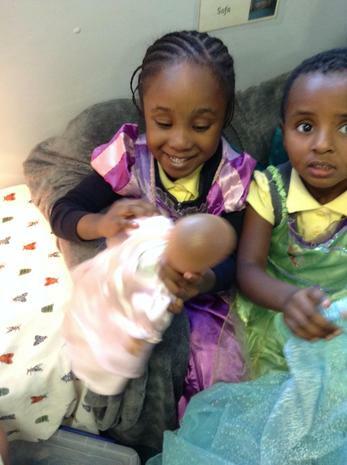 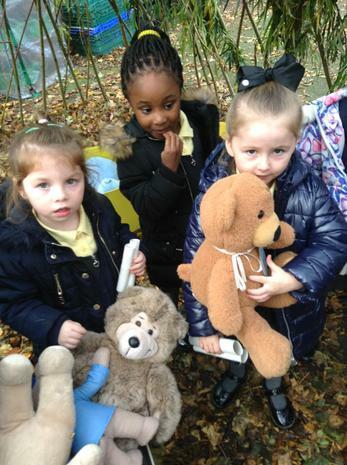 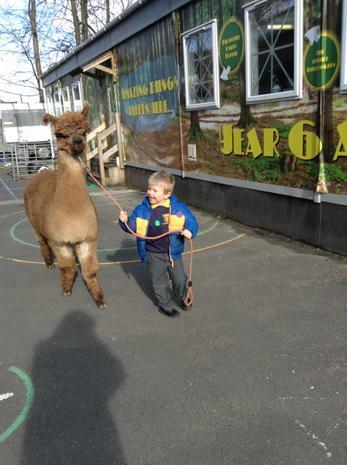 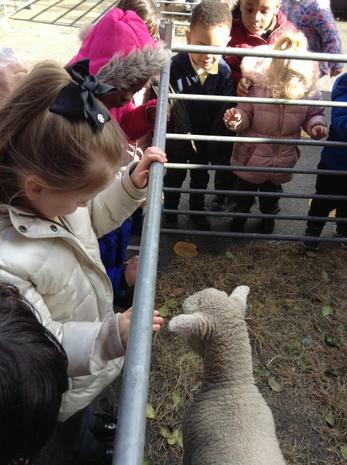 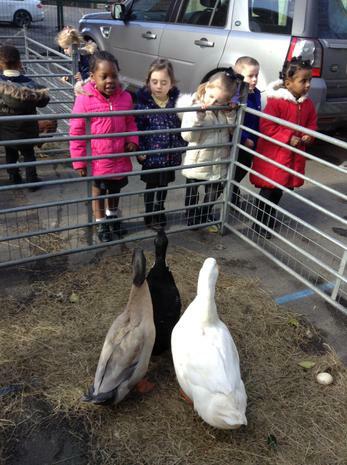 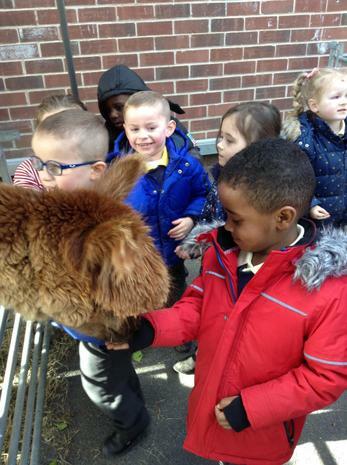 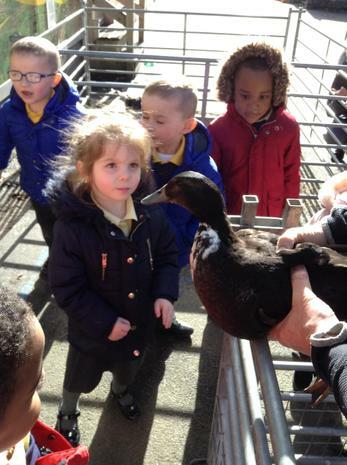 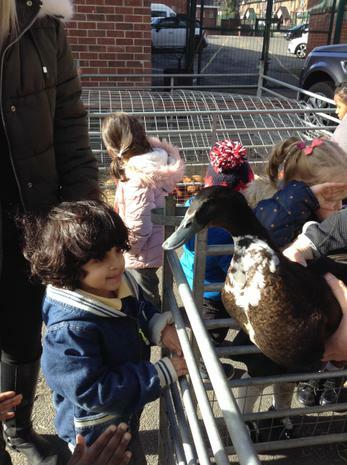 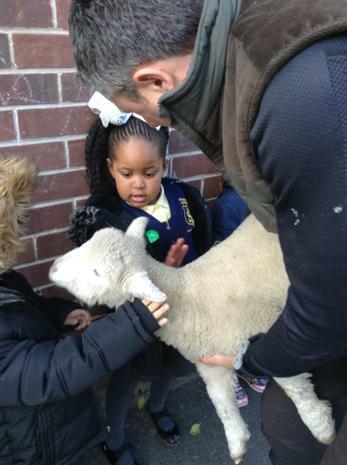 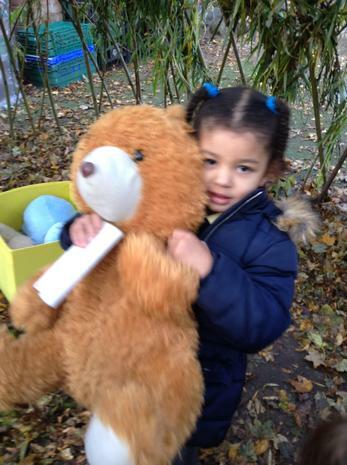 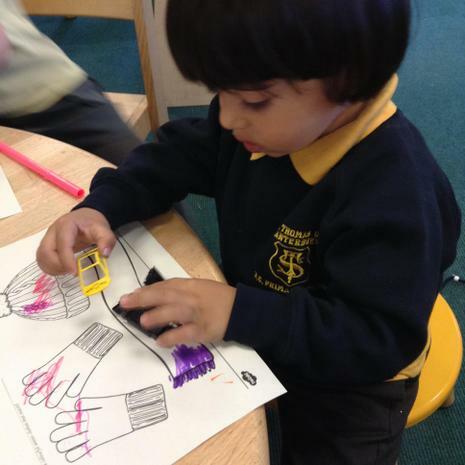 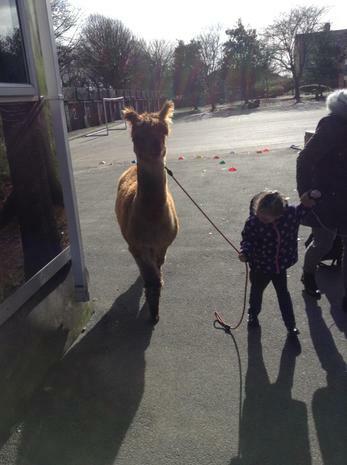 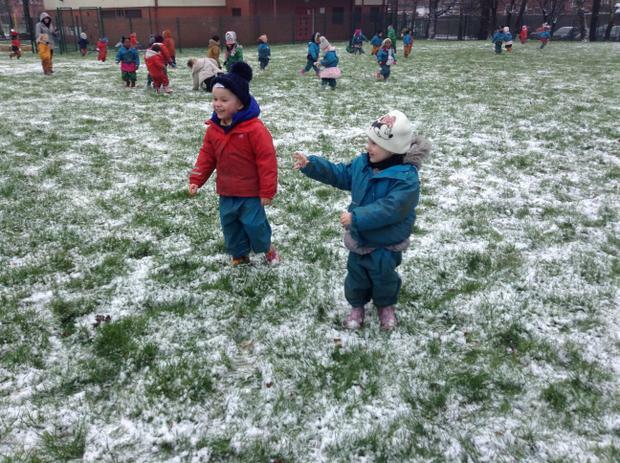 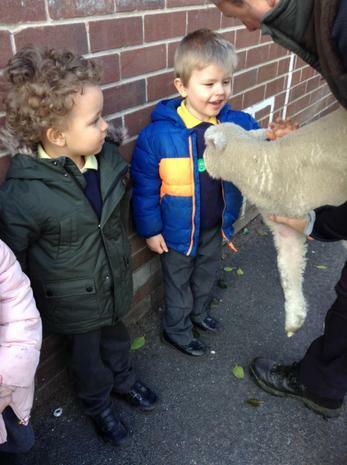 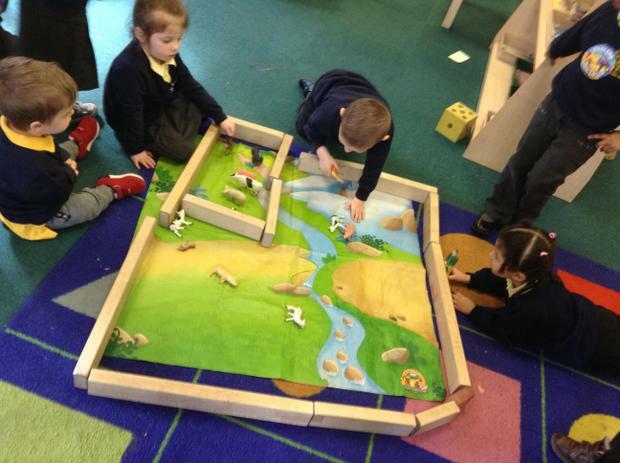 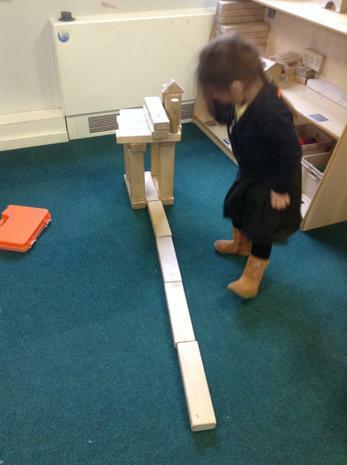 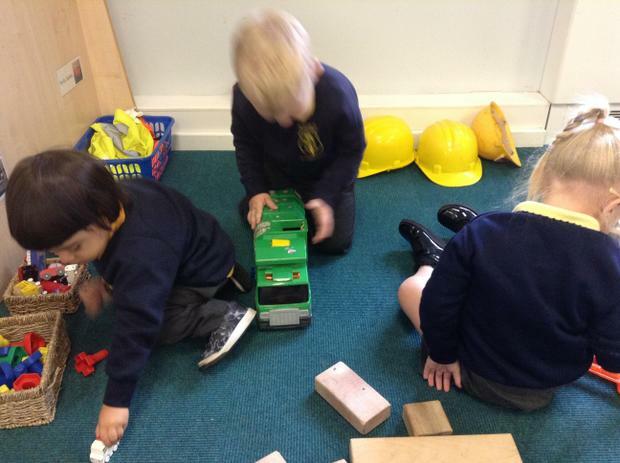 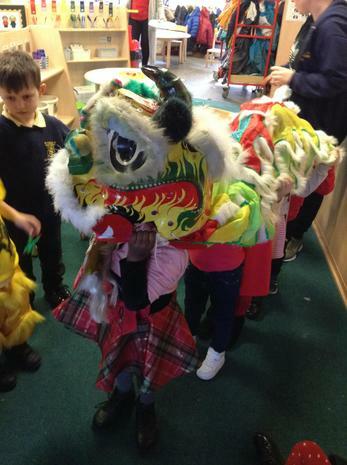 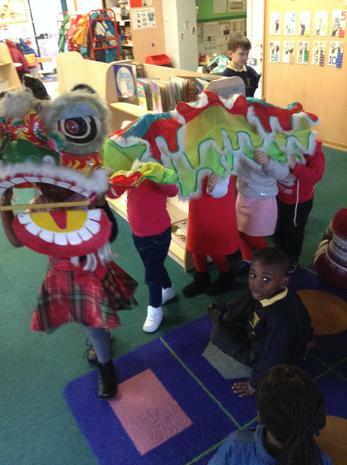 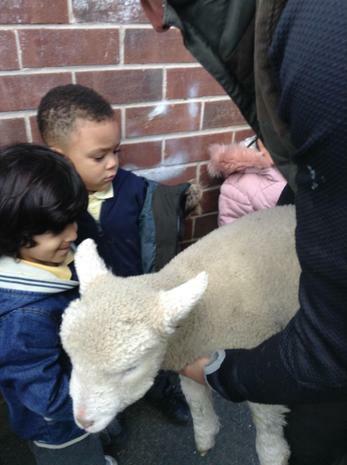 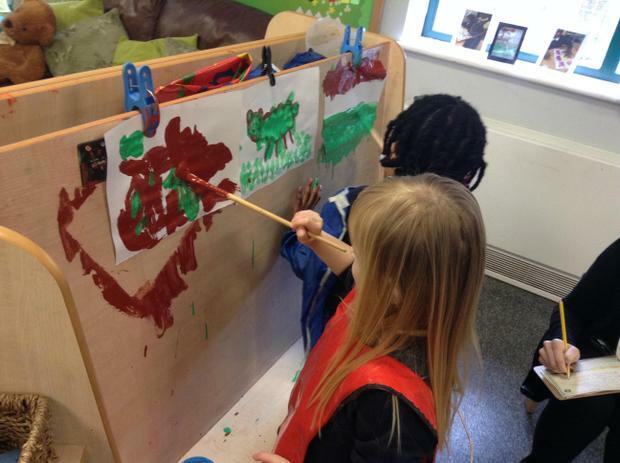 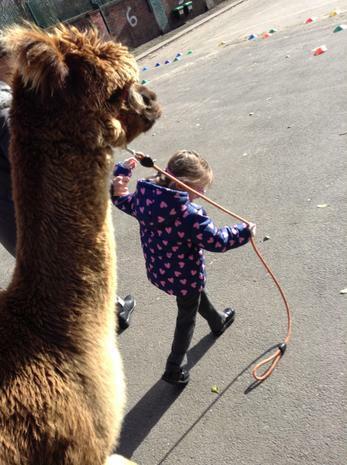 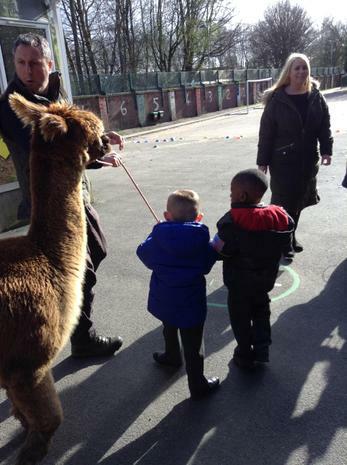 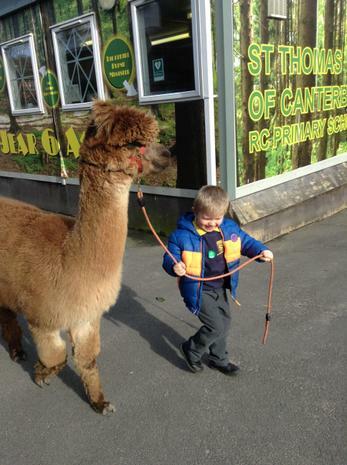 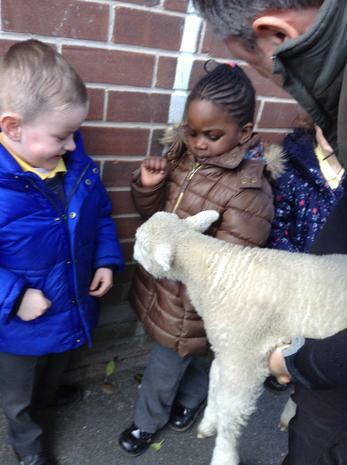 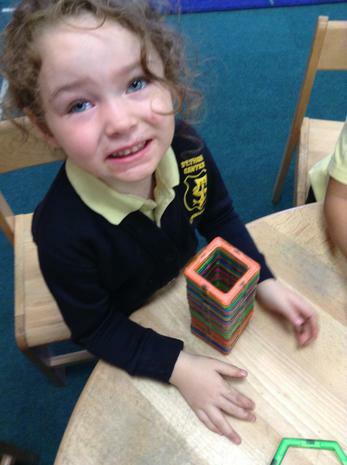 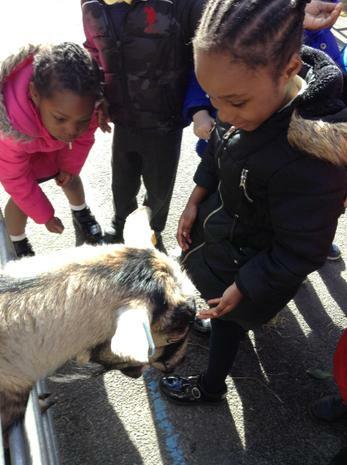 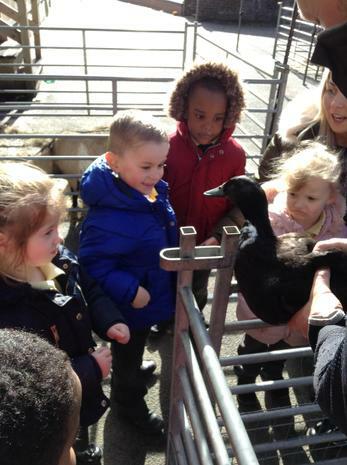 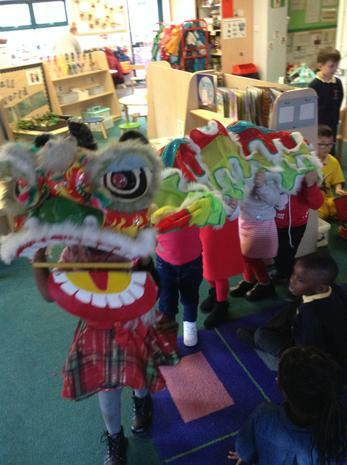 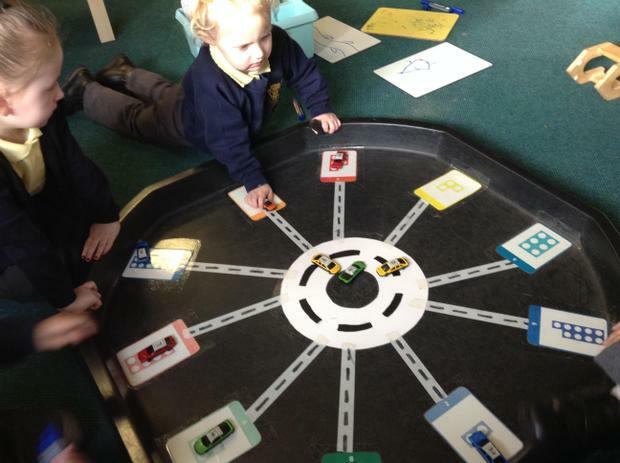 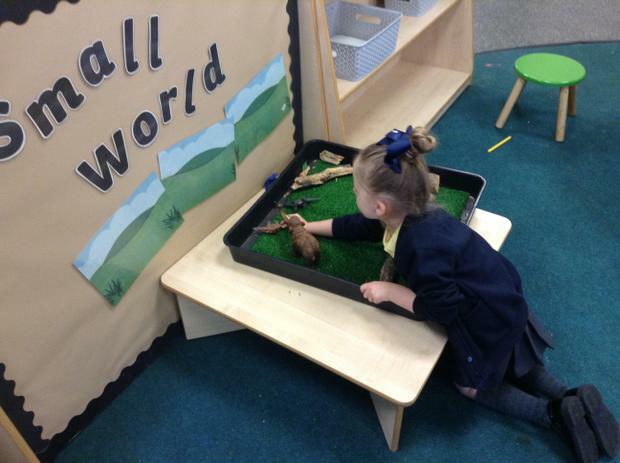 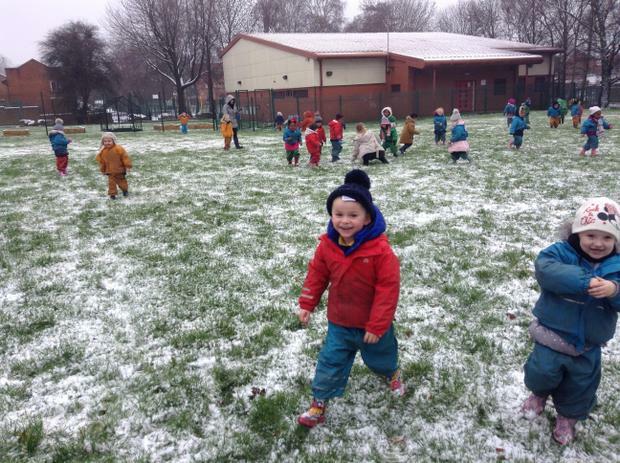 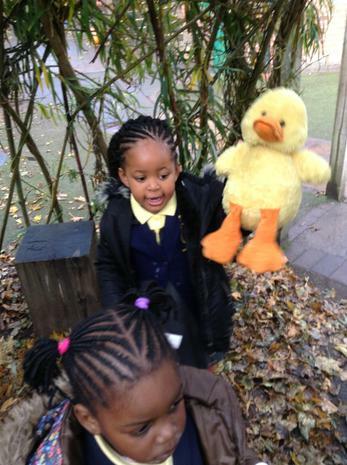 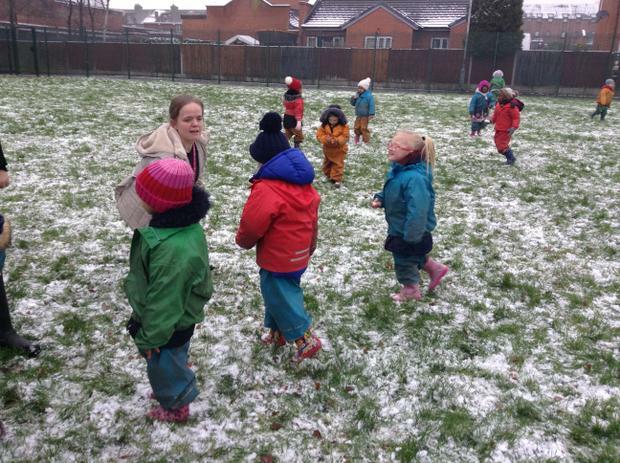 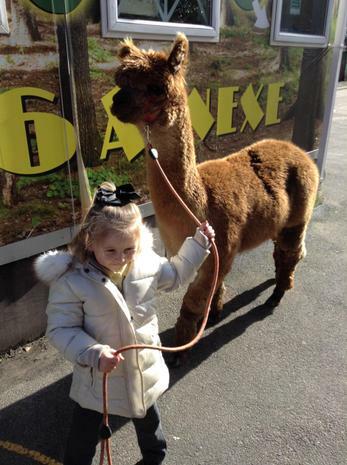 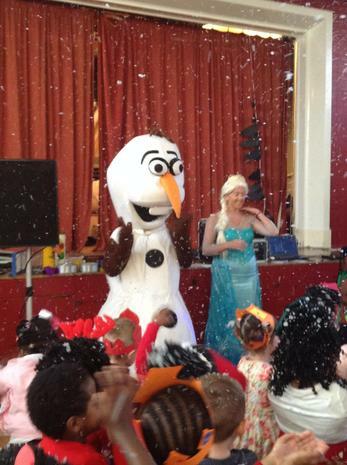 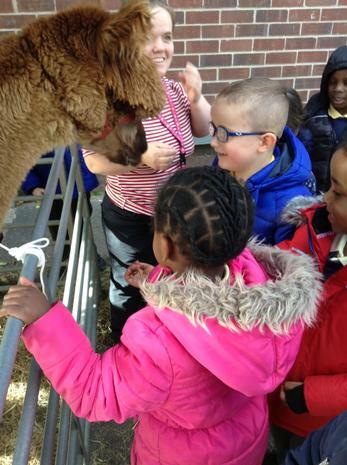 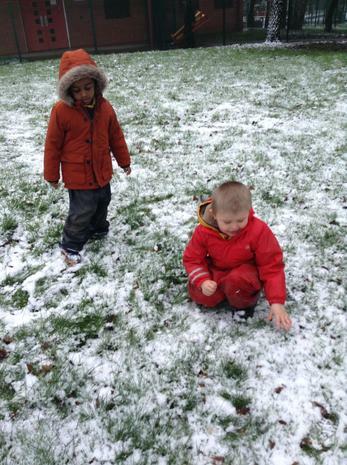 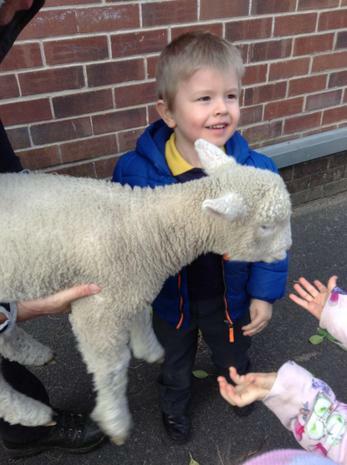 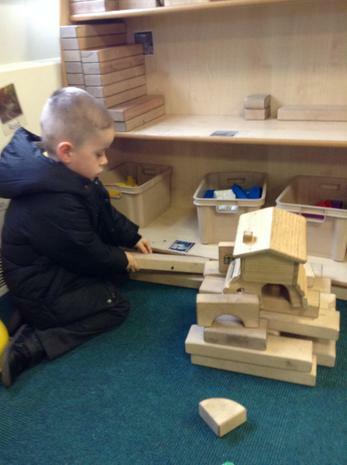 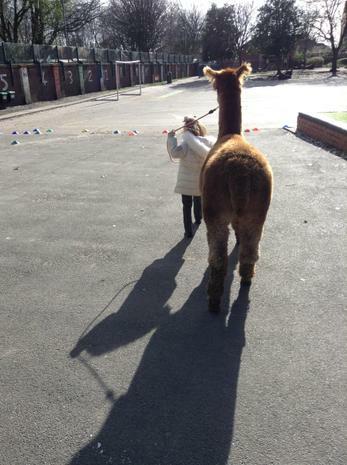 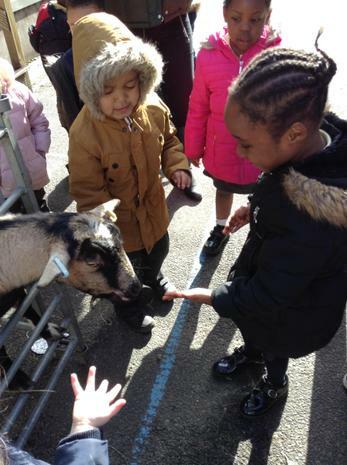 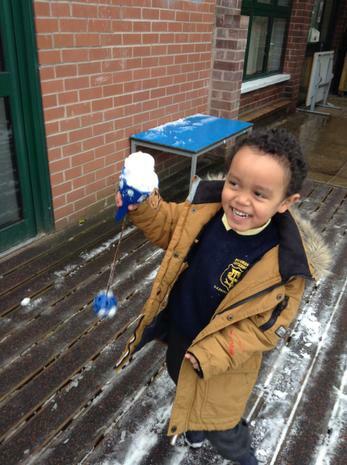 The children arrived in school on Monday to find that there were some new additions to EYFS! 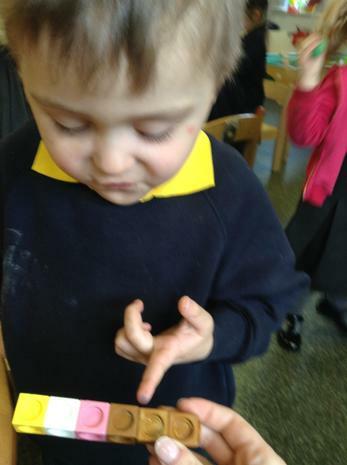 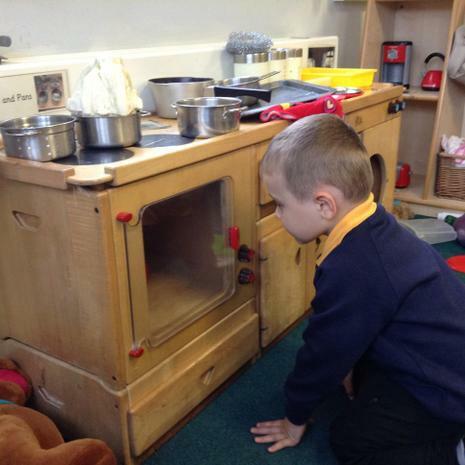 Whilst the children waited patiently for the chicks to hatch, we learnt all about how to care for the baby chicks. 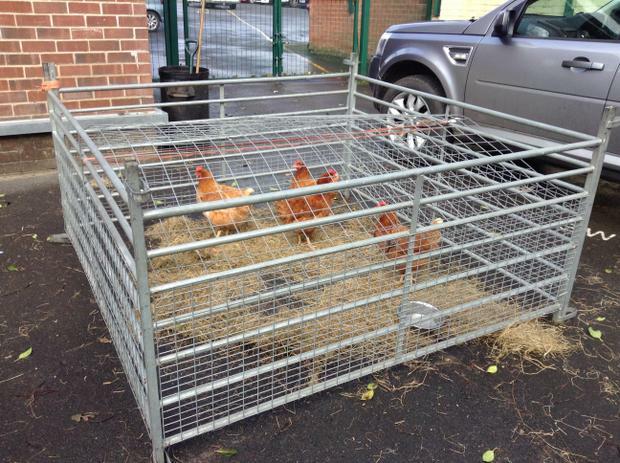 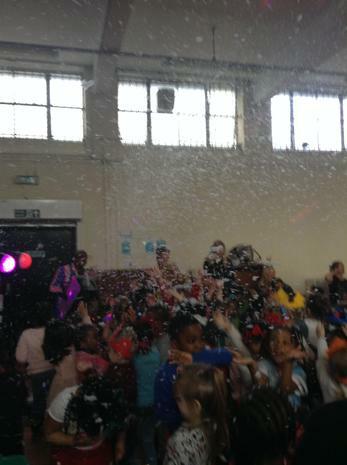 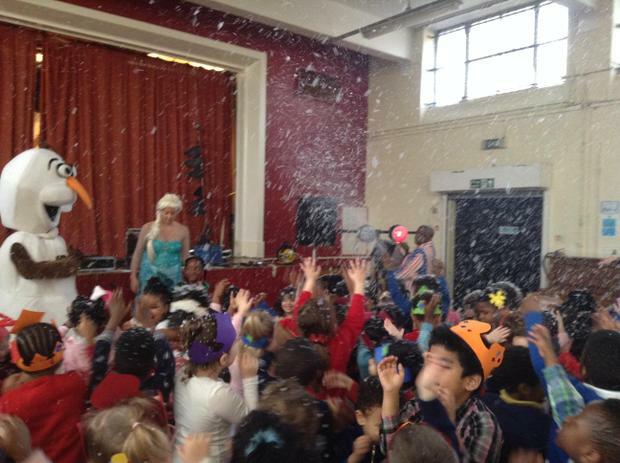 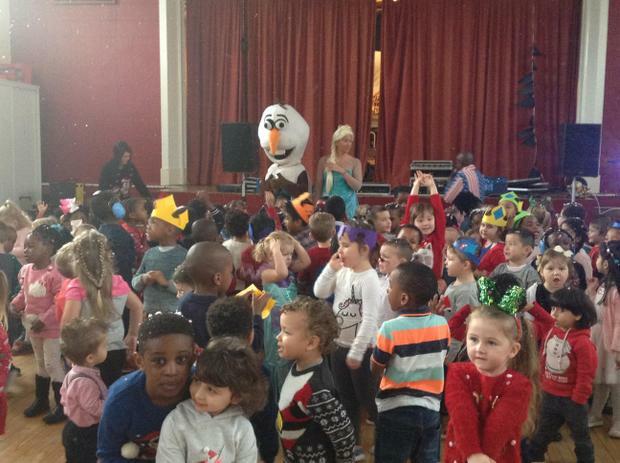 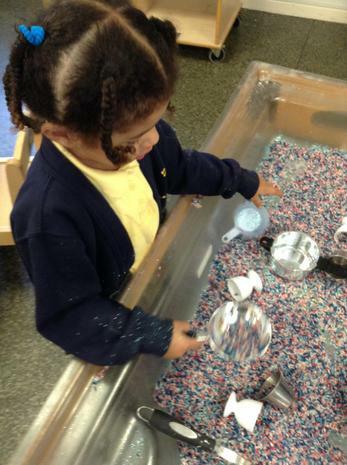 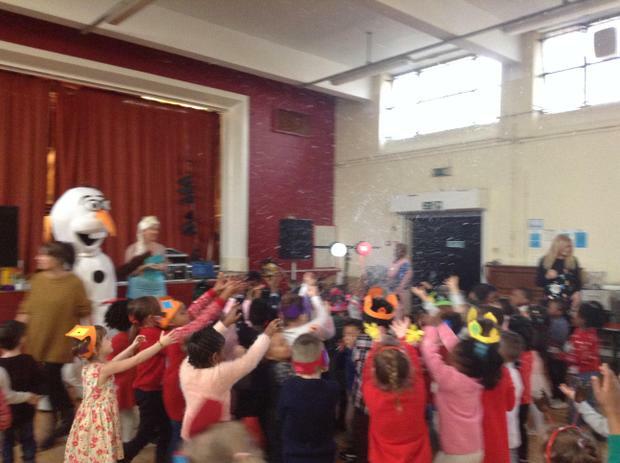 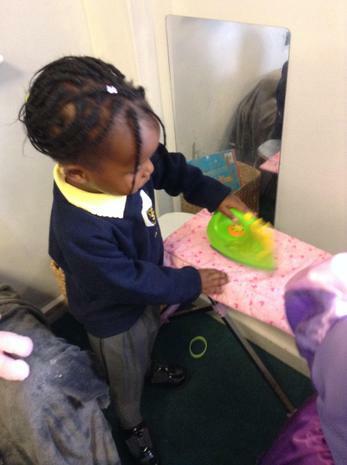 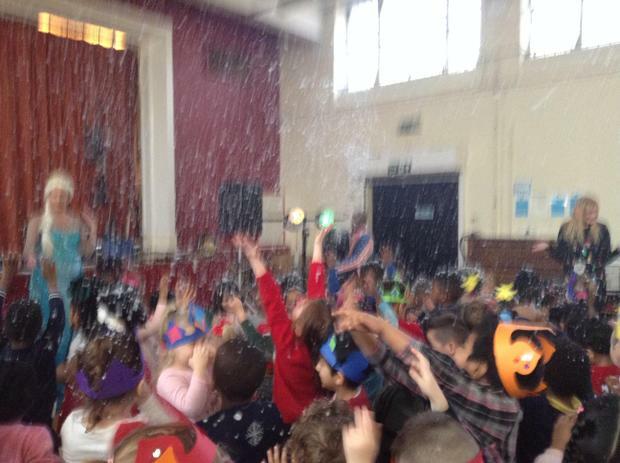 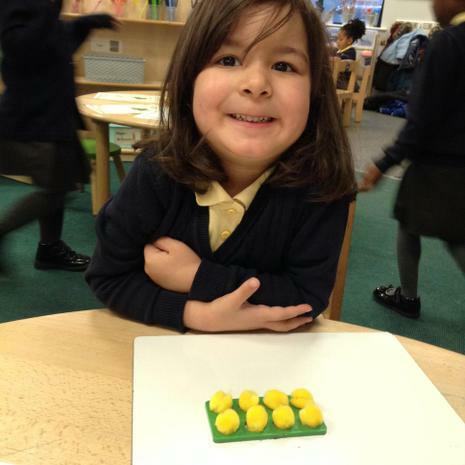 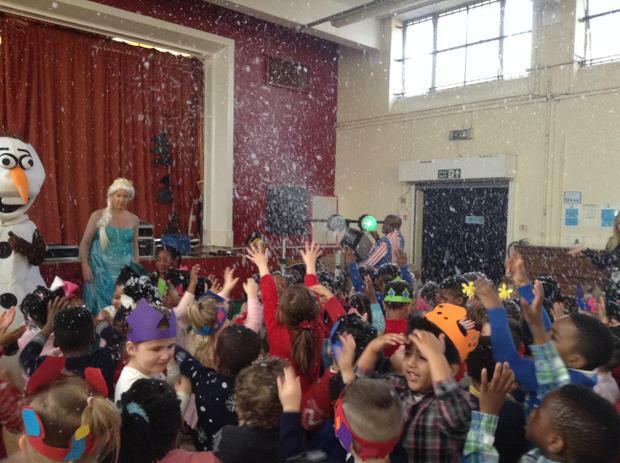 On Wednesday morning, the children arrived in school amazed that ALL of the chicks had hatched during the night! 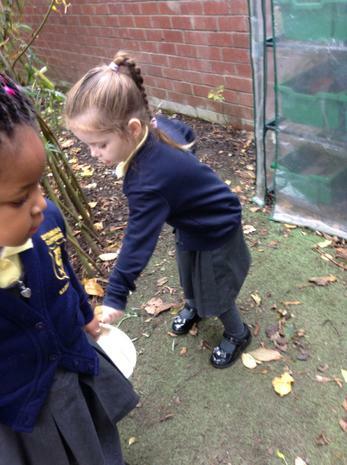 After the chicks had dried off, we spent time gently caring for our new little friends. 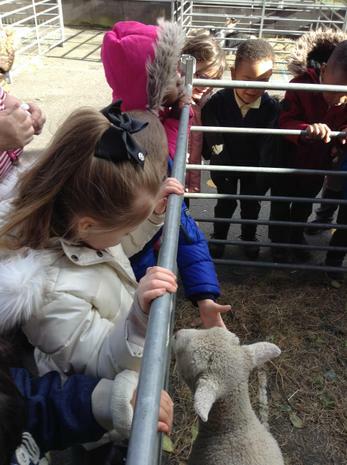 We can't wait to see them grow over the next week. 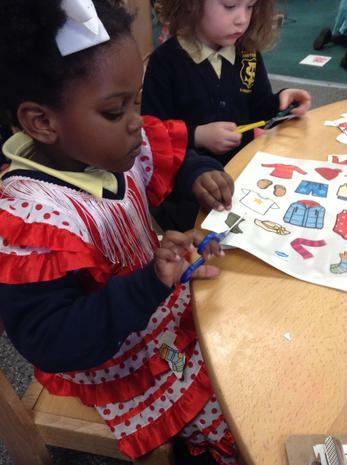 Our topic this term is traditional tales! 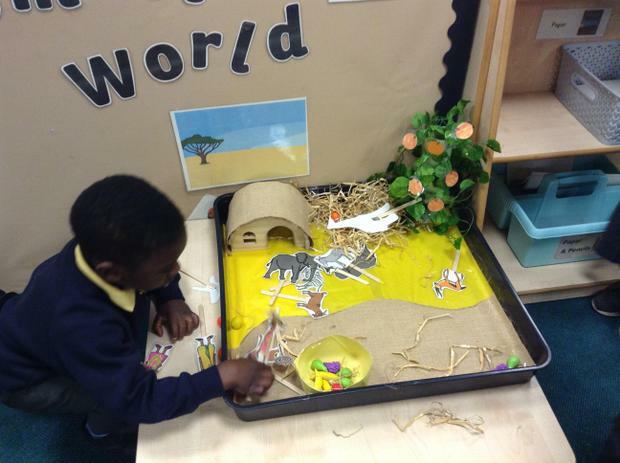 The children were very excited to bring these familiar stories to life in our classroom, particularly in our Storyteller's Cottage. 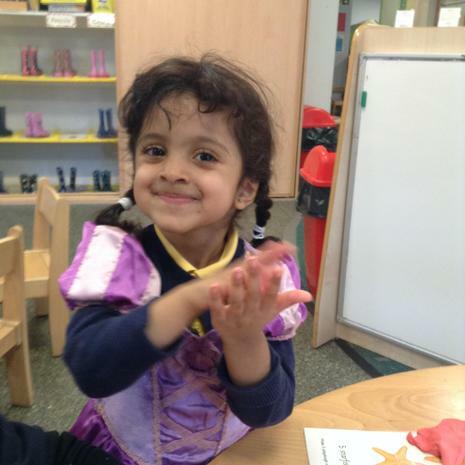 The children have LOVED retelling their favourite stories whilst the adults scribed for them, they have even begun to tell their own stories! 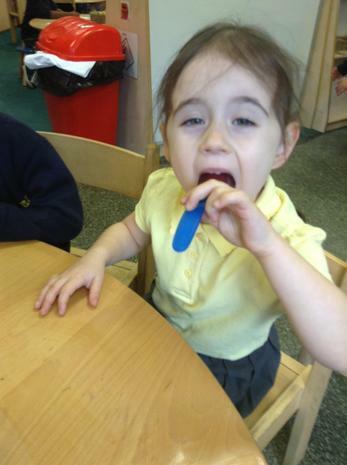 See if your child can orally retell one of the stories pictured below. 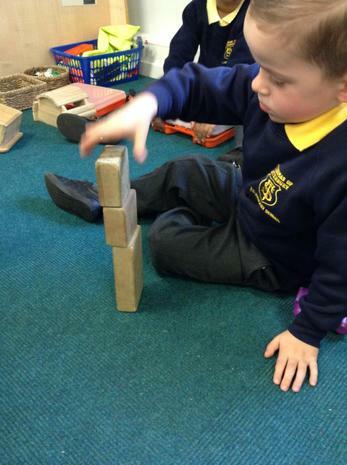 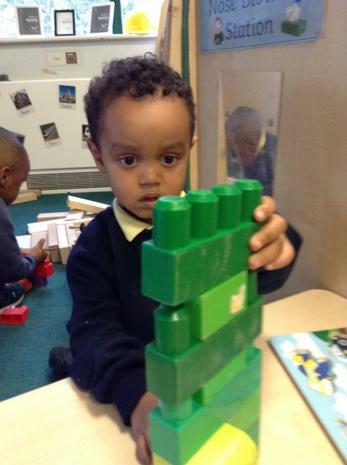 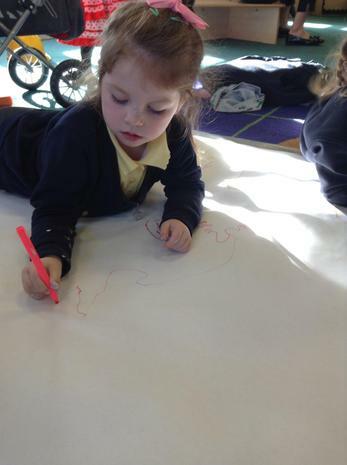 This week we have been look at Jack and the Beanstalk. 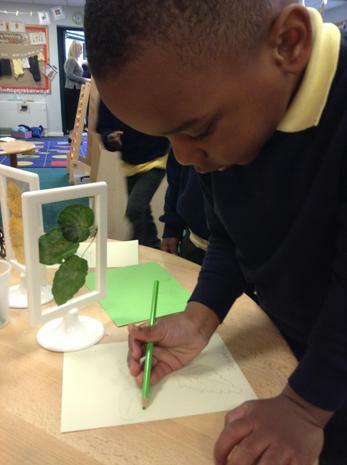 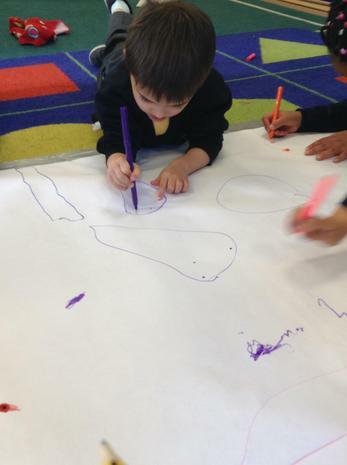 Later in the week we were surprised to find a letter from the Giant asking us to plant some more magic beans, so that we could help him to find his magic harp and special hen. 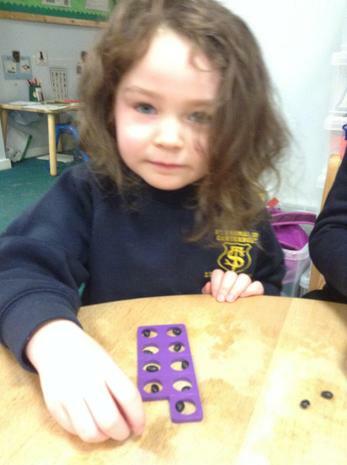 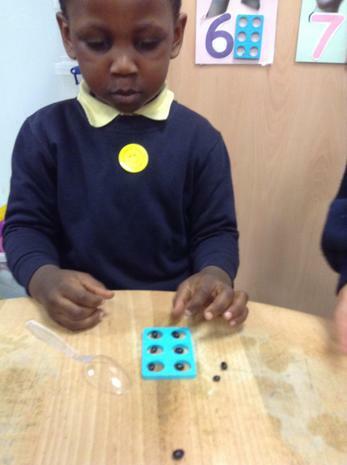 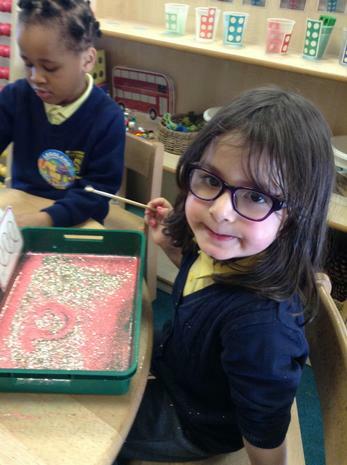 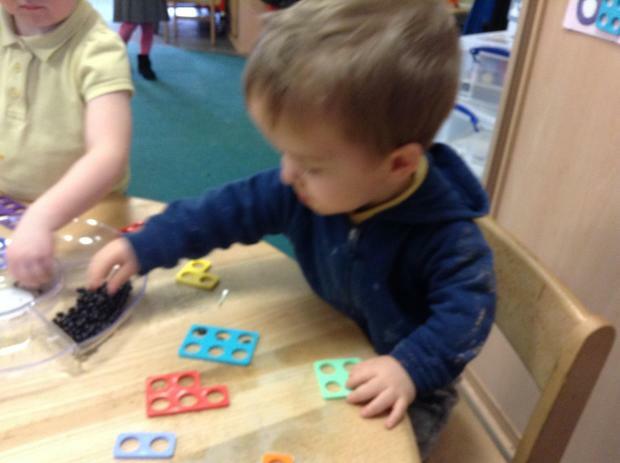 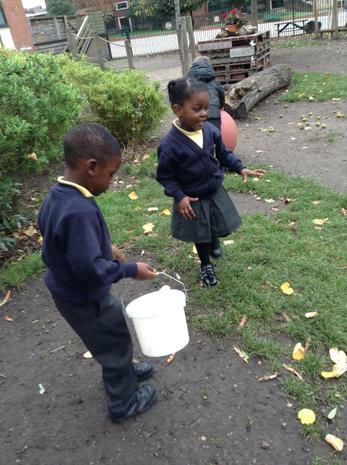 The children planted the magic beans and took them home during the half term to help them to grow. 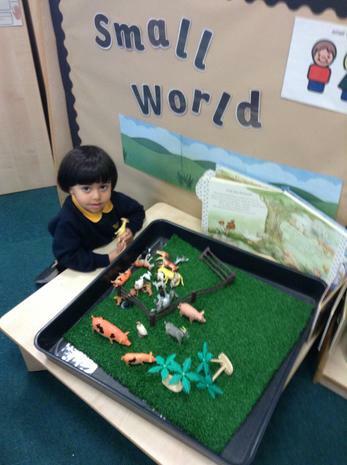 This week we shared the story of The Three Little Pigs. 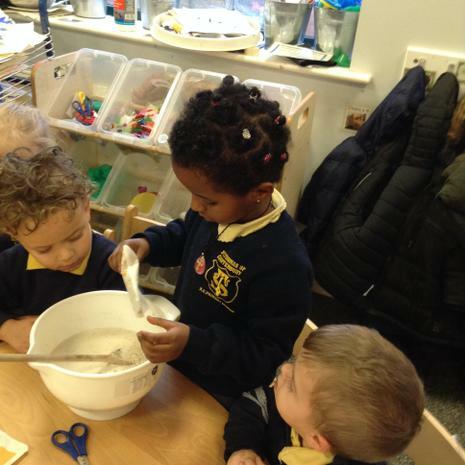 The children were curious about what the little pigs were cooking in the pot, which we thought may be some hot, steamy soup; we decided we wanted to make it too! 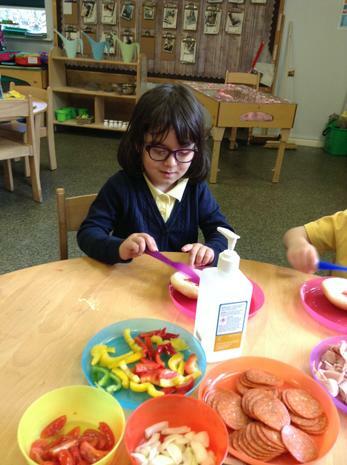 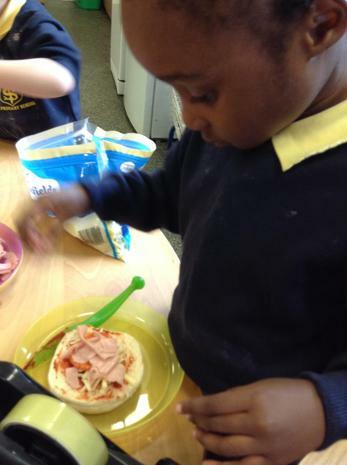 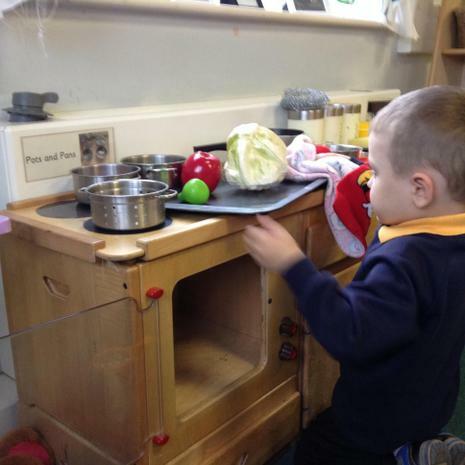 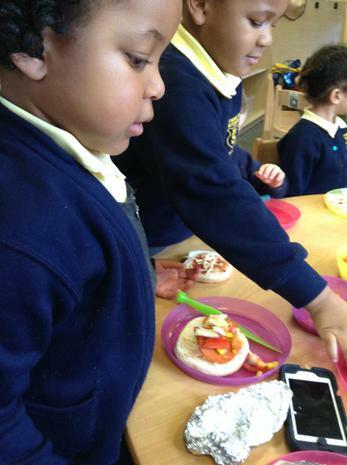 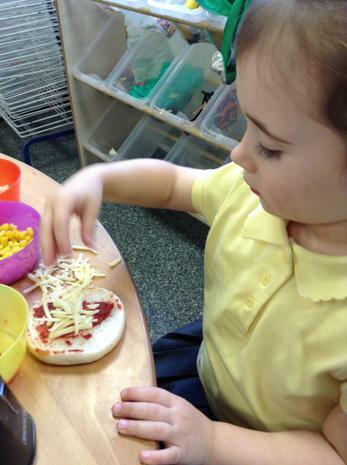 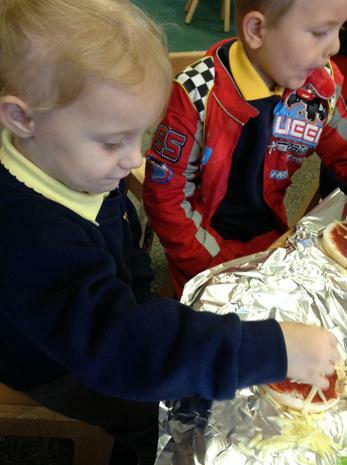 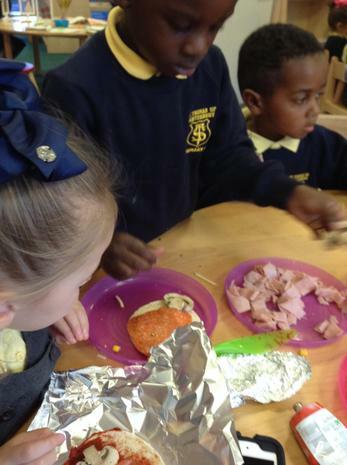 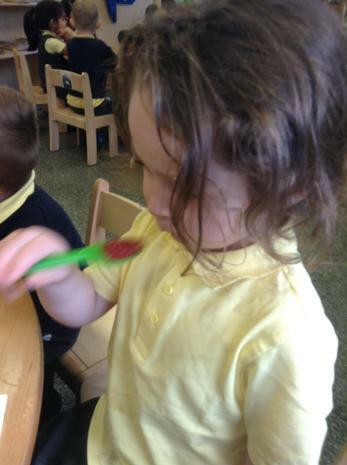 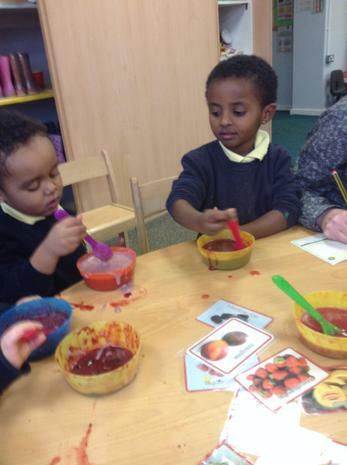 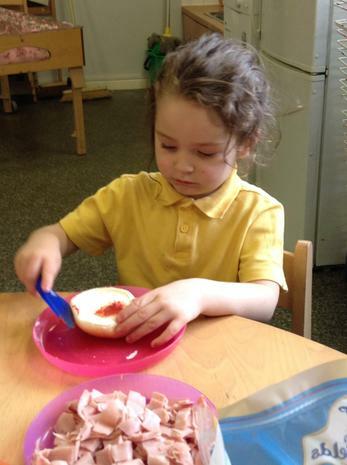 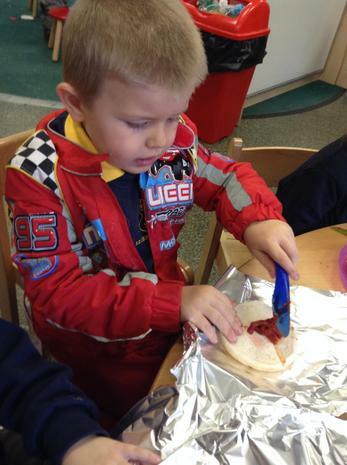 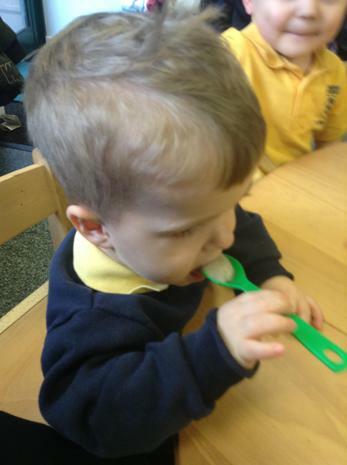 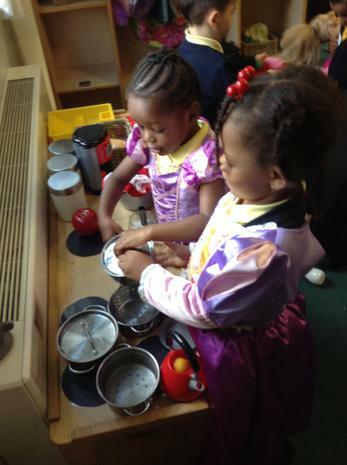 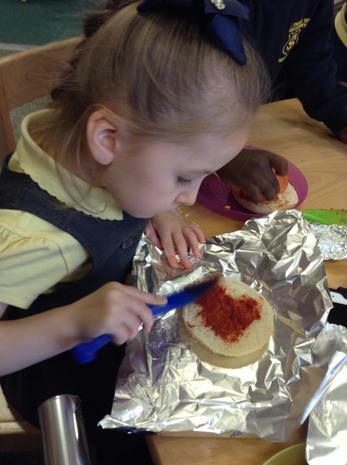 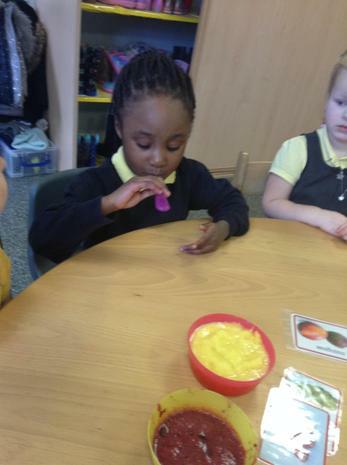 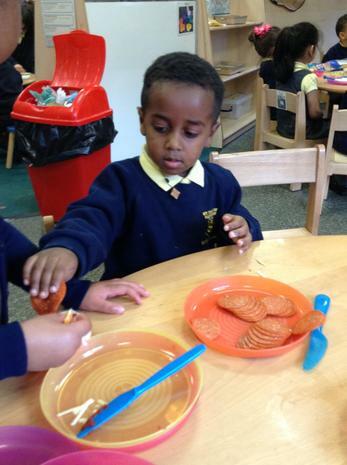 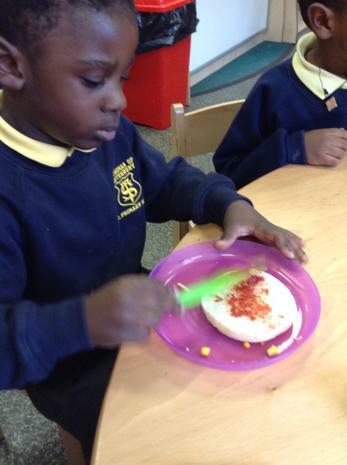 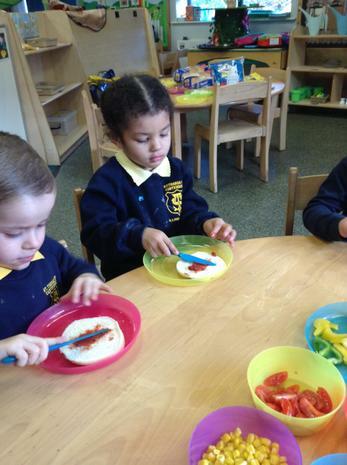 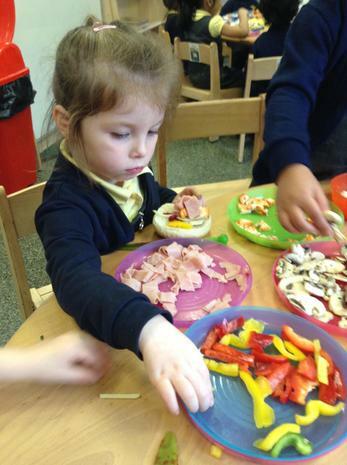 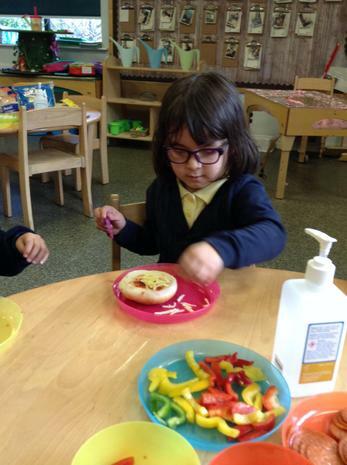 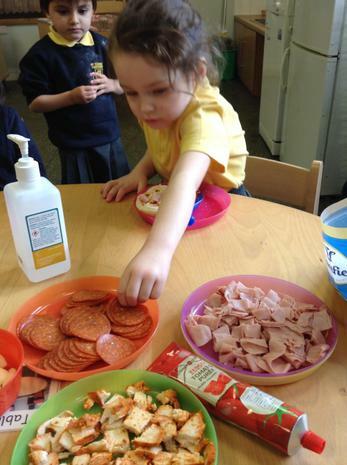 The children practised their cutting skills to prepare the vegetables for the soup. 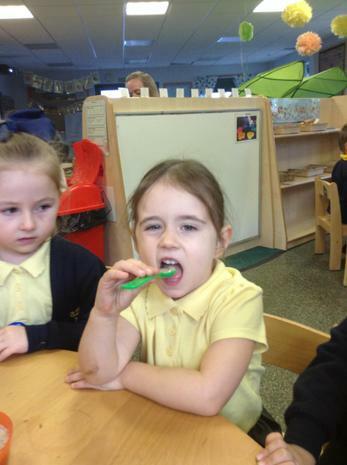 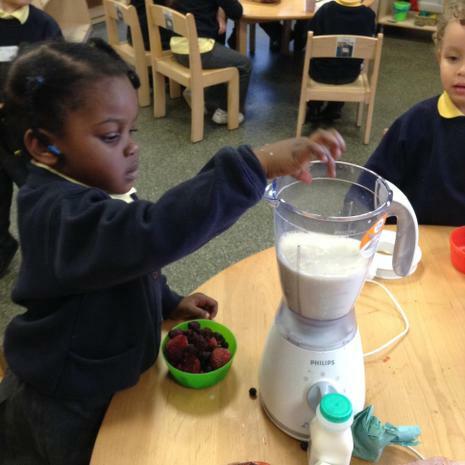 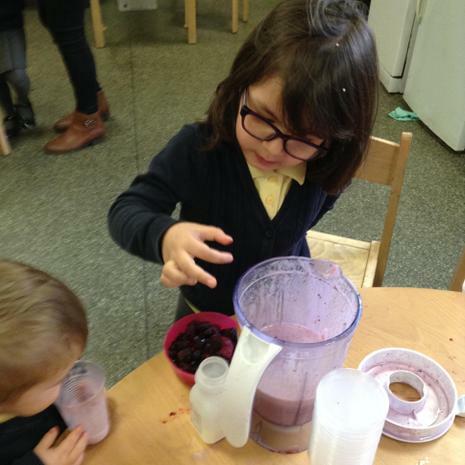 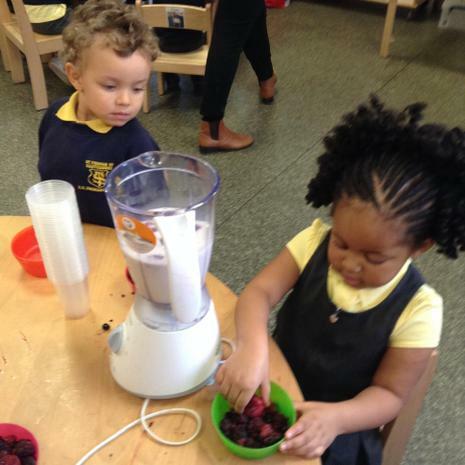 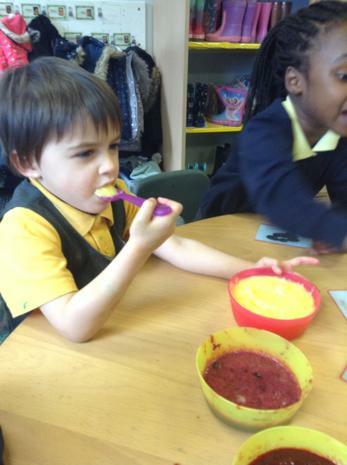 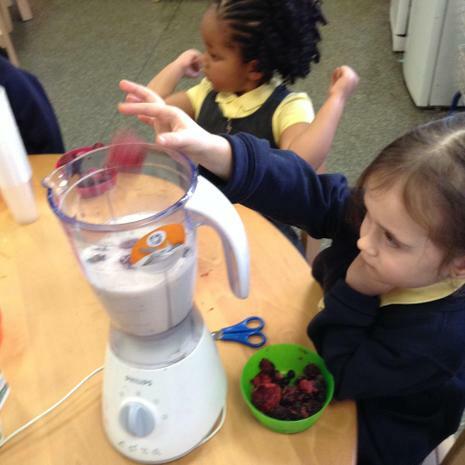 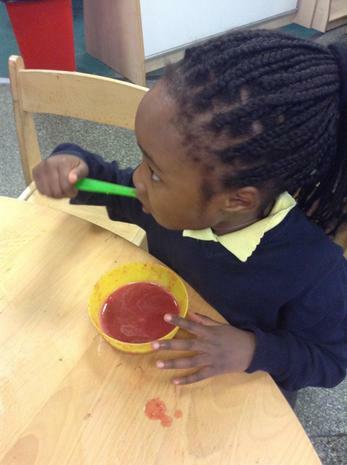 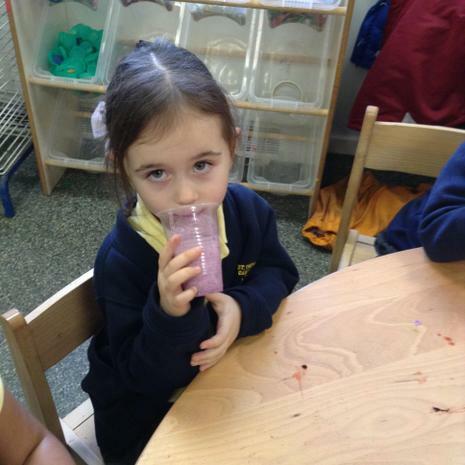 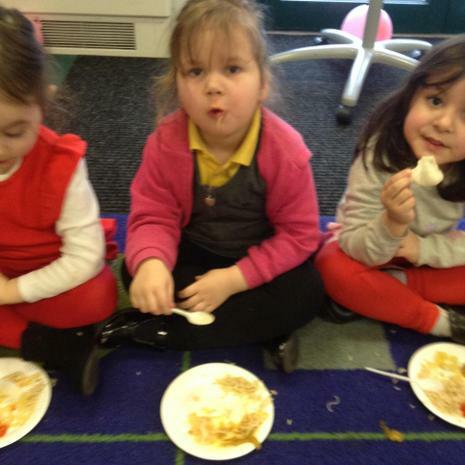 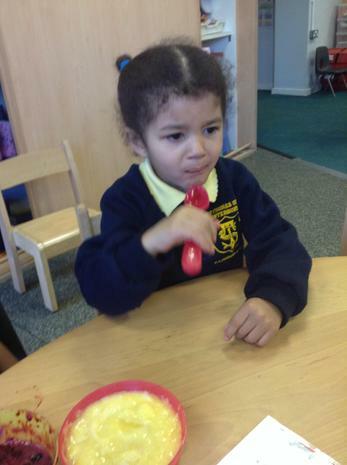 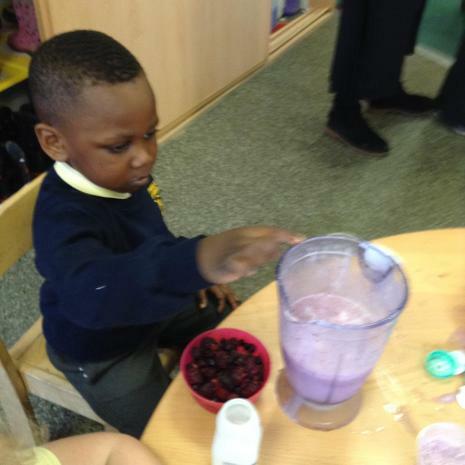 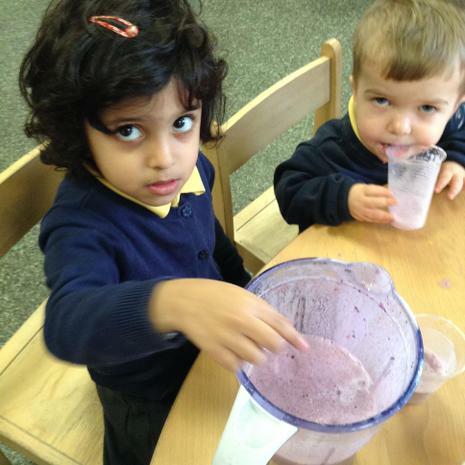 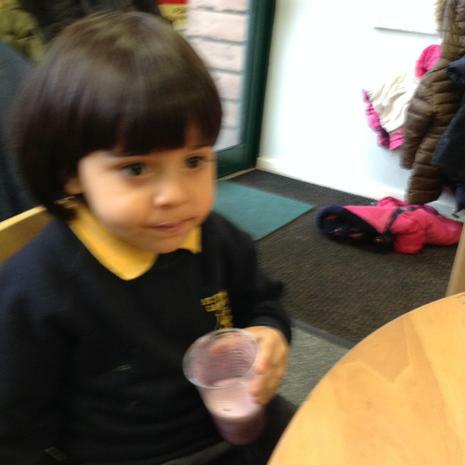 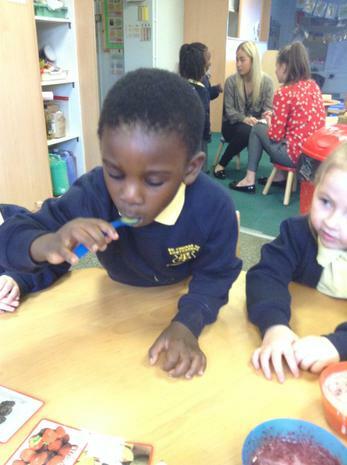 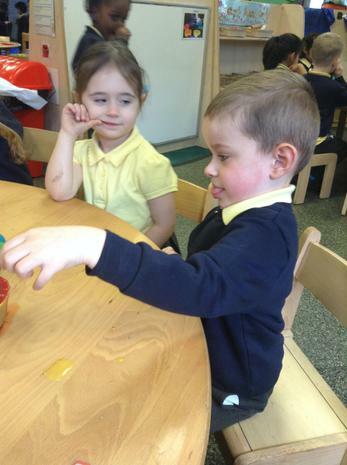 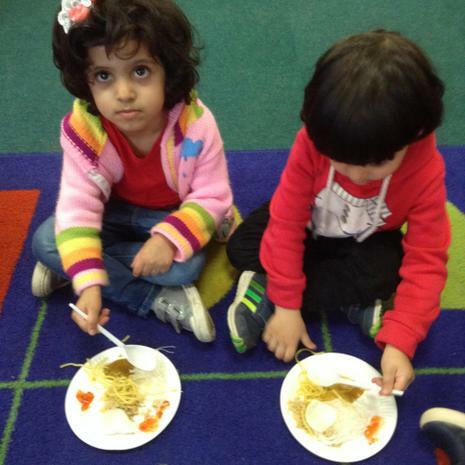 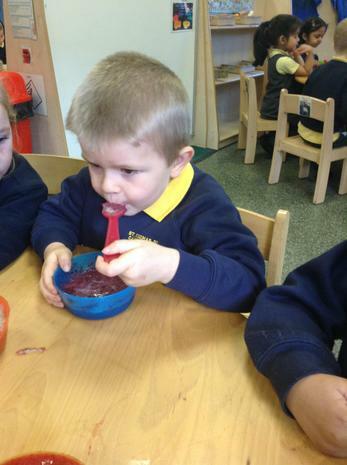 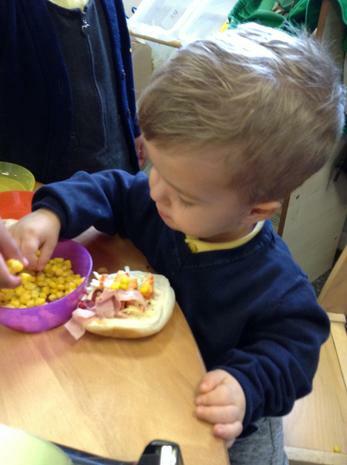 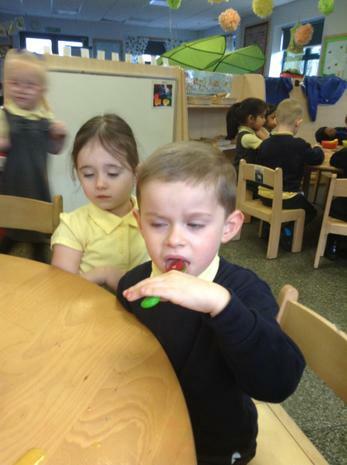 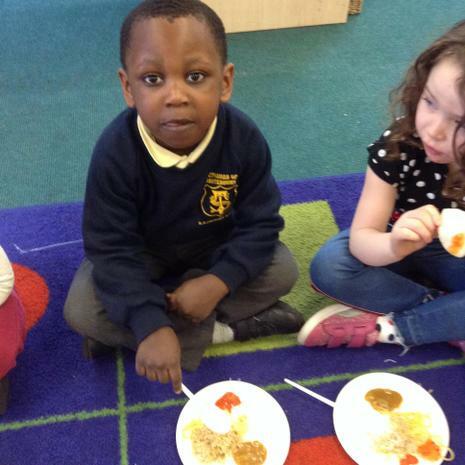 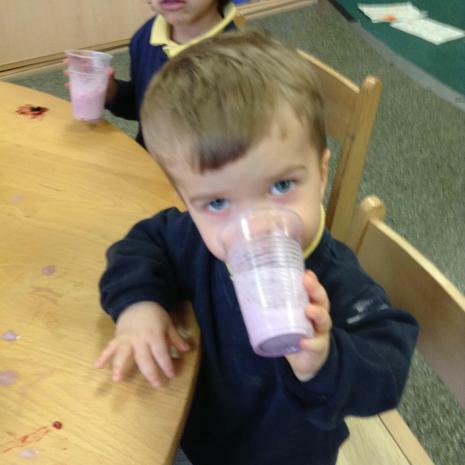 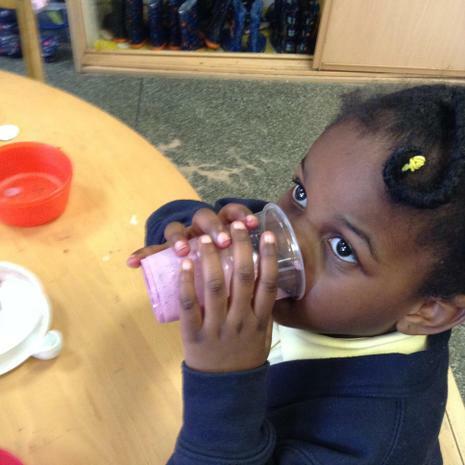 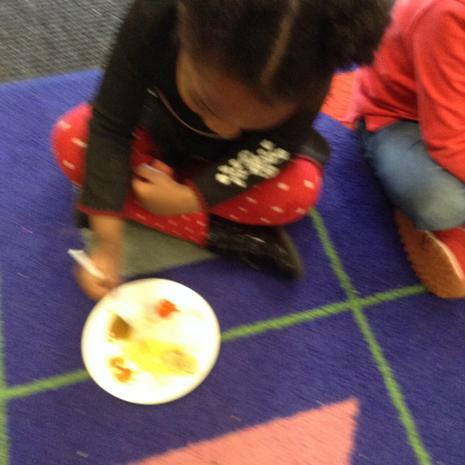 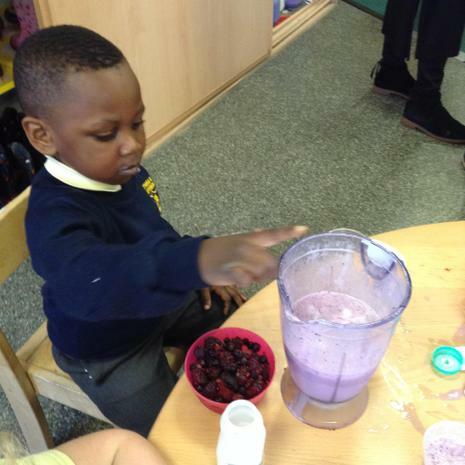 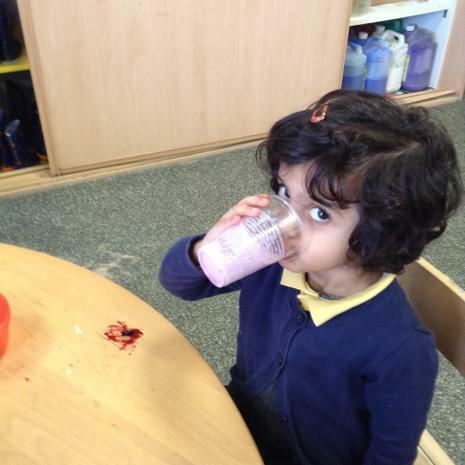 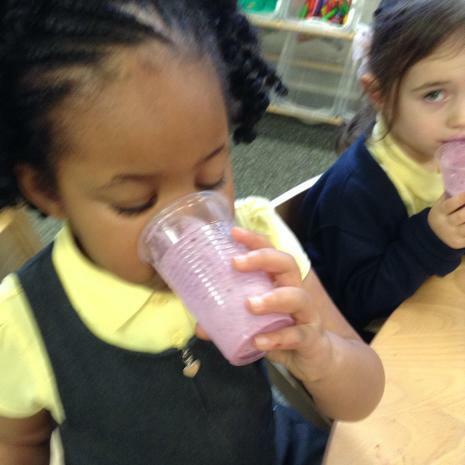 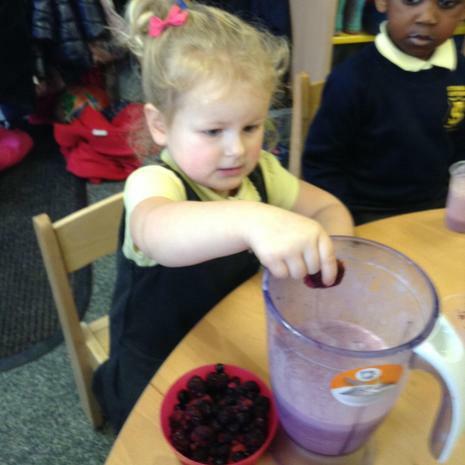 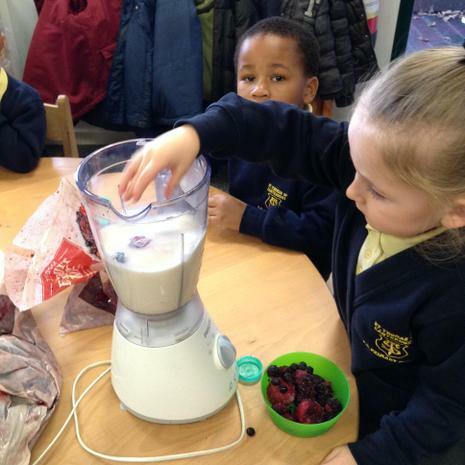 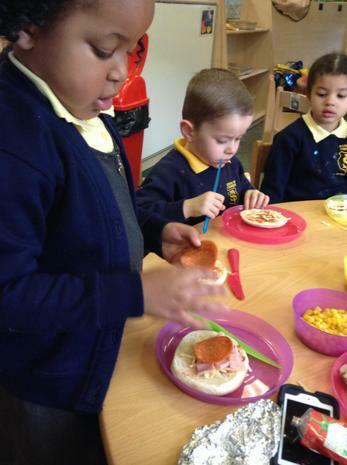 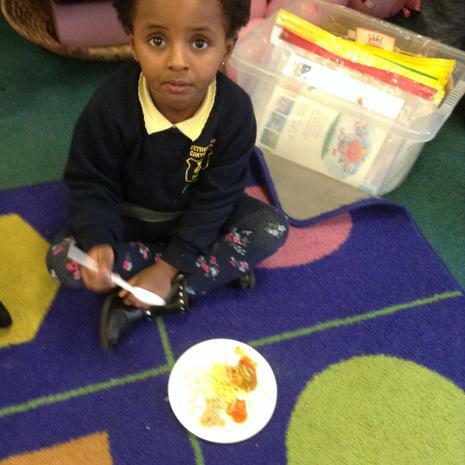 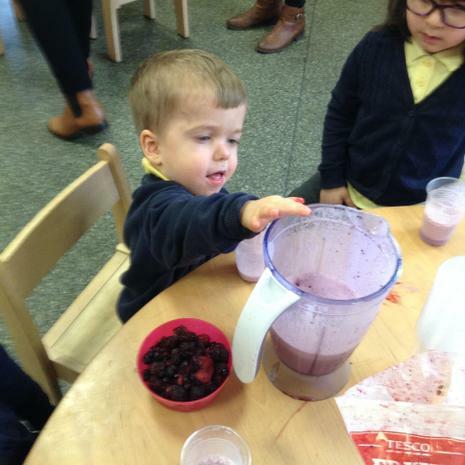 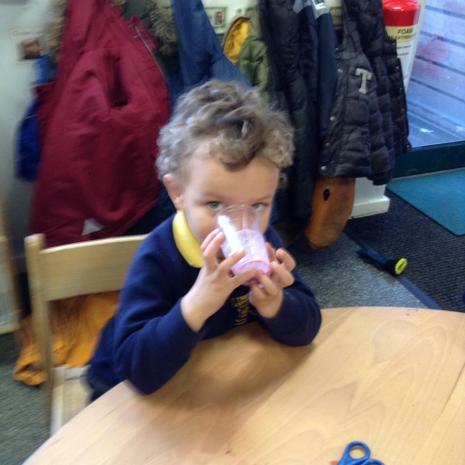 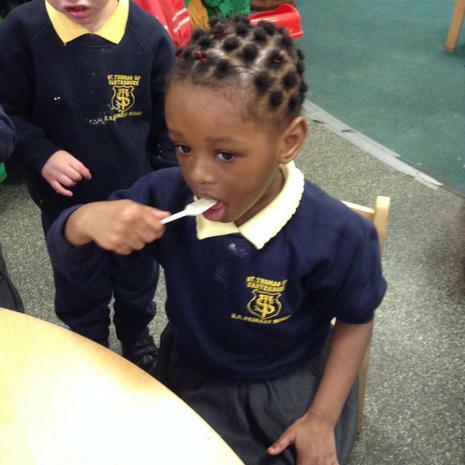 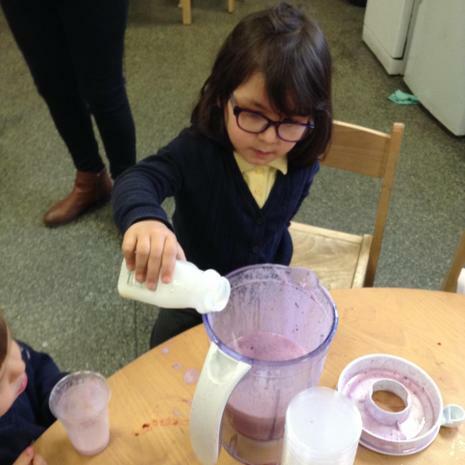 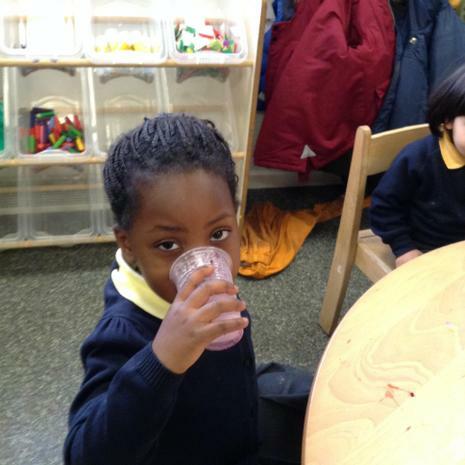 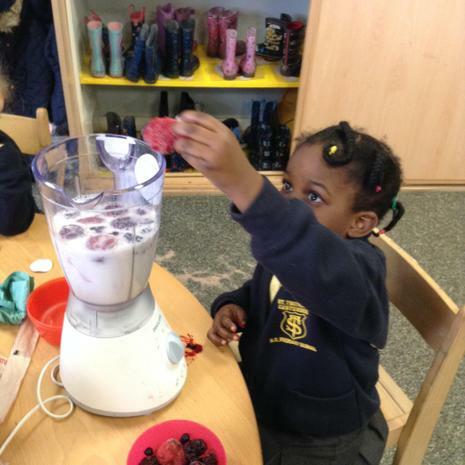 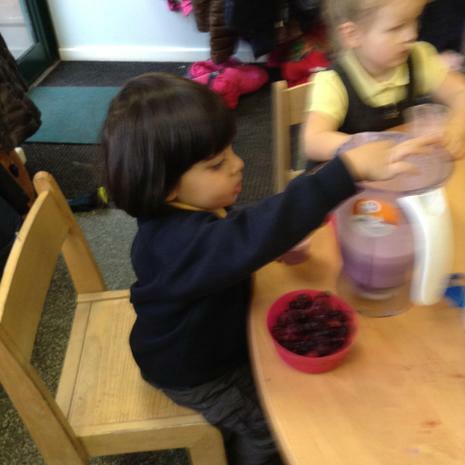 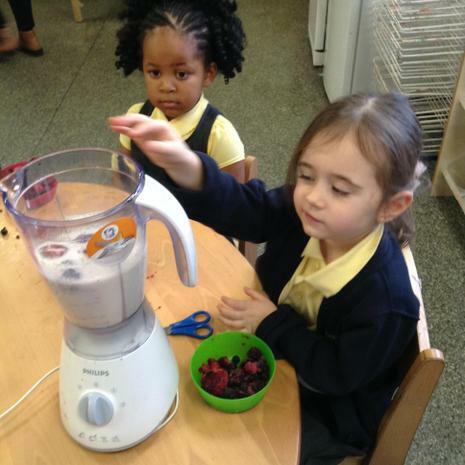 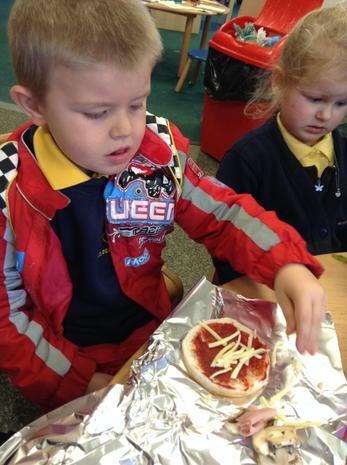 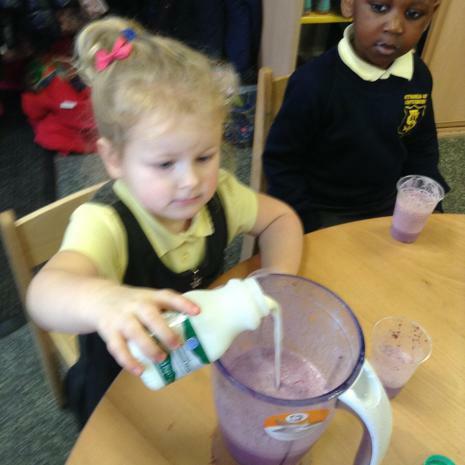 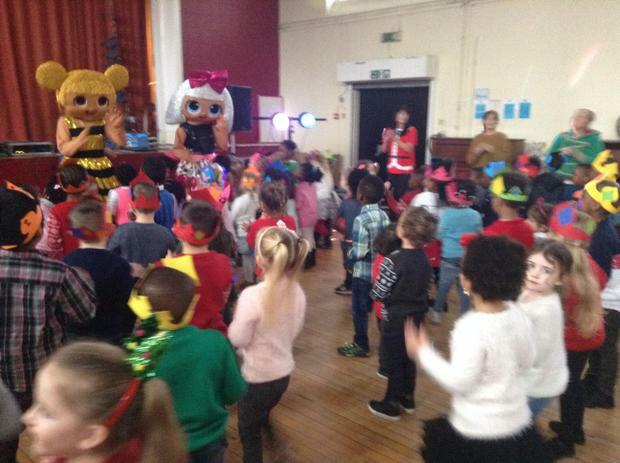 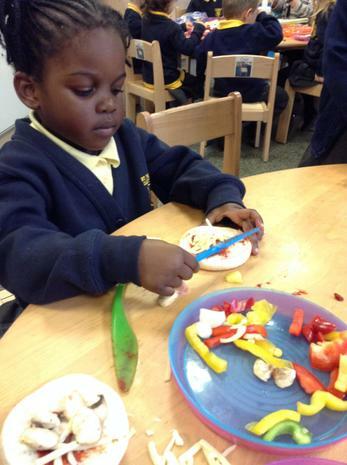 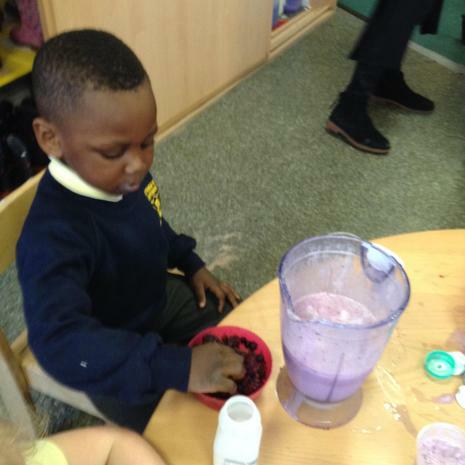 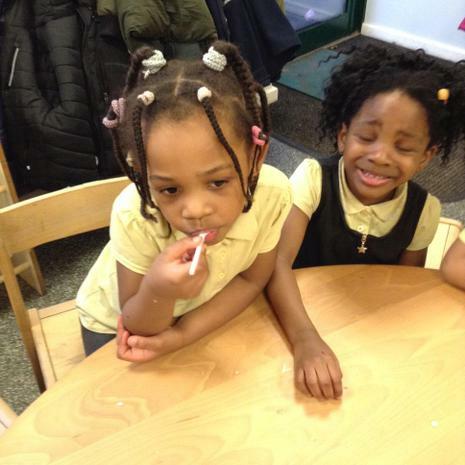 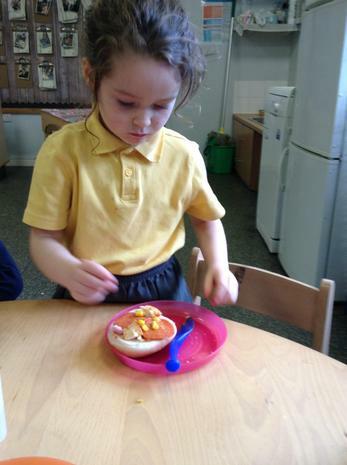 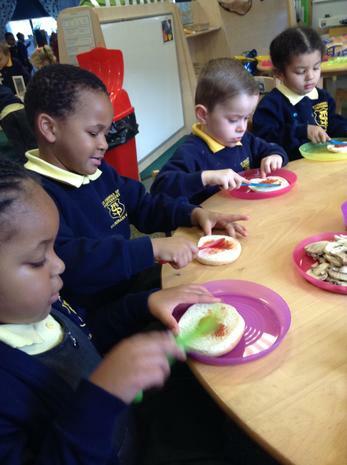 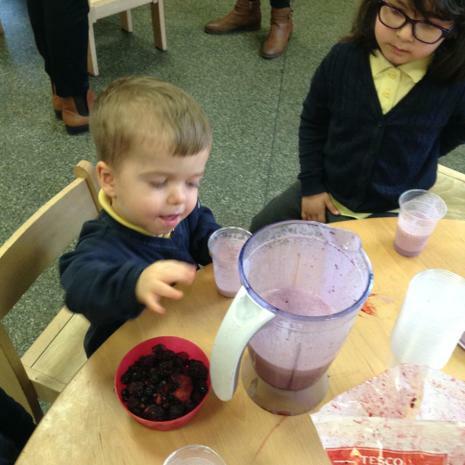 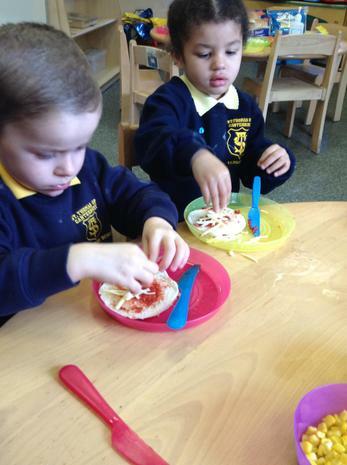 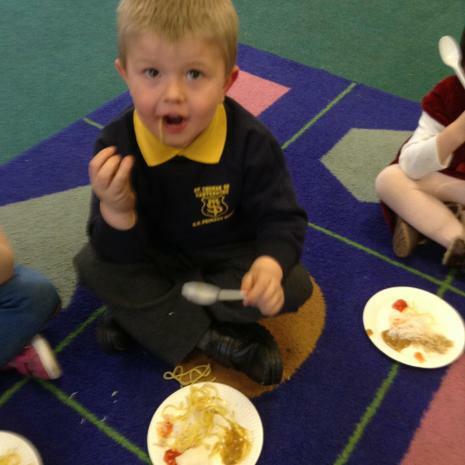 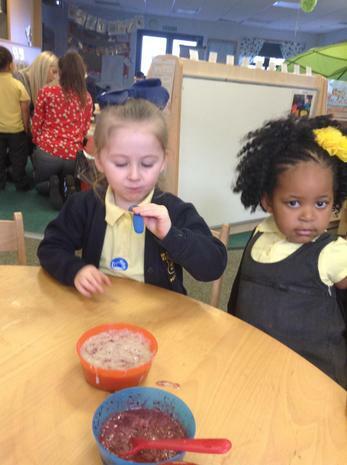 The children enjoyed eating the healthy treat at the end of the day. 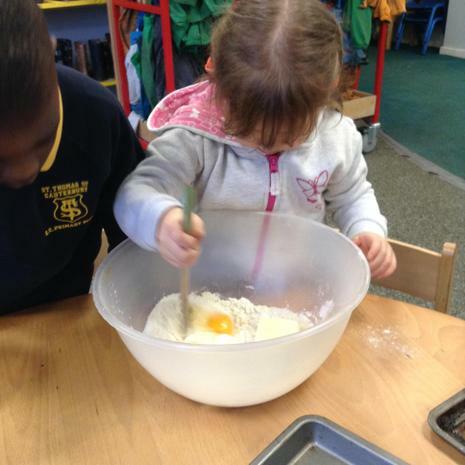 We even made some cakes for Grandma! 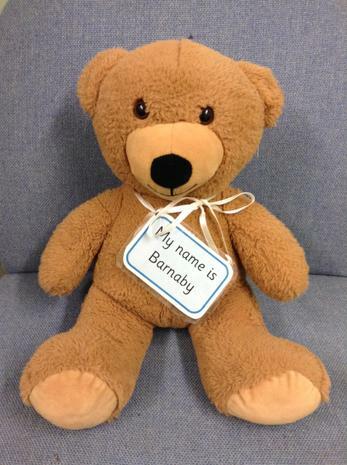 Meet Barnaby, our class bear!! 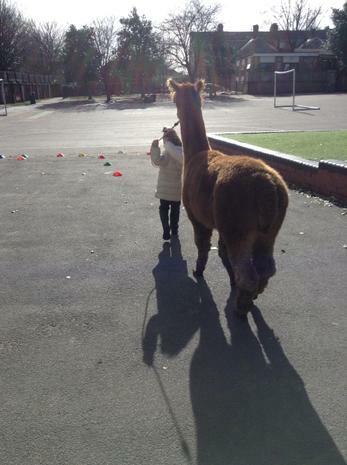 Barnaby will be spending his weekends with a special friend from our class, we can't wait to hear about all of his adventures on Monday mornings. 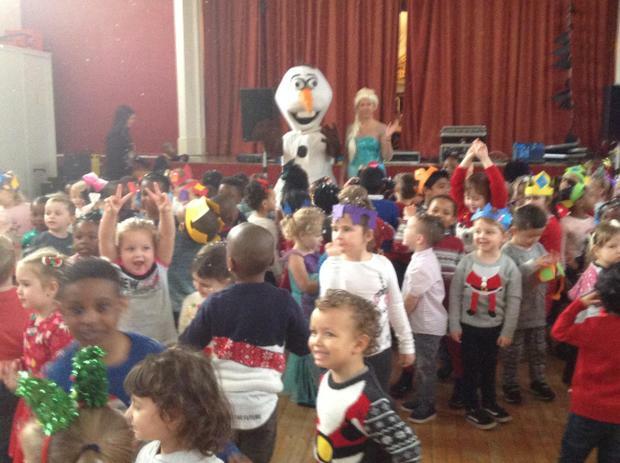 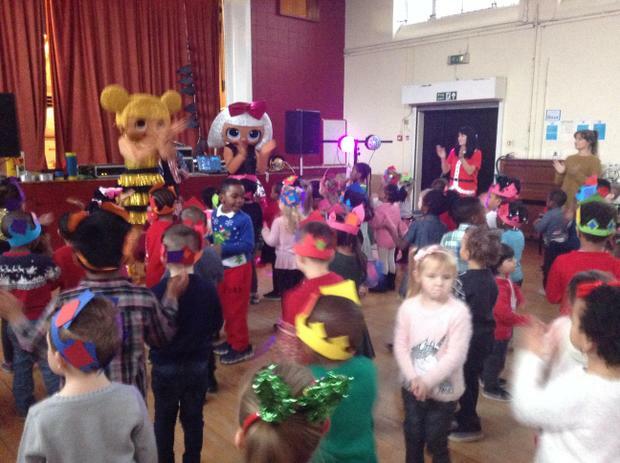 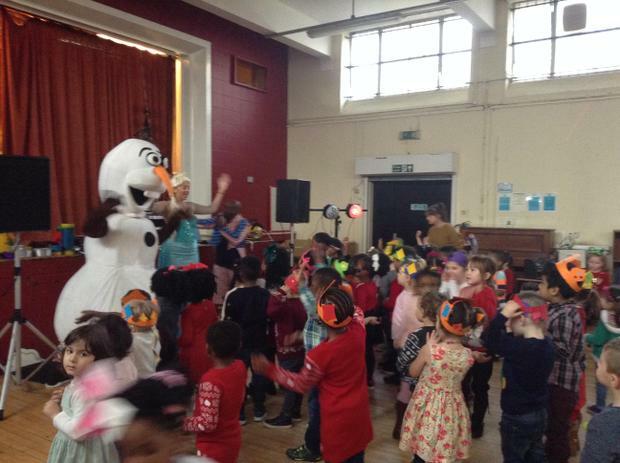 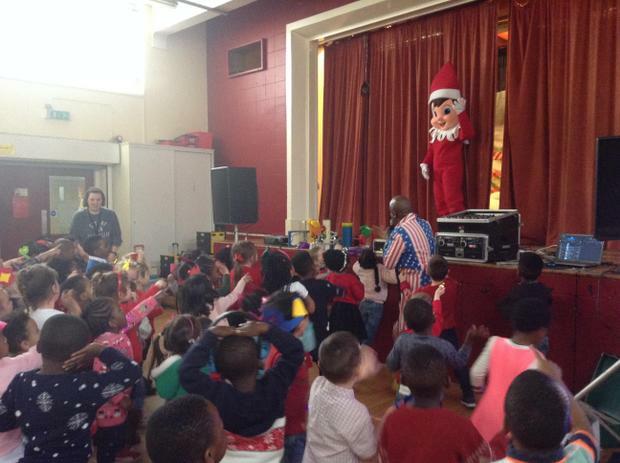 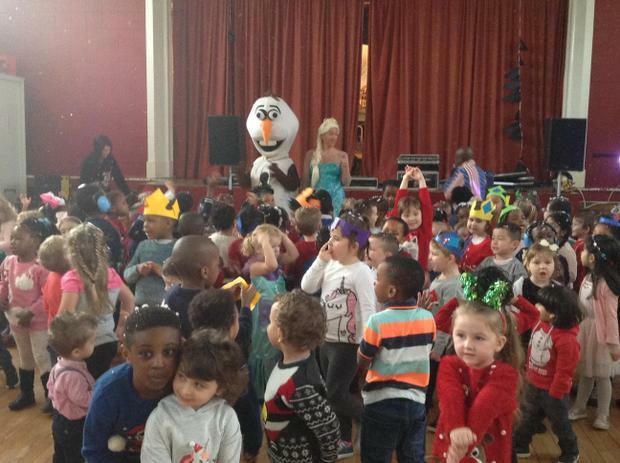 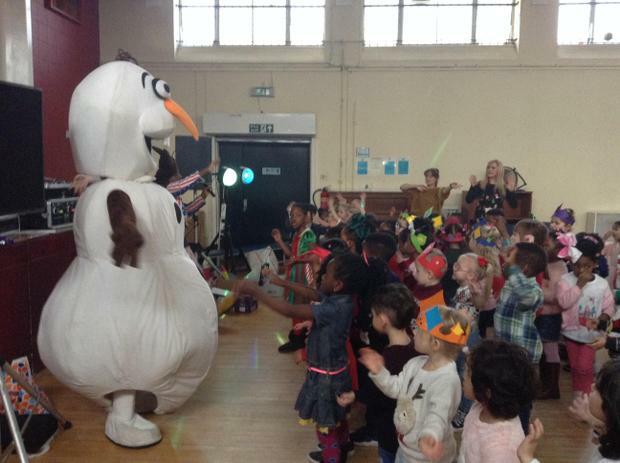 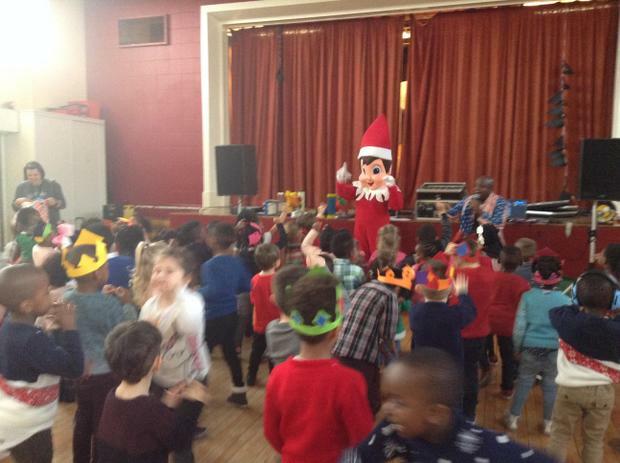 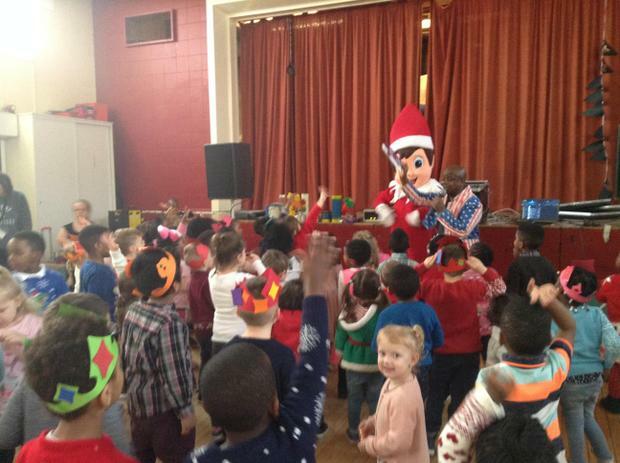 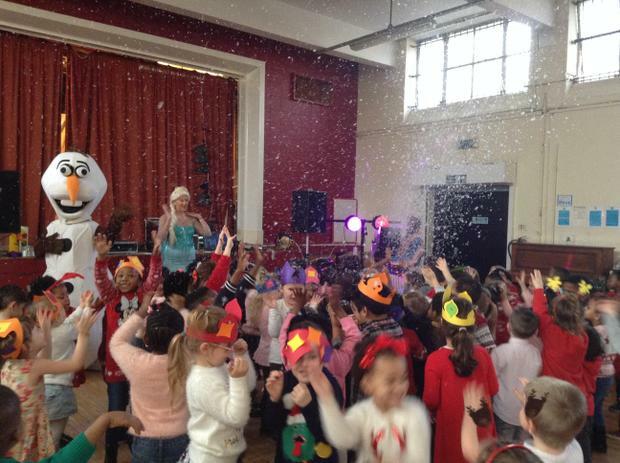 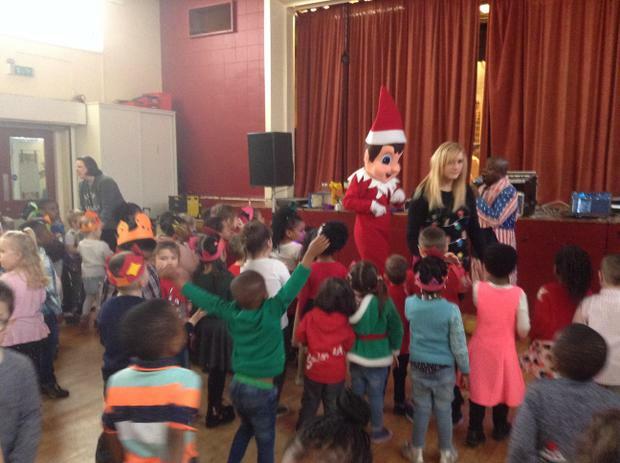 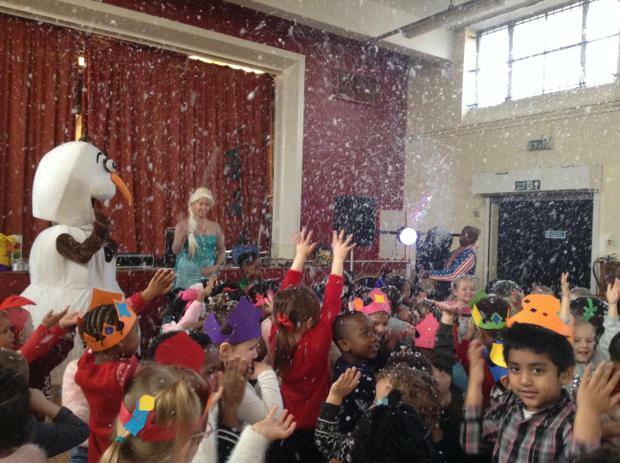 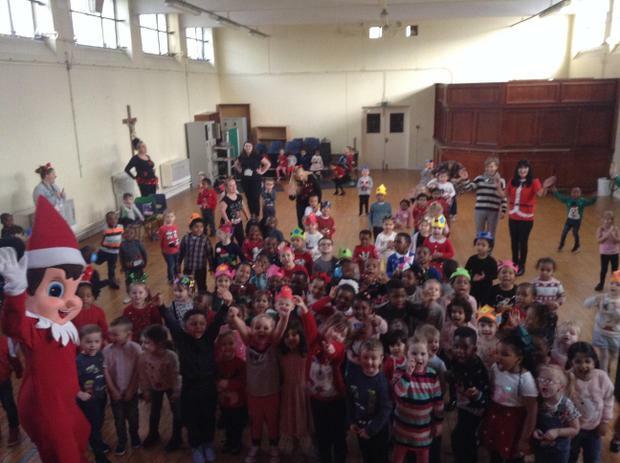 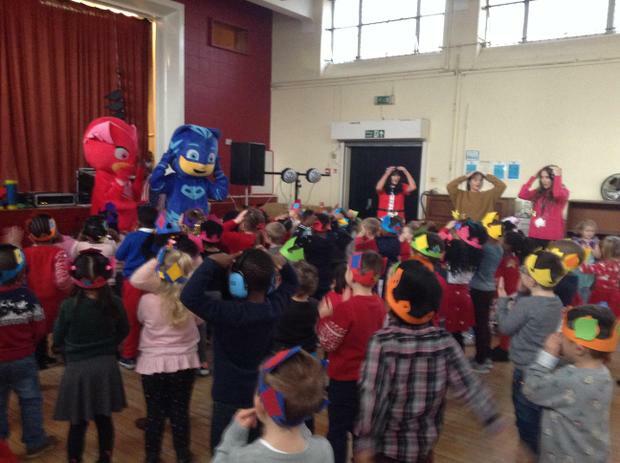 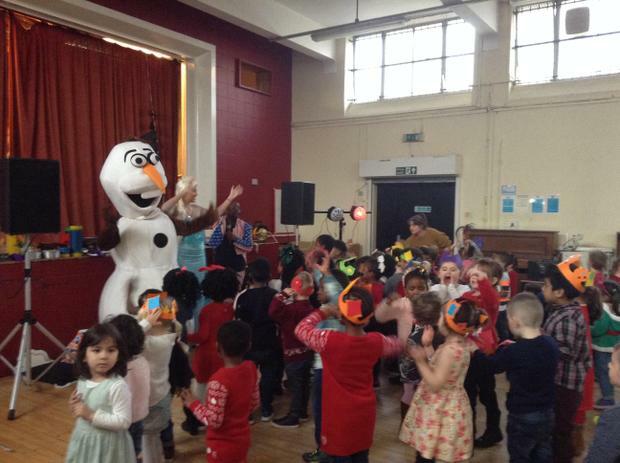 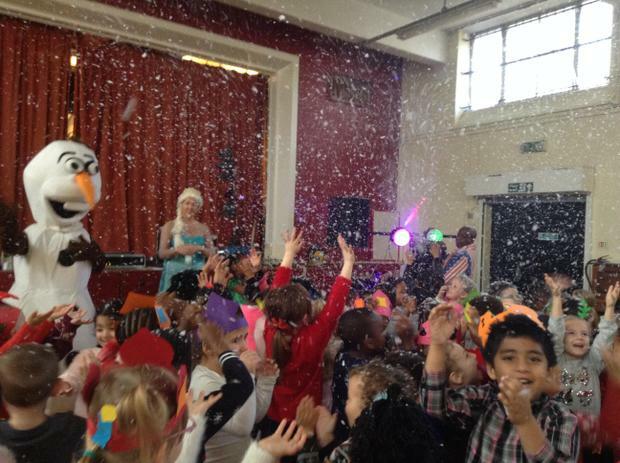 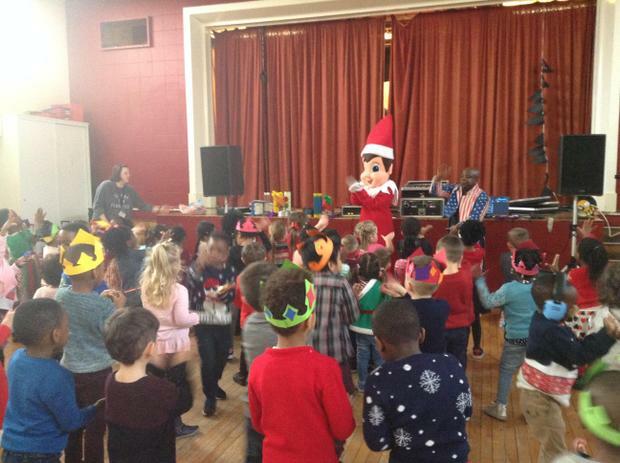 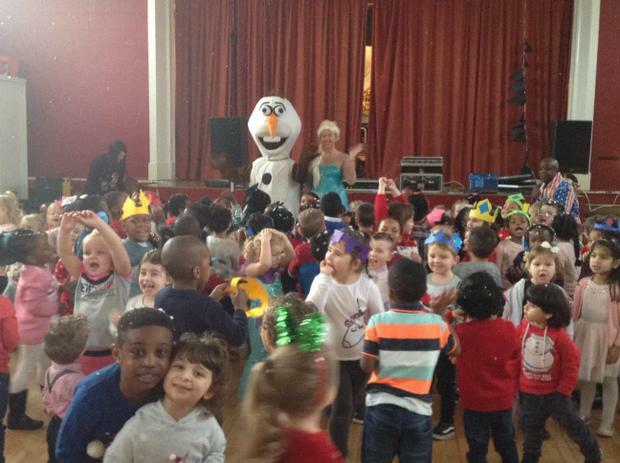 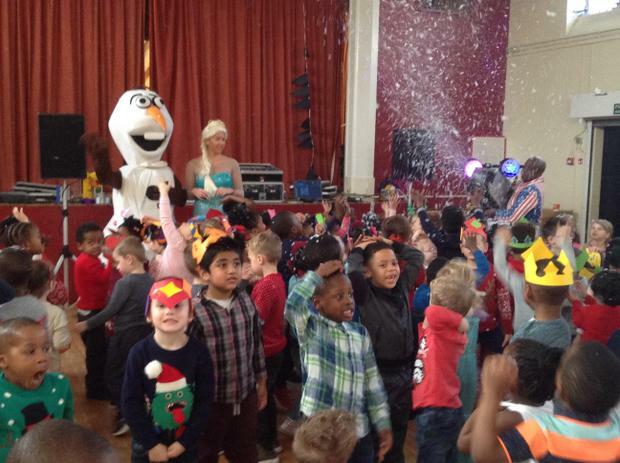 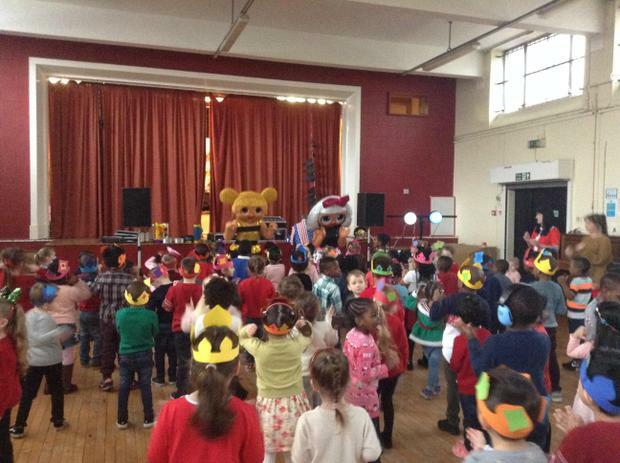 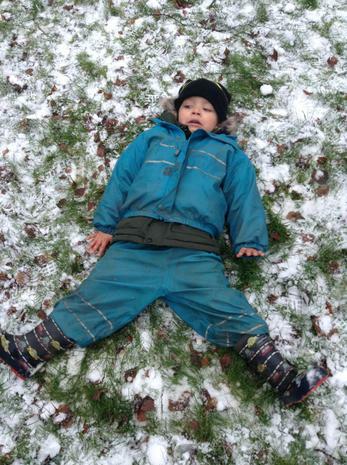 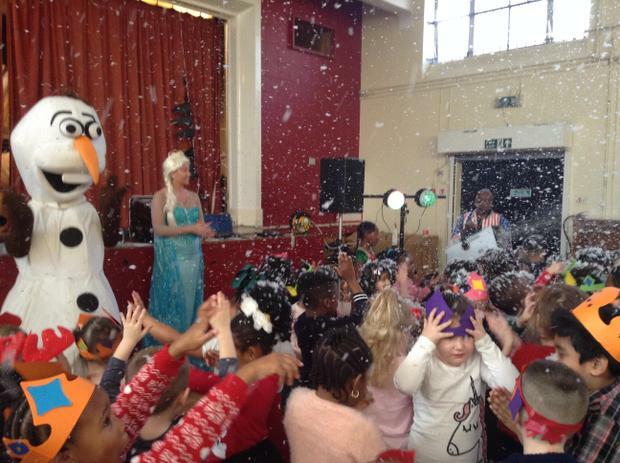 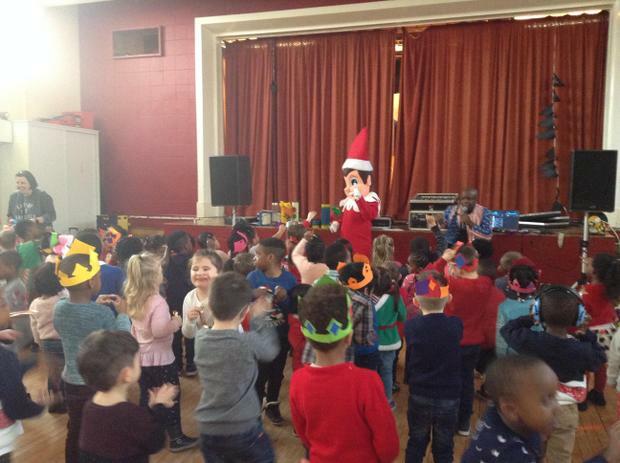 Christmas is nearly here and we are feeling excited!! 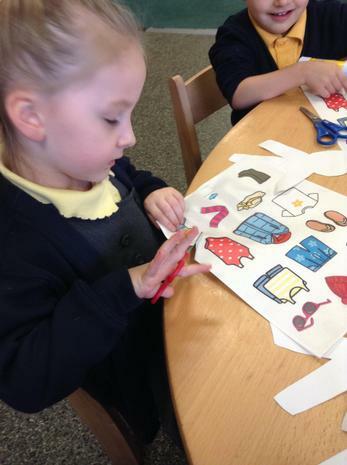 Our little elves have been busy in Santa's Workshop making wrapping paper, sorting the presents and writing letters to Santa. 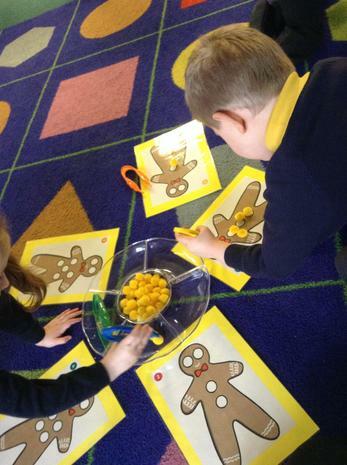 The children have been putting their cutting skills to the test as they choose the toys they would like to play with in our magazines... it looks like Santa is going to be very busy!!. 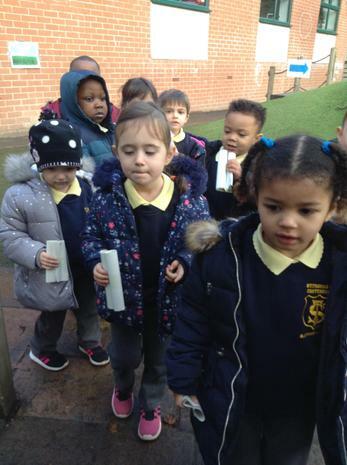 Santa has given us a copy of his 'naughty & nice list', and has asked us to check it TWICE!! 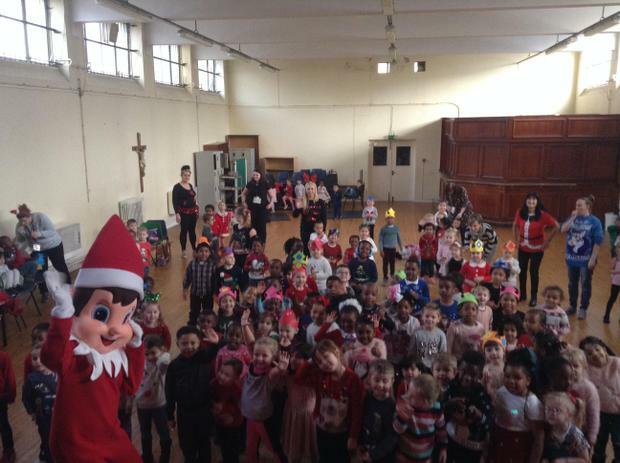 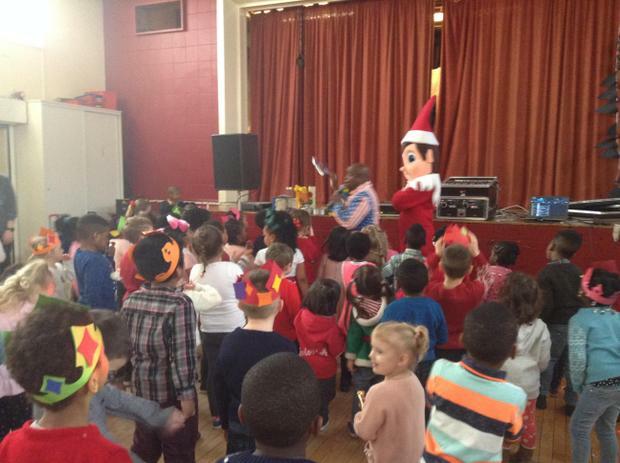 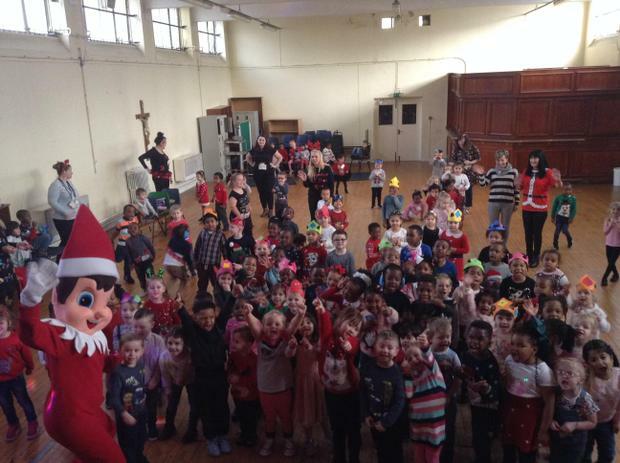 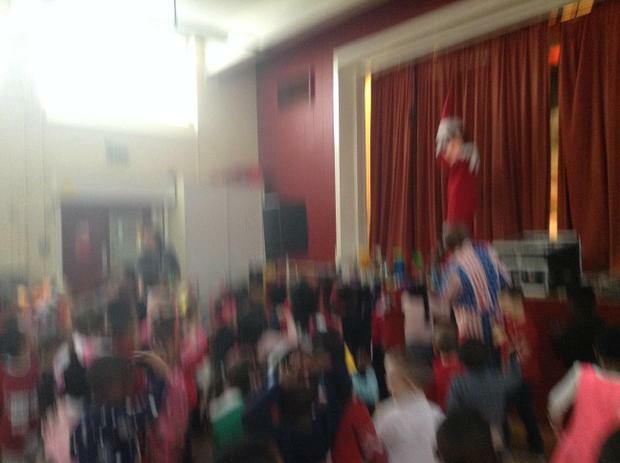 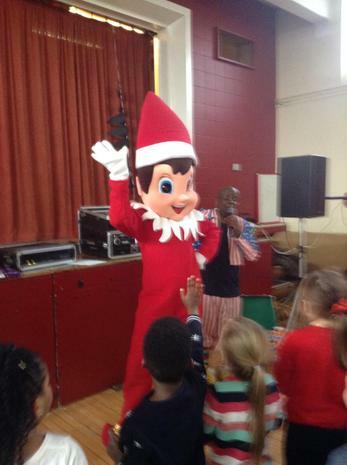 HE has also sent us a cheeky elf named Buddy to check we are following our golden rules in school... so far so good! 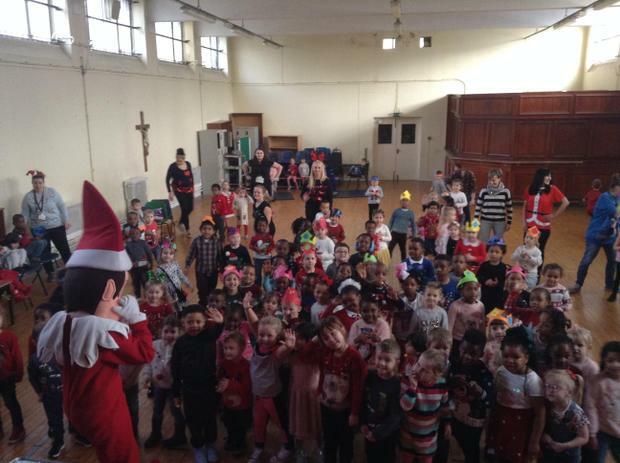 We're all on the nice list!!! 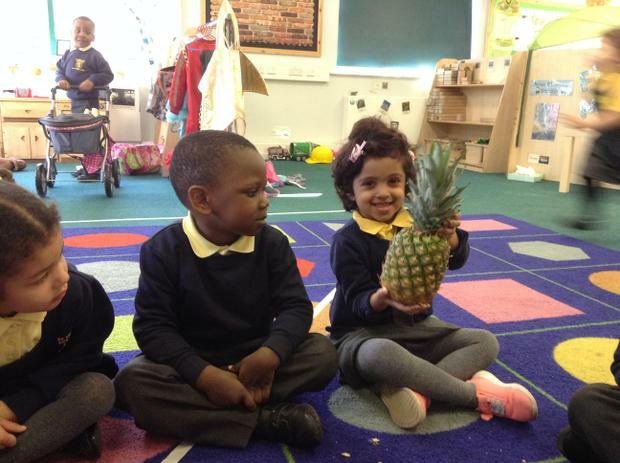 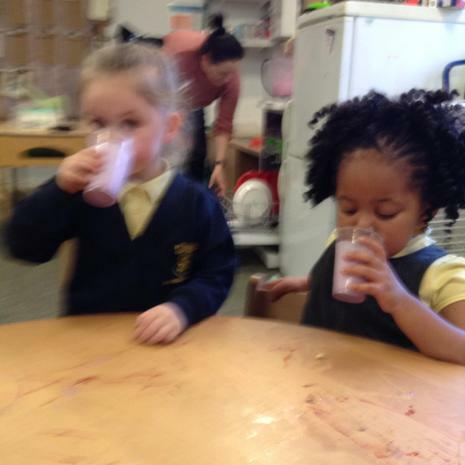 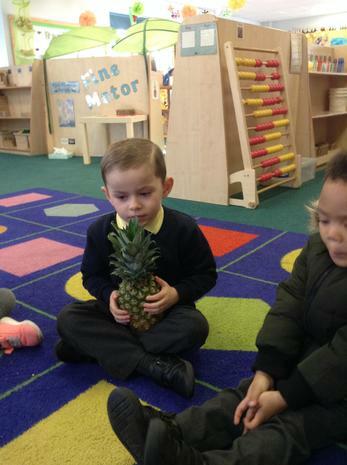 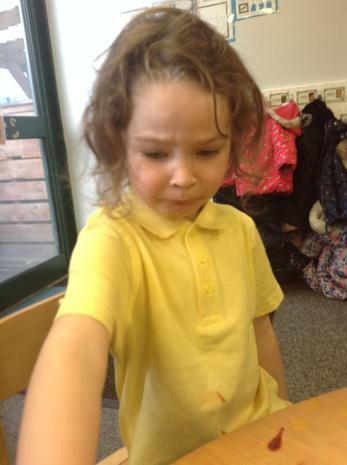 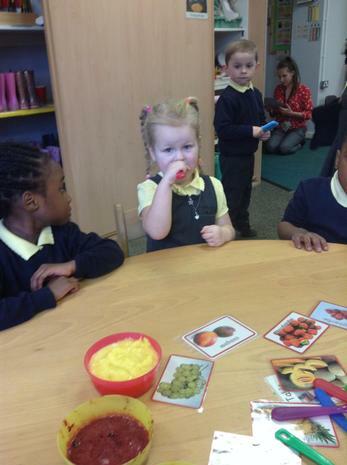 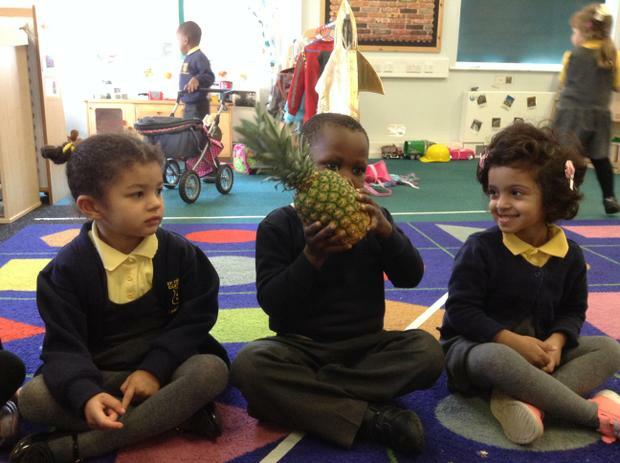 The children really enjoyed the 'guess the fruit' challenge, where they tasted a range of blended fruits we have looked at this week. 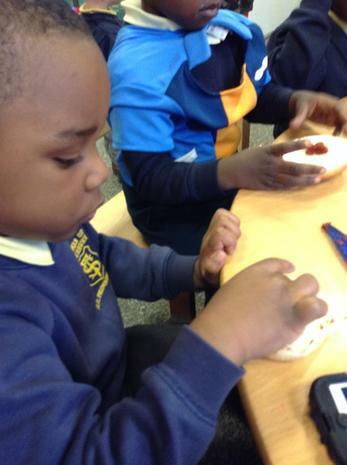 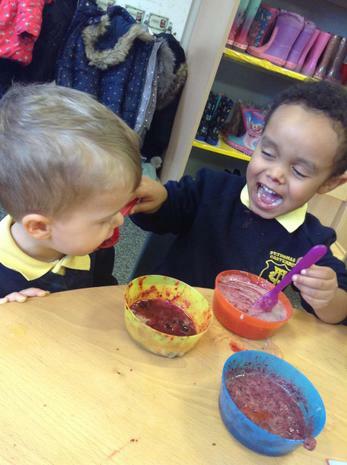 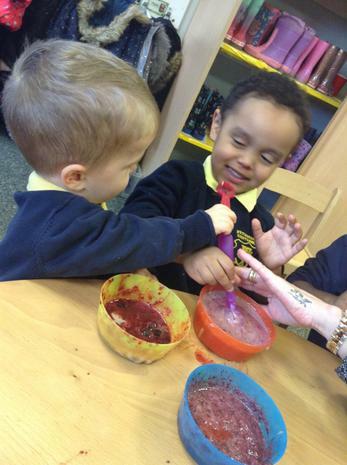 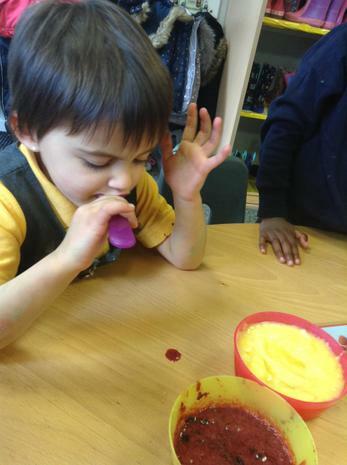 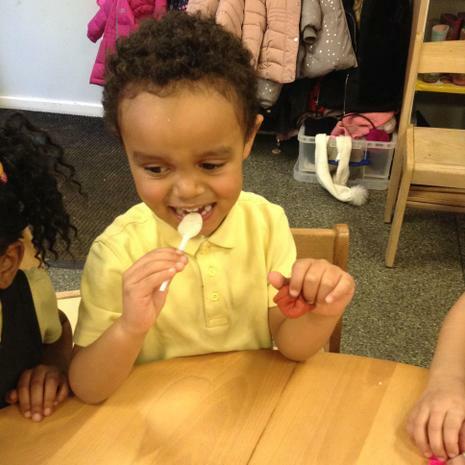 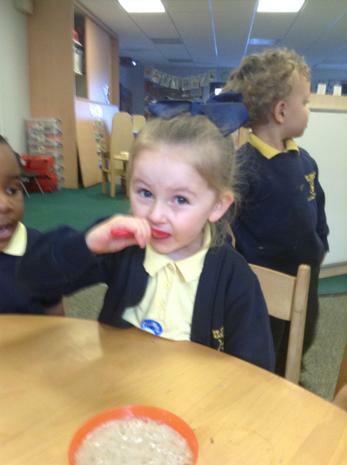 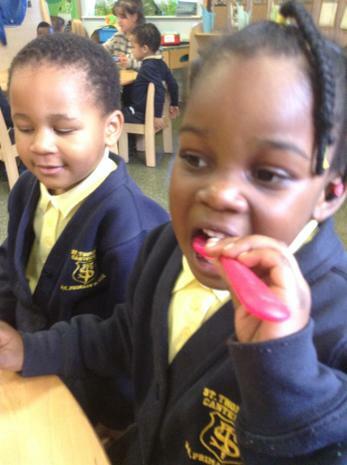 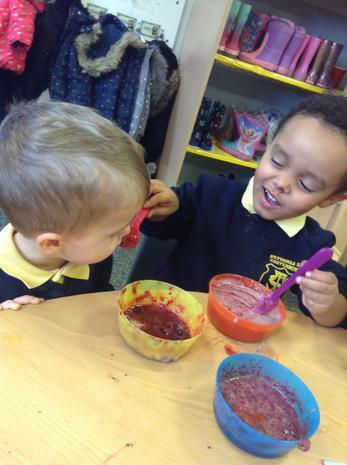 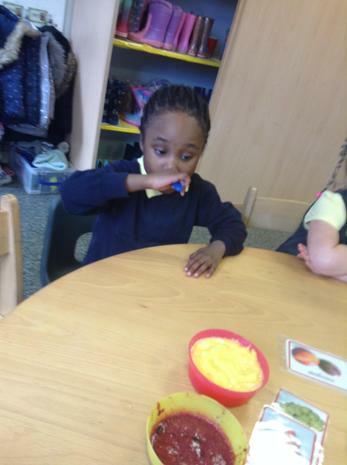 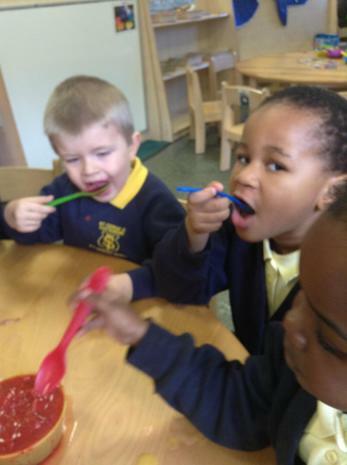 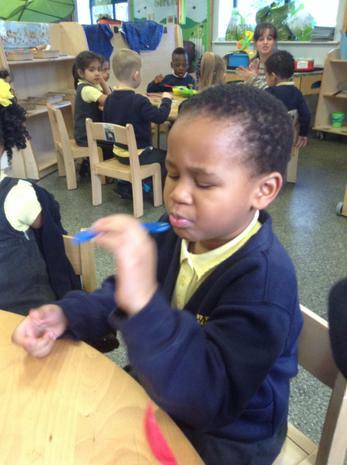 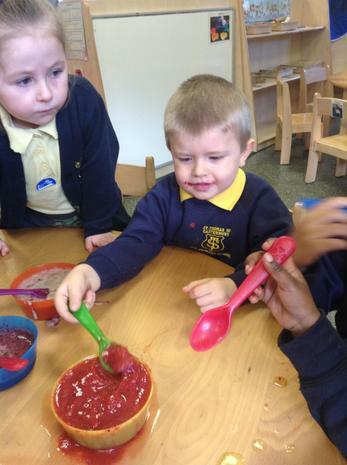 The children's faces as they tasted the fruit were the best!! 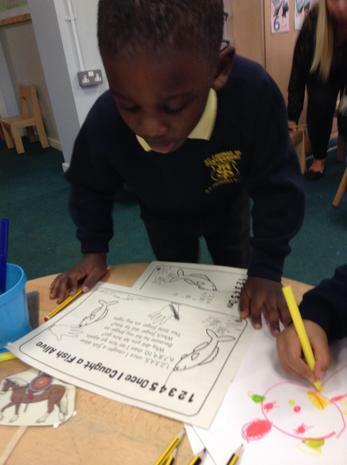 The children have loved our focused text this week, Handa's Surprise. 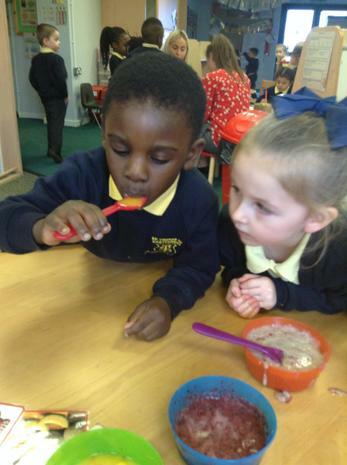 We explored the different fruits in Handa's basket, where we talked about how they felt and what we thought they would taste like. 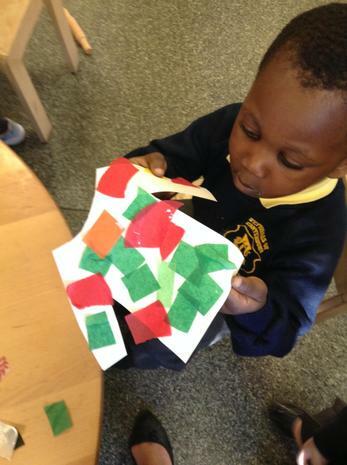 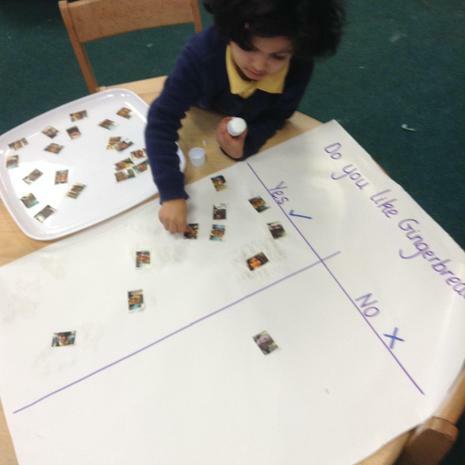 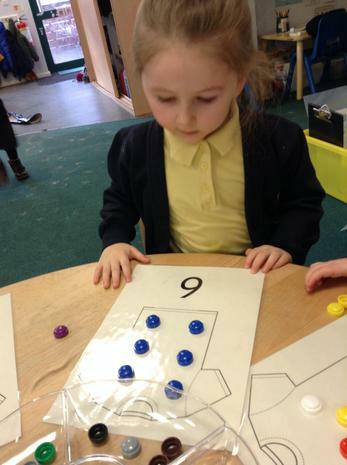 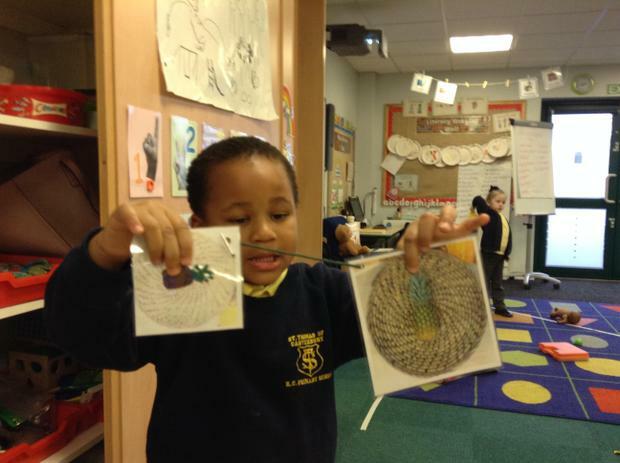 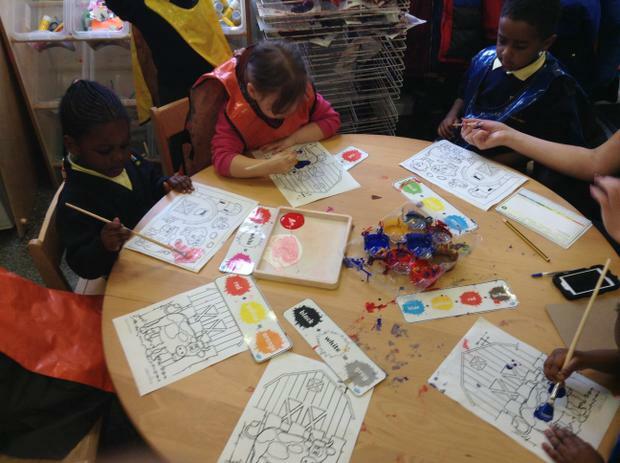 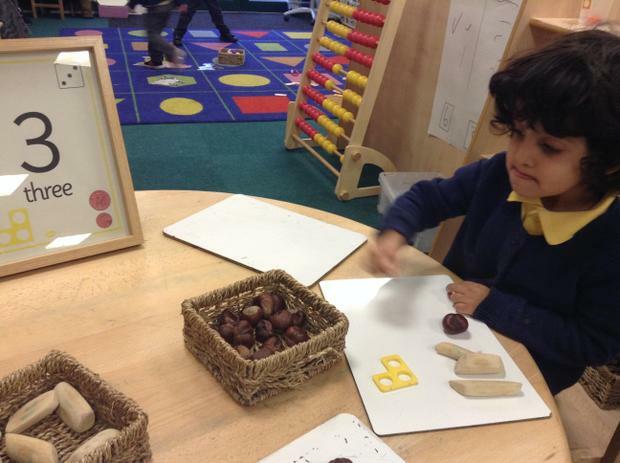 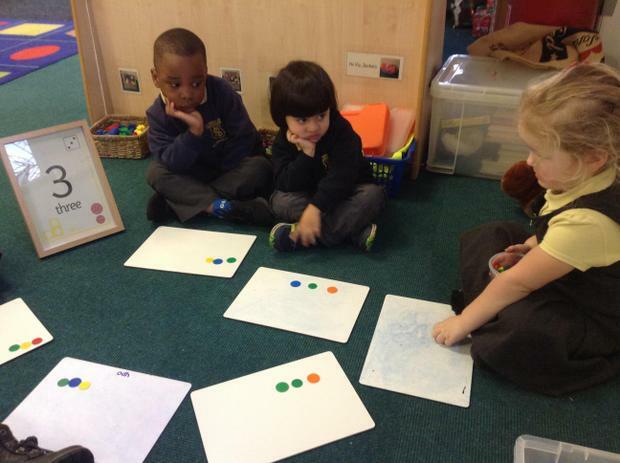 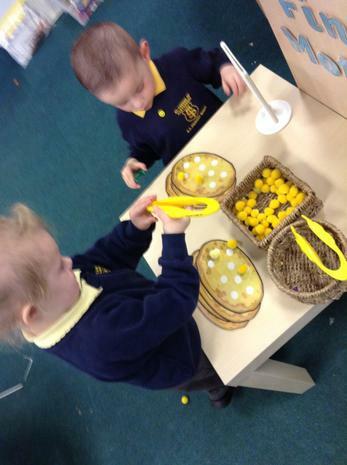 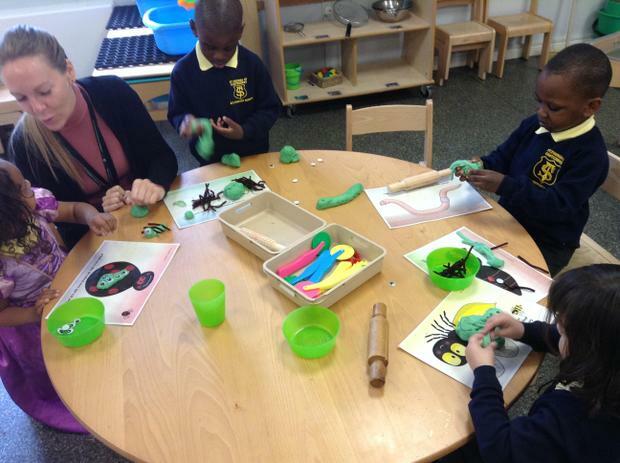 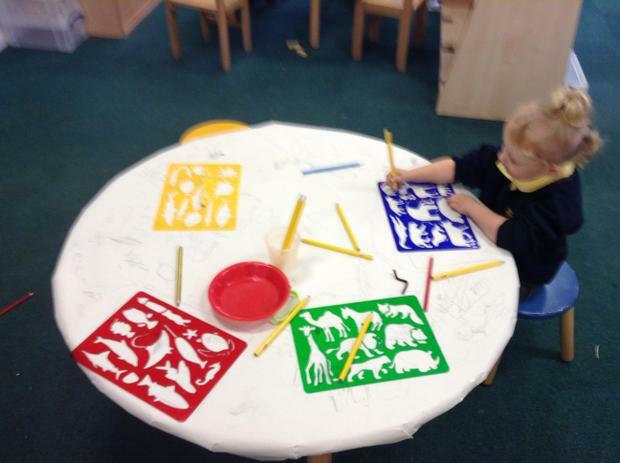 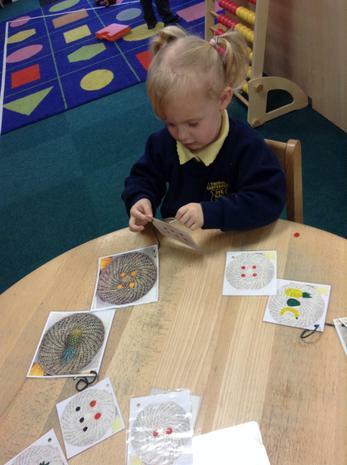 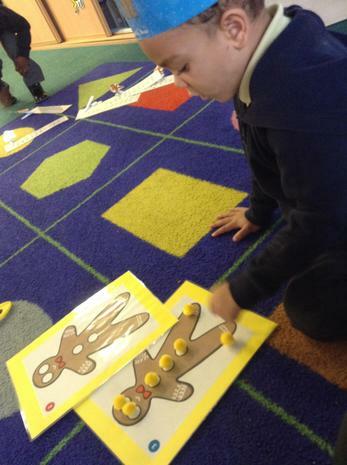 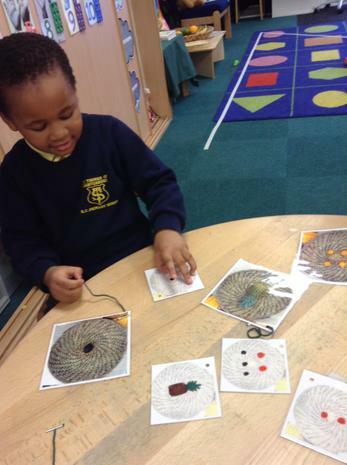 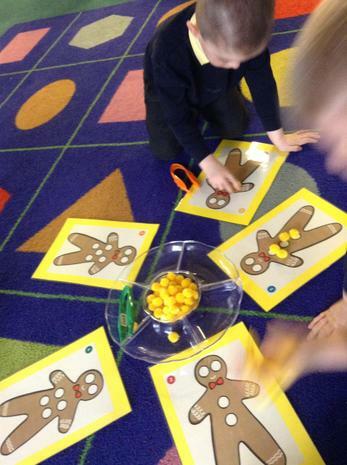 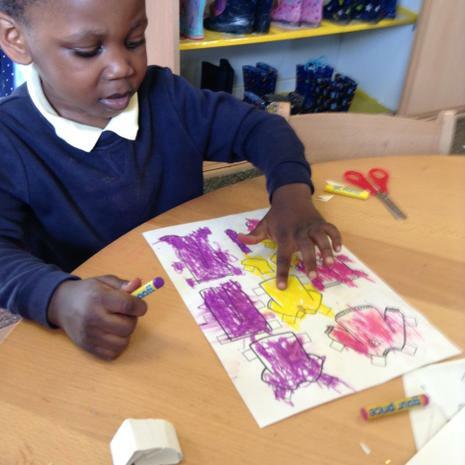 We also looked at the cheeky animals and worked together to match the animals to the fruit they took. 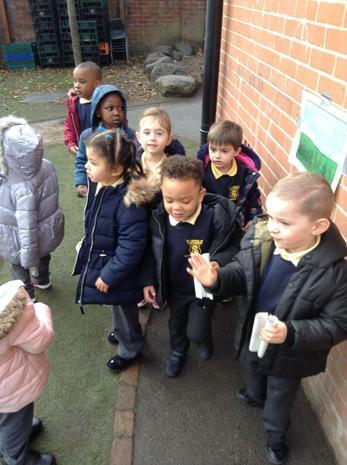 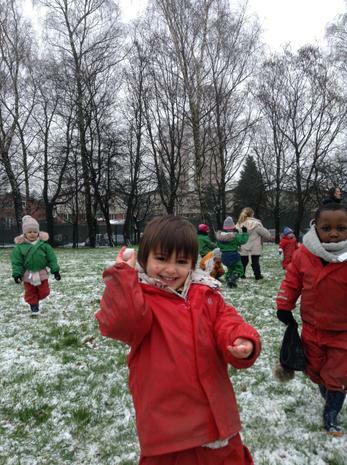 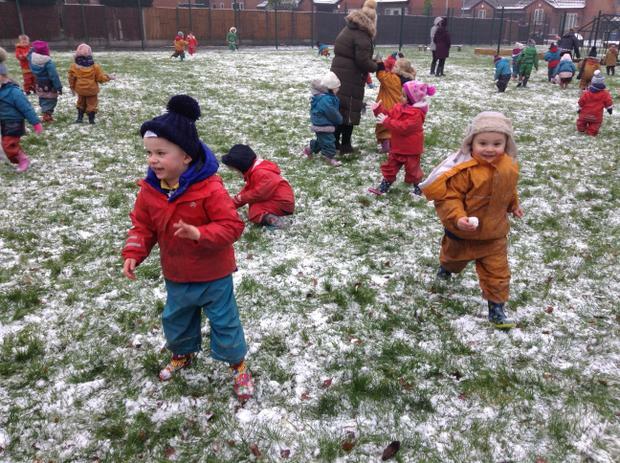 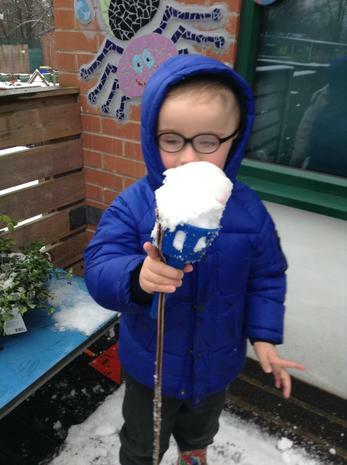 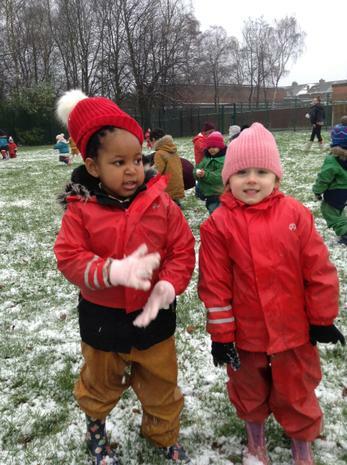 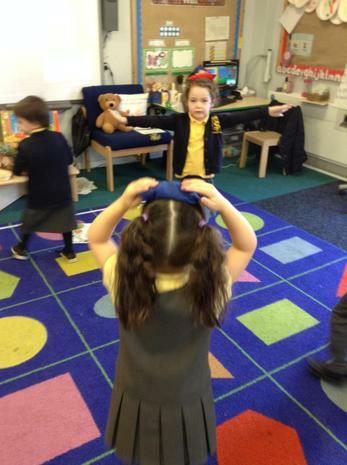 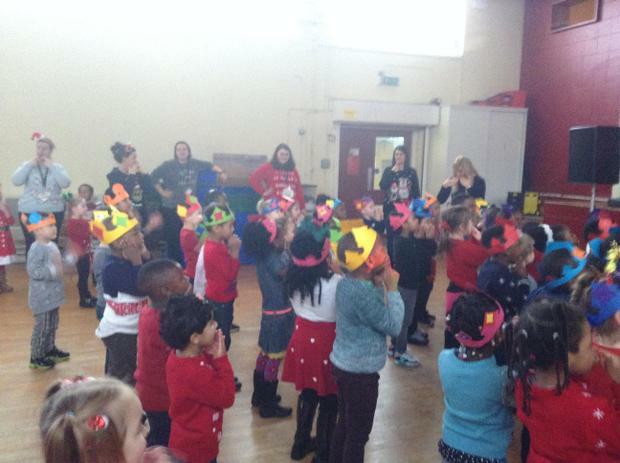 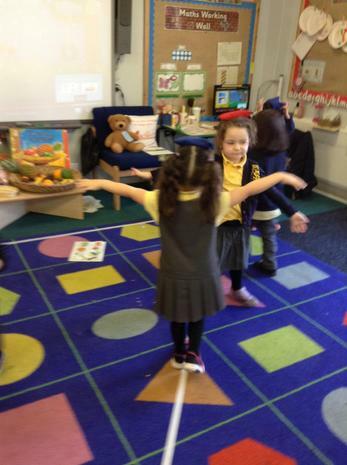 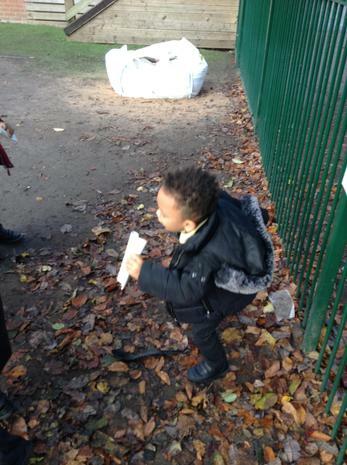 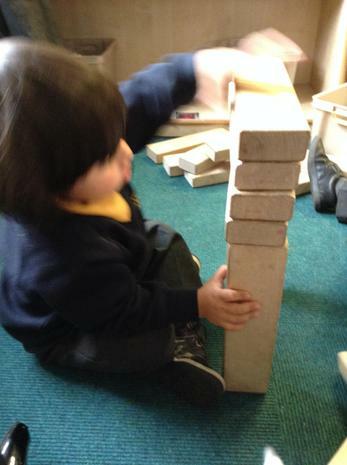 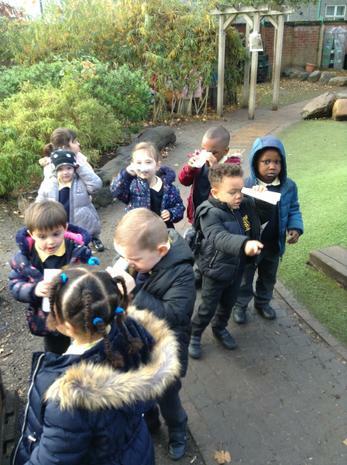 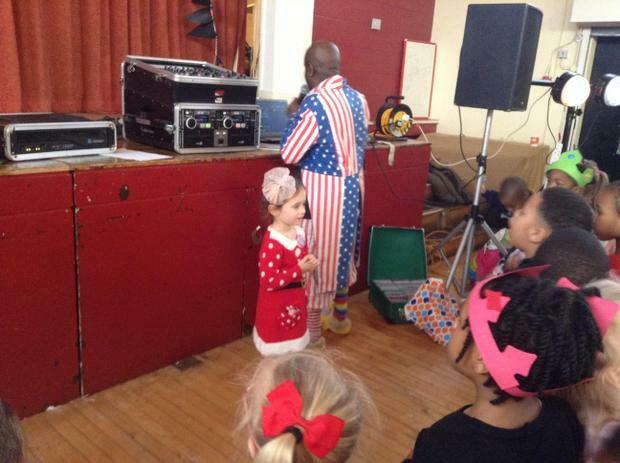 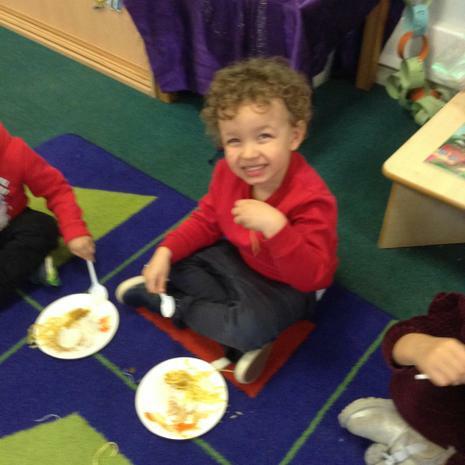 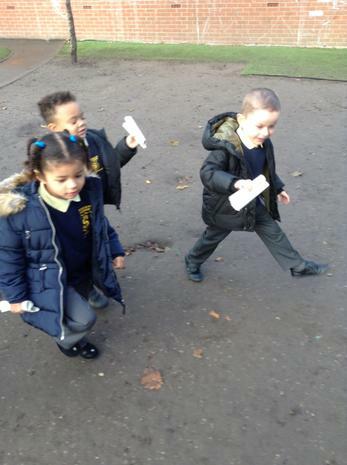 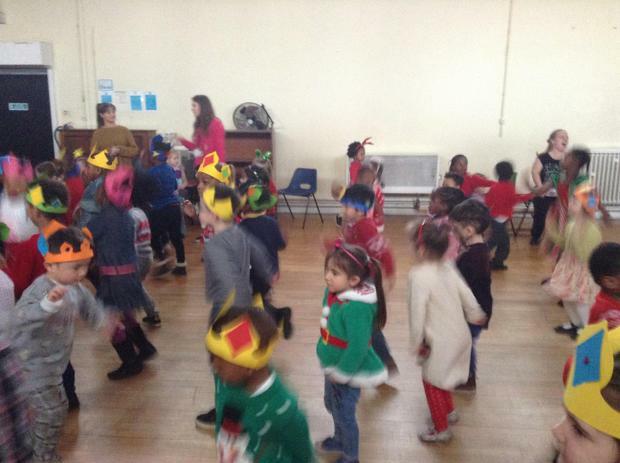 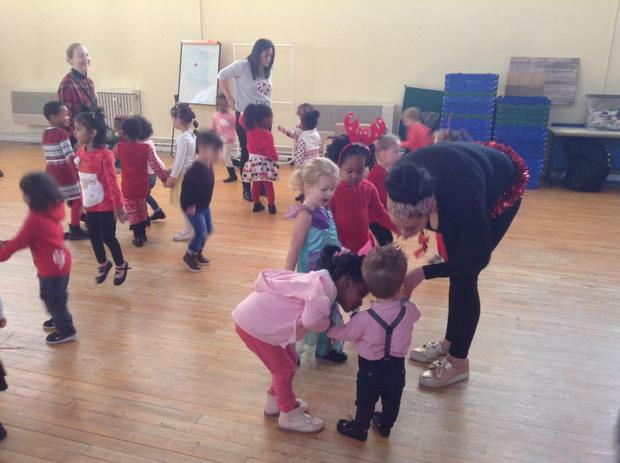 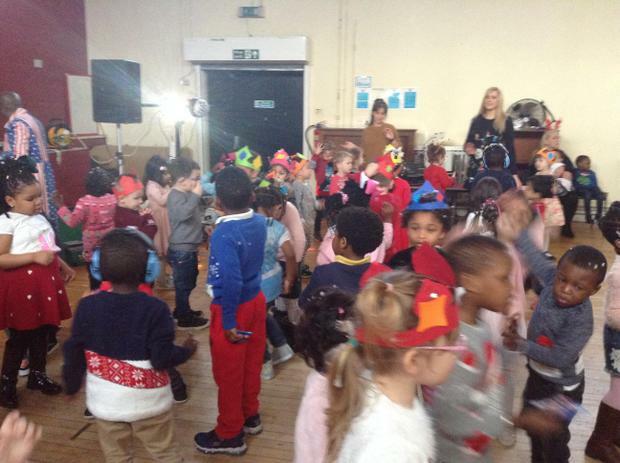 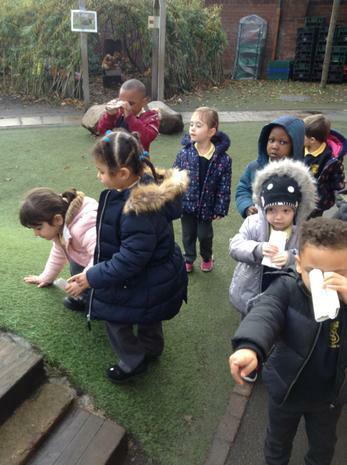 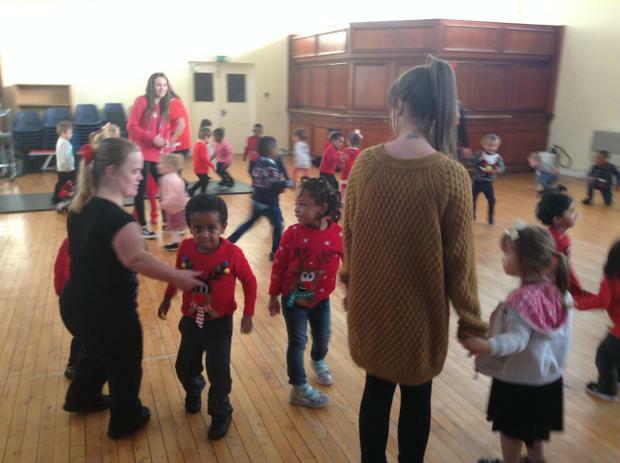 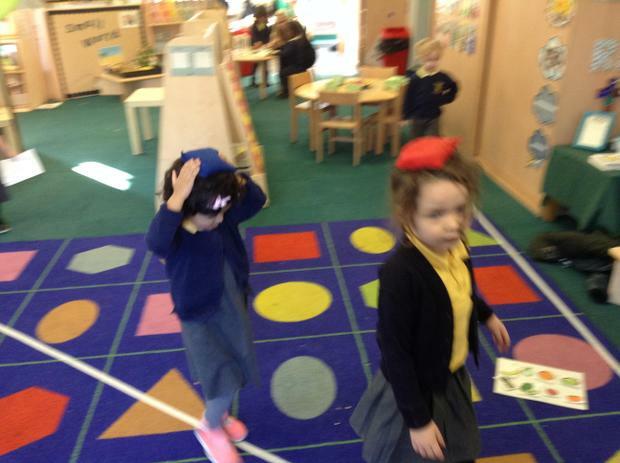 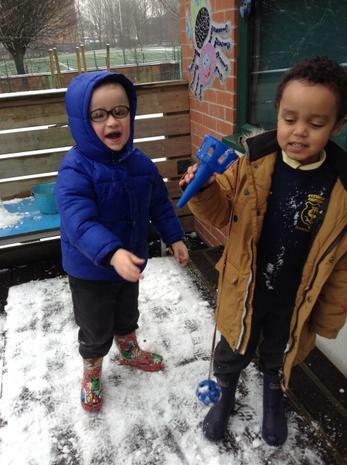 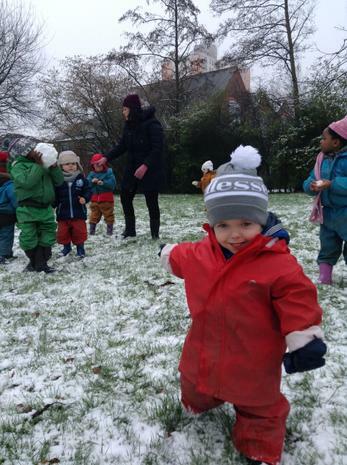 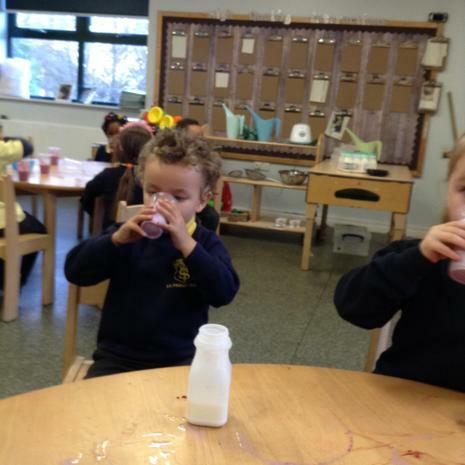 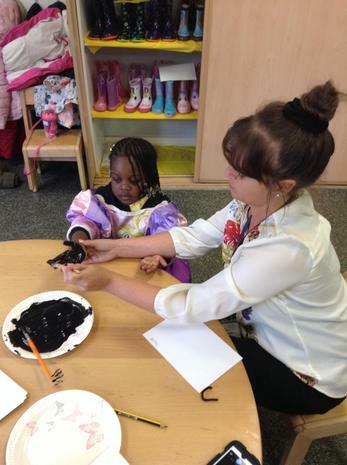 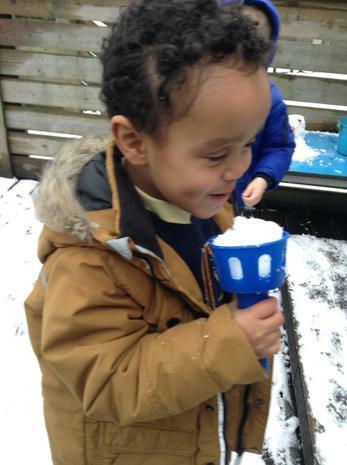 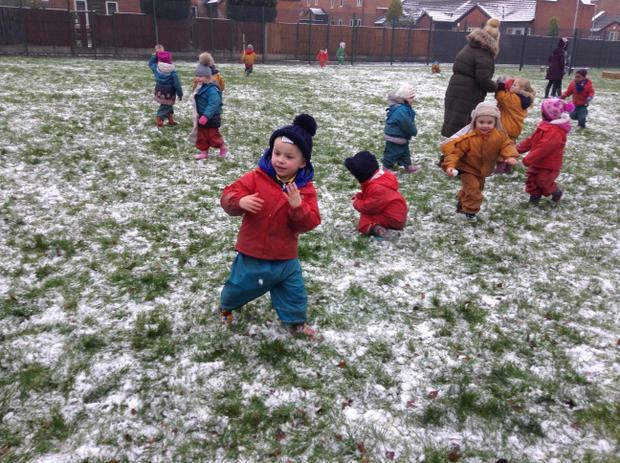 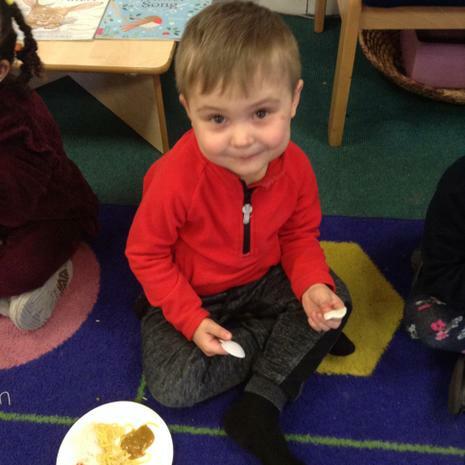 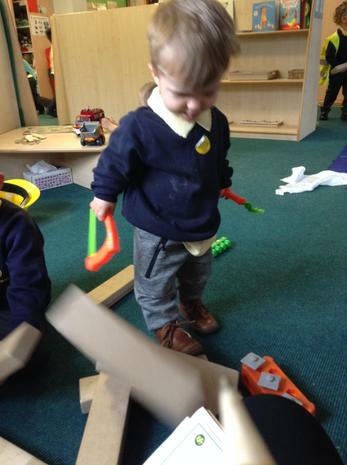 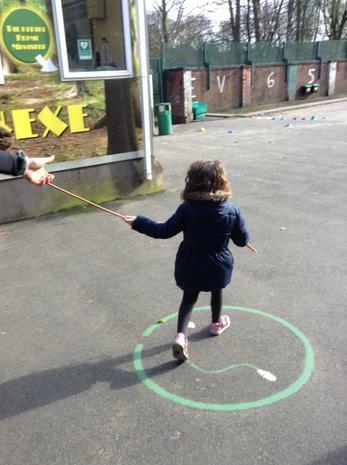 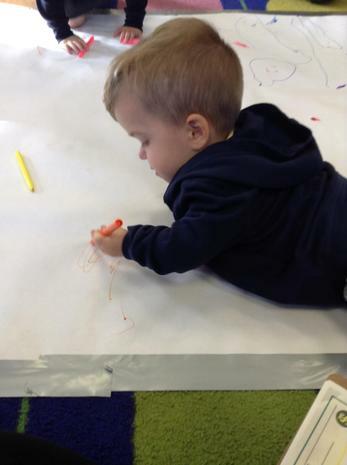 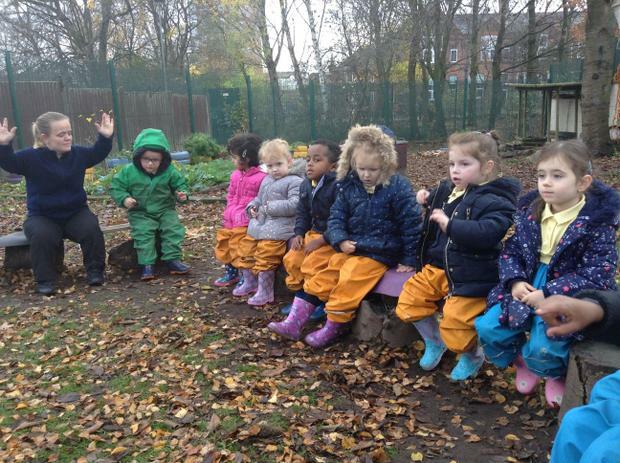 During the Autumn term, we have been focusing on learning a wide range of nursery rhymes, we really enjoy joining in with the actions and the words! 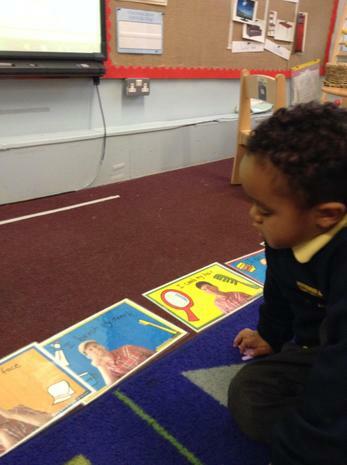 This has really helped us with our listening and attention during group time, particularly phonics where we have to really use our listening ears to tune in to the different sounds. 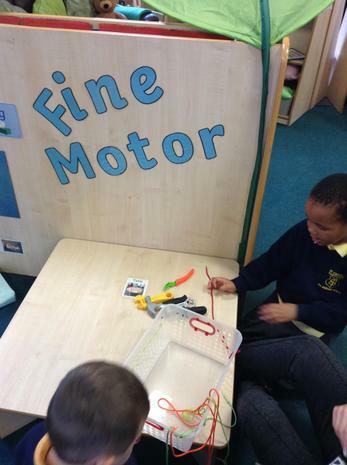 We have included some of our favourites below. 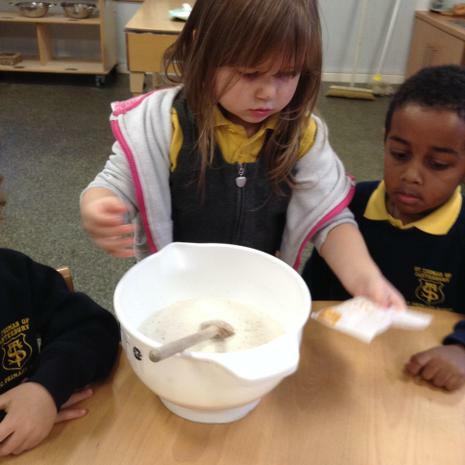 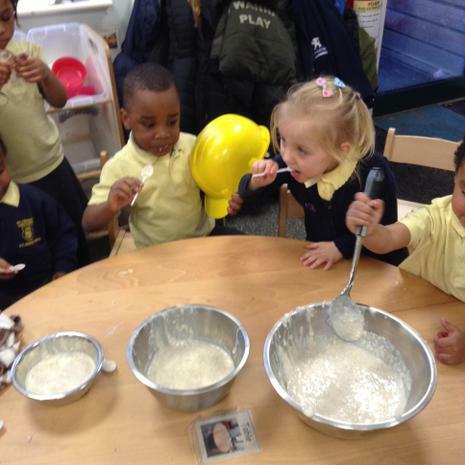 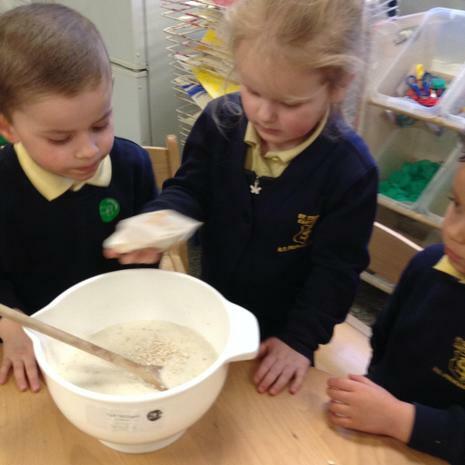 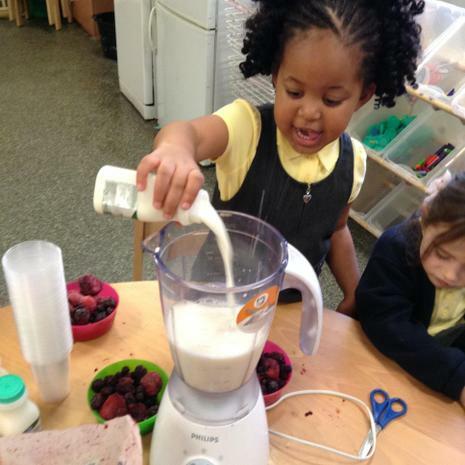 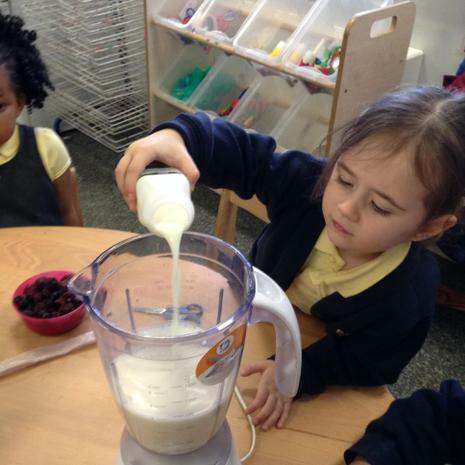 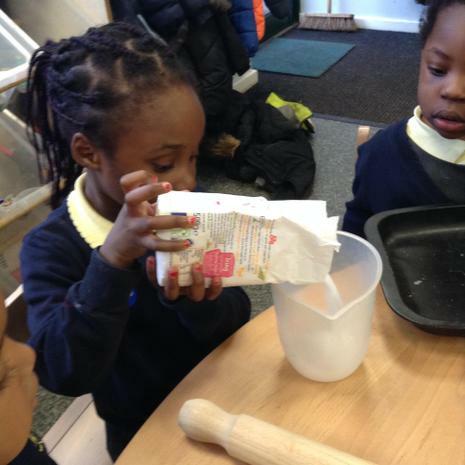 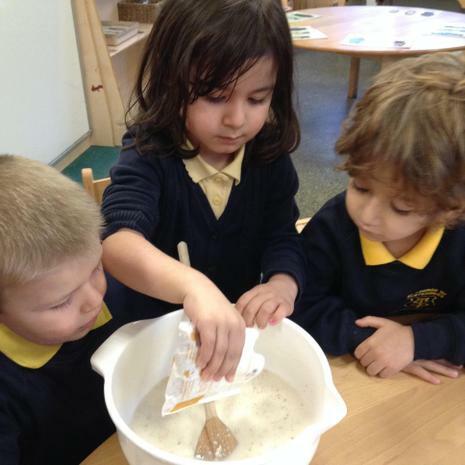 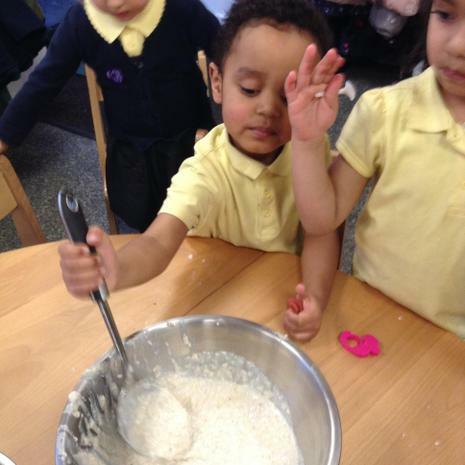 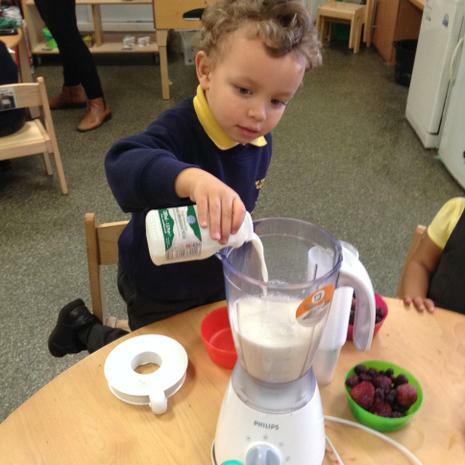 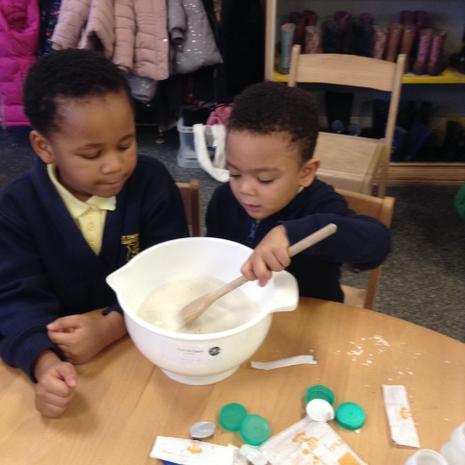 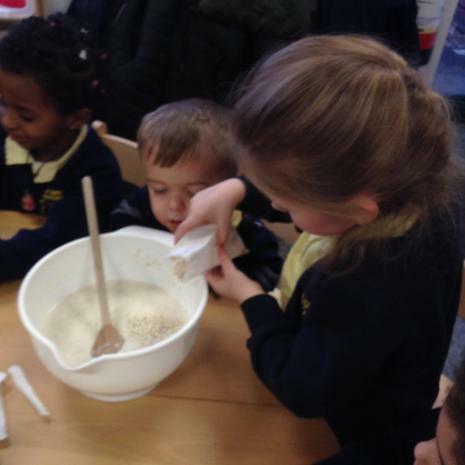 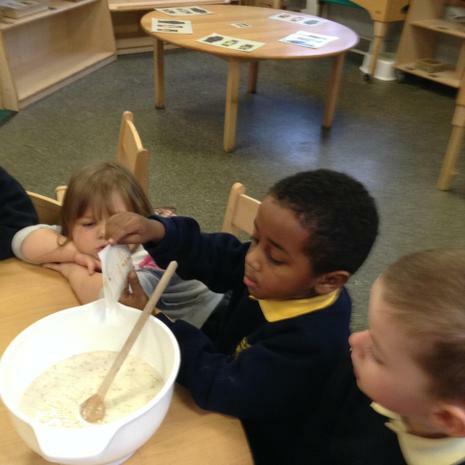 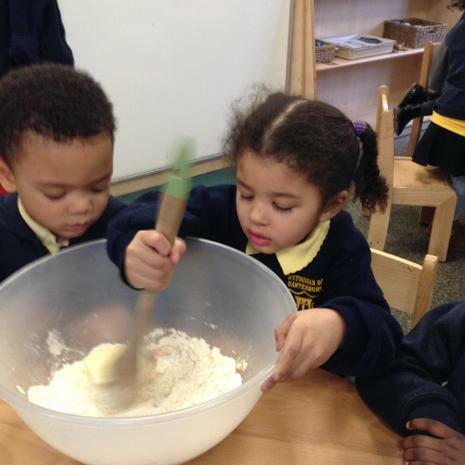 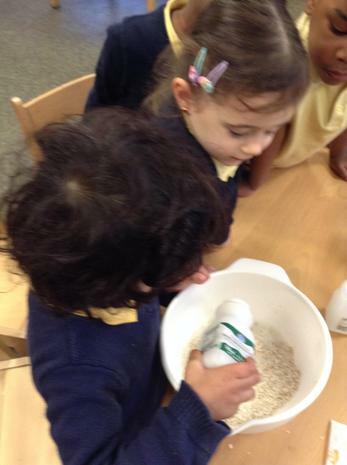 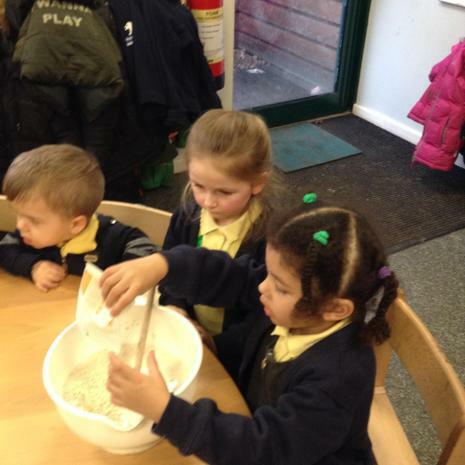 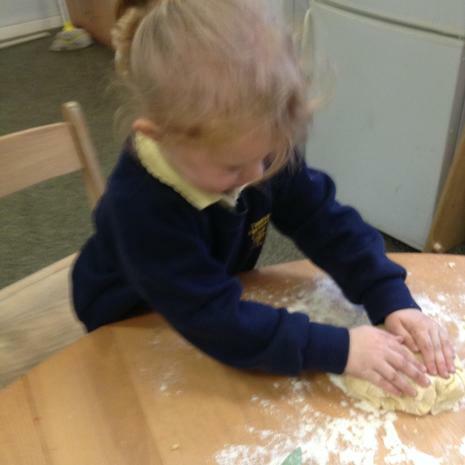 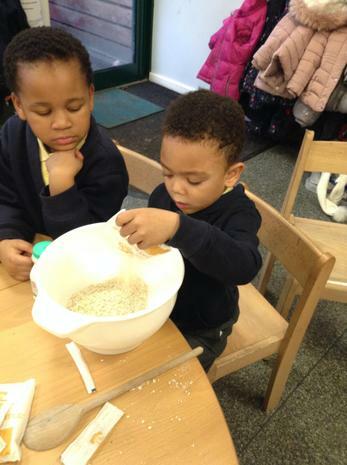 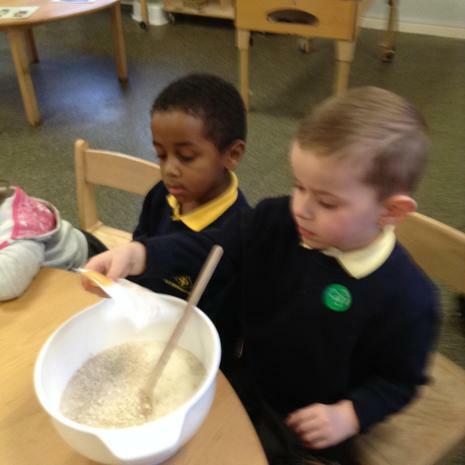 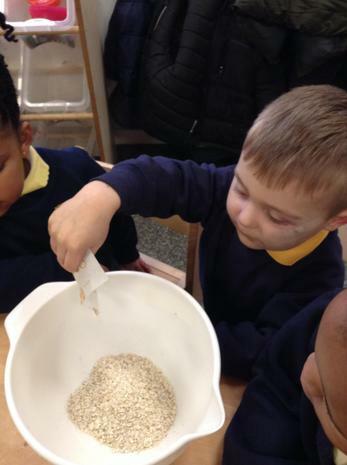 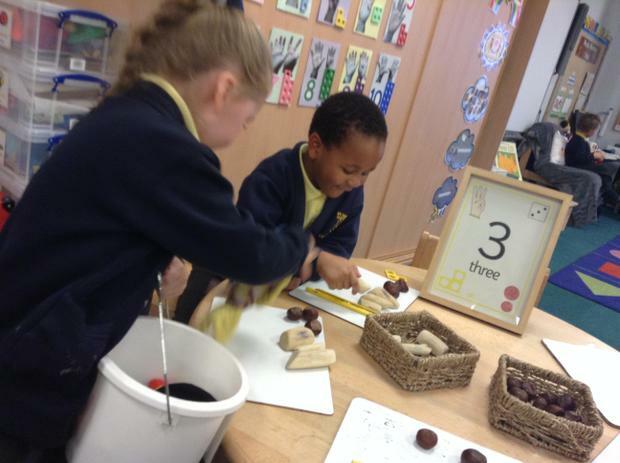 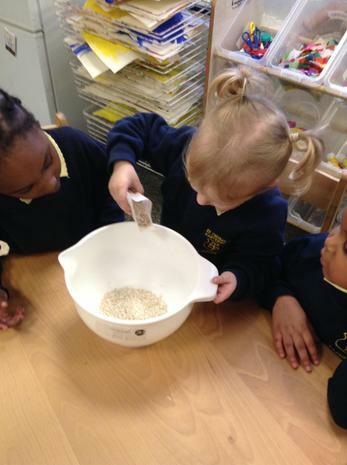 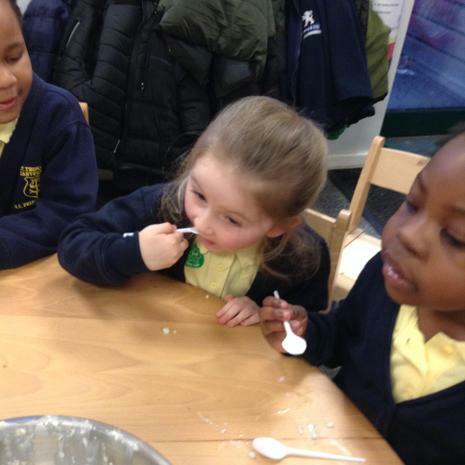 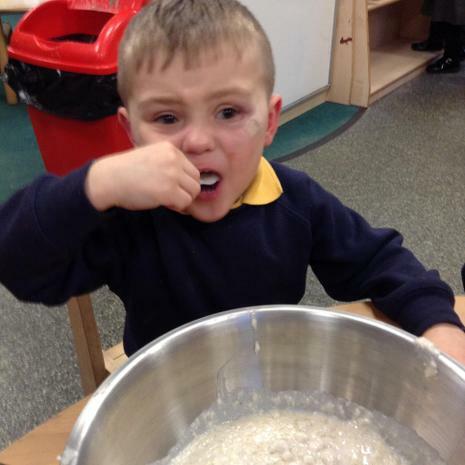 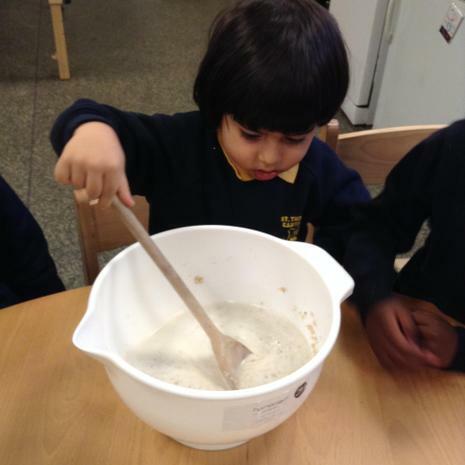 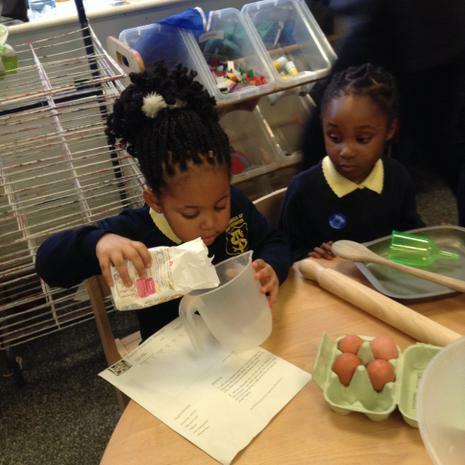 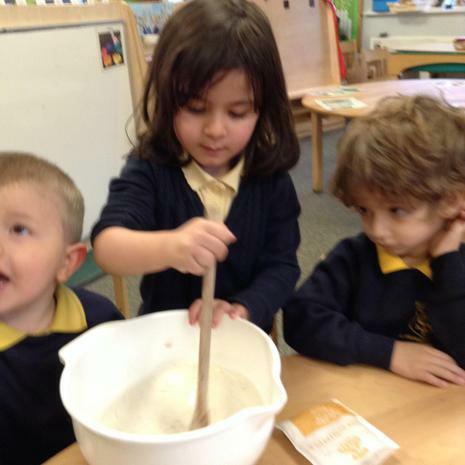 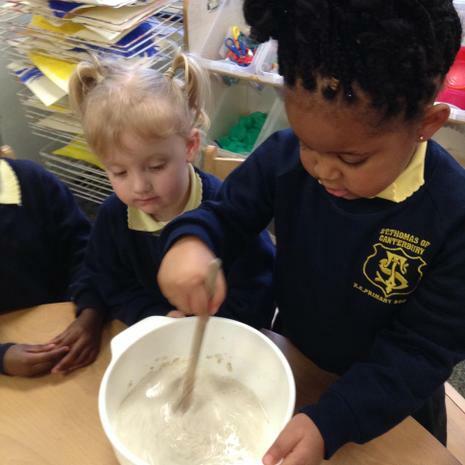 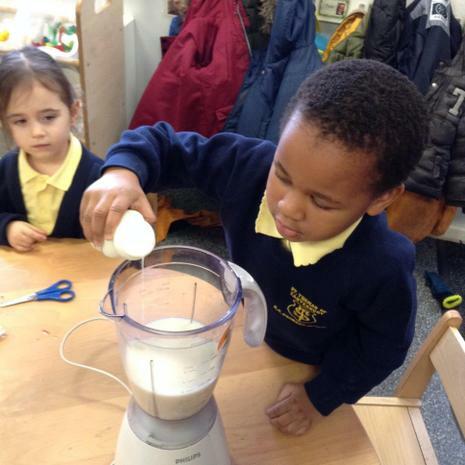 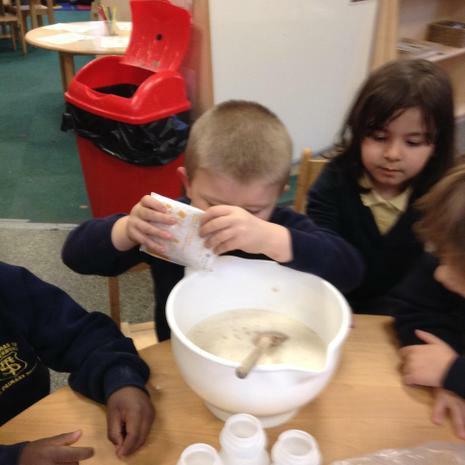 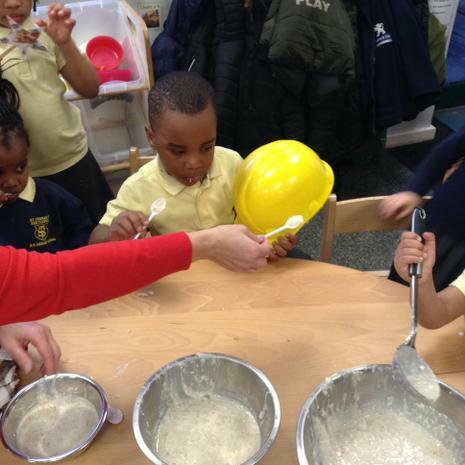 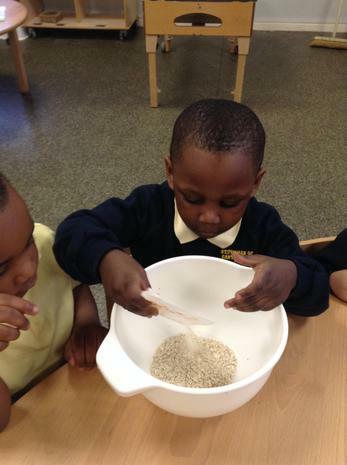 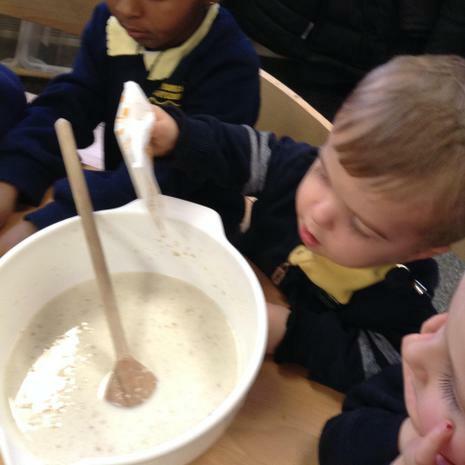 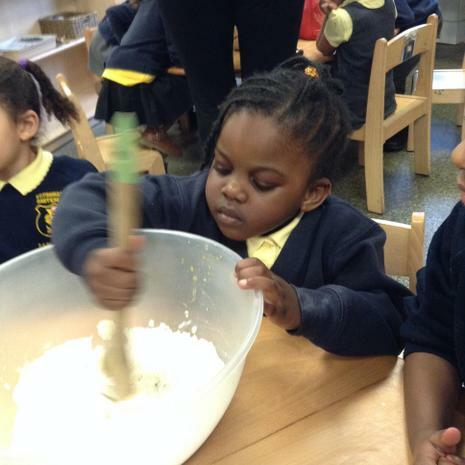 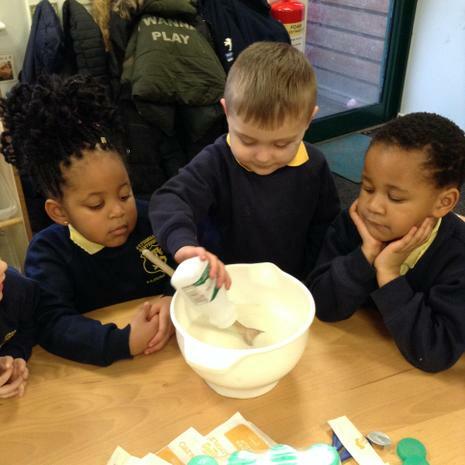 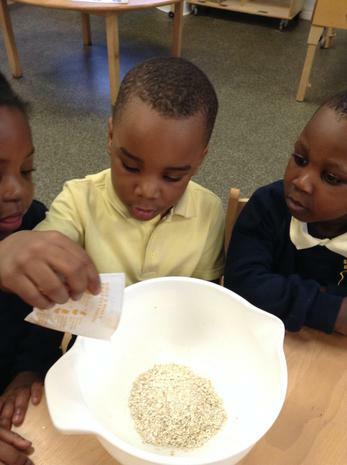 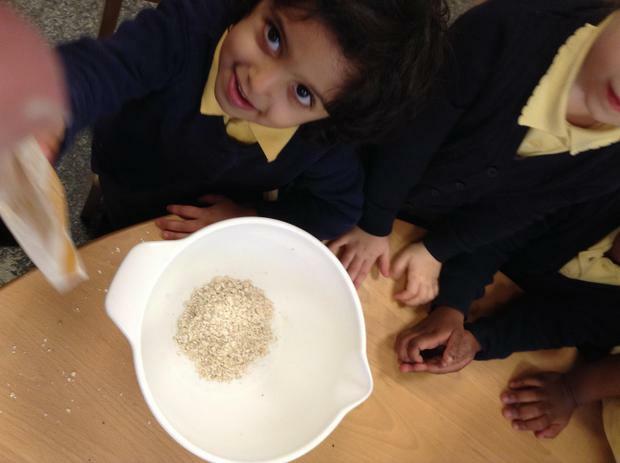 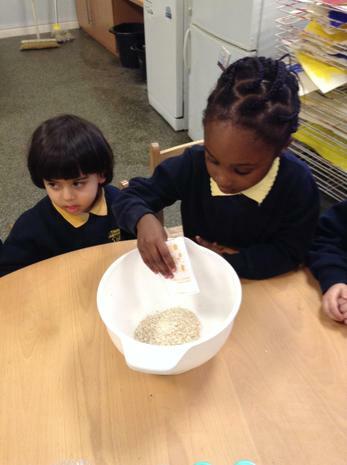 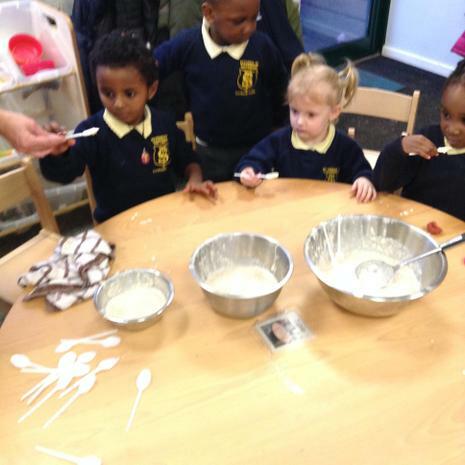 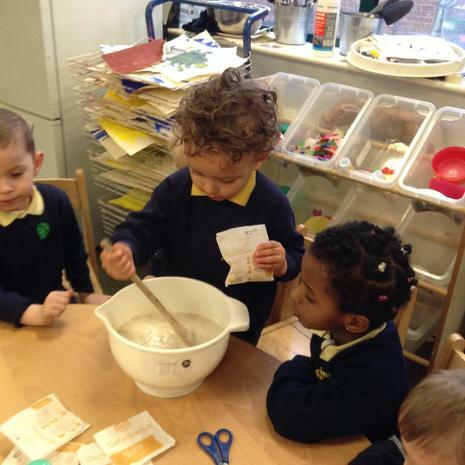 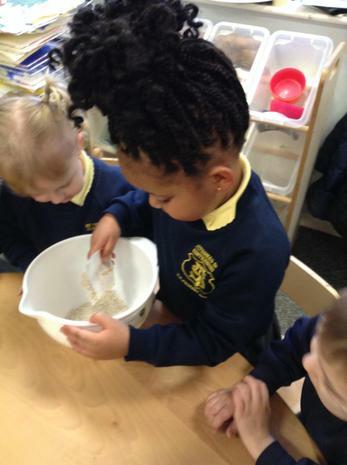 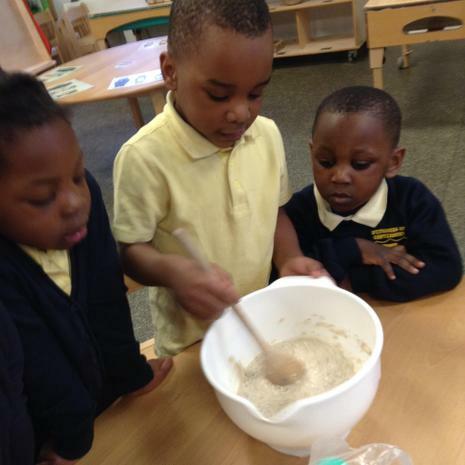 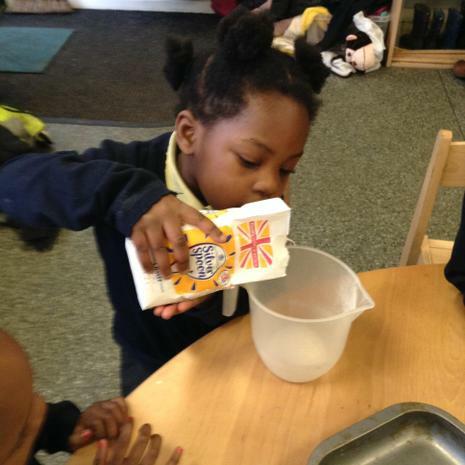 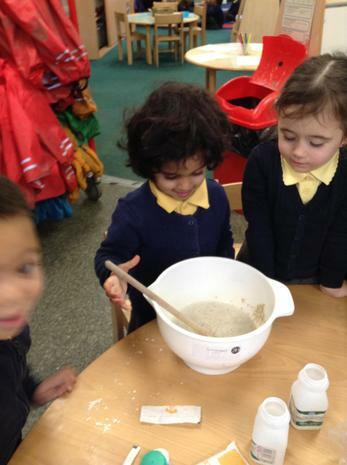 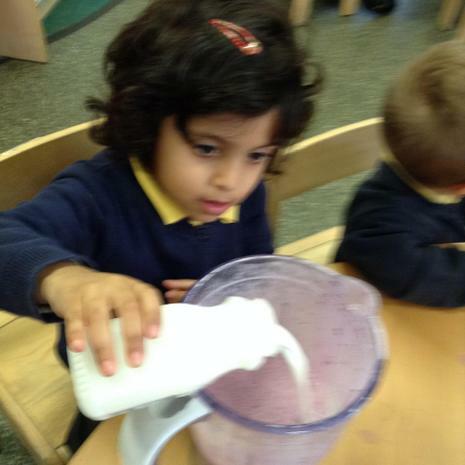 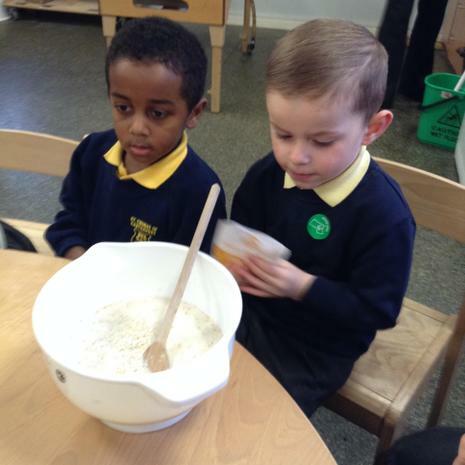 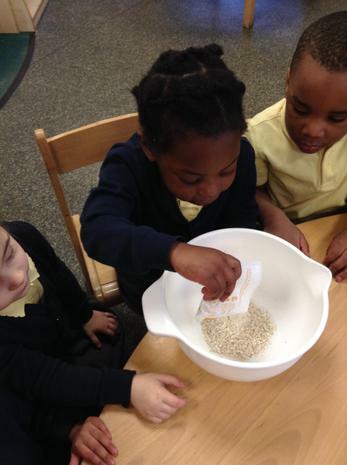 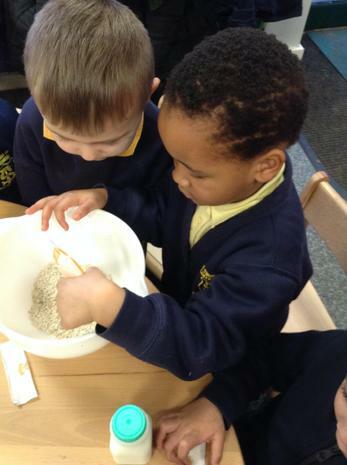 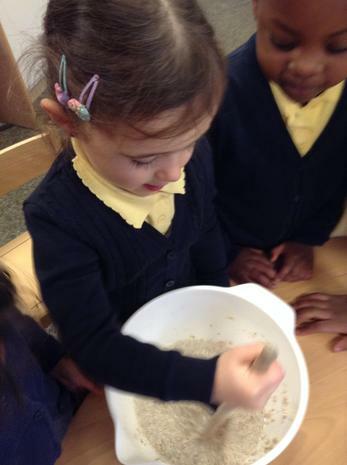 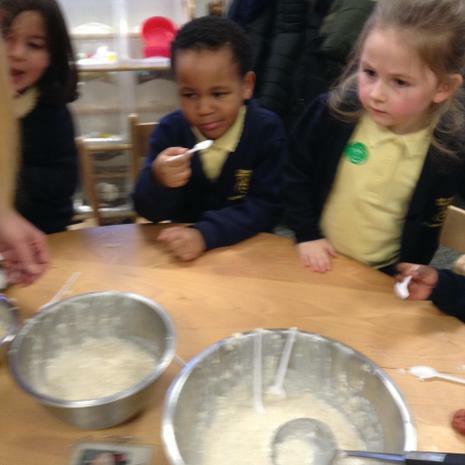 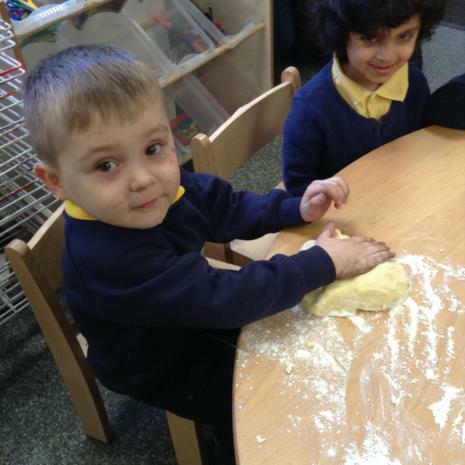 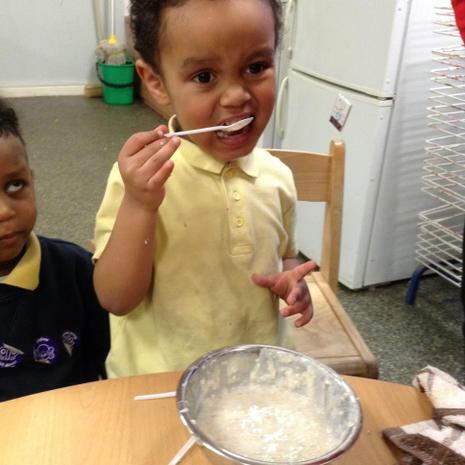 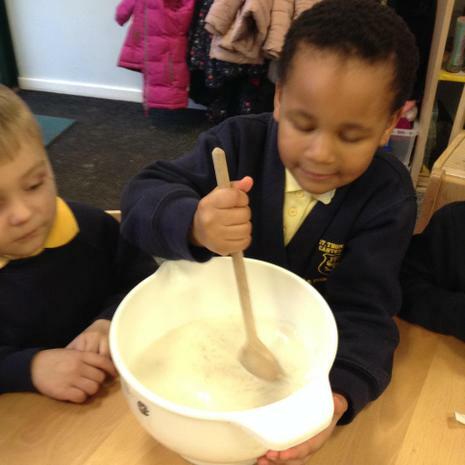 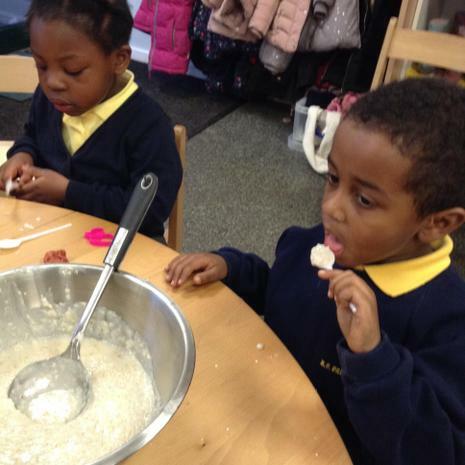 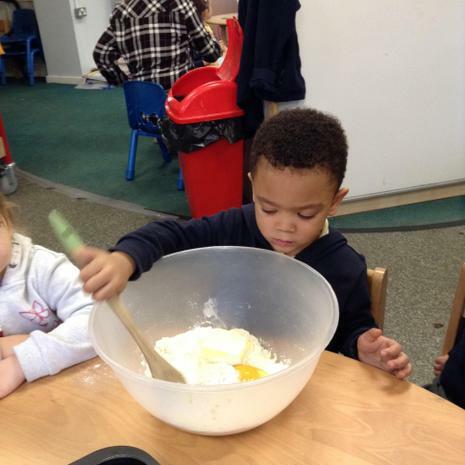 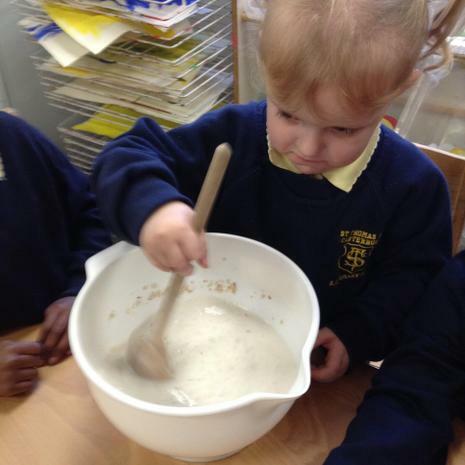 The children have been enjoying baking each Friday afternoon, where they have been working together to measure, pour and mix the ingredients. 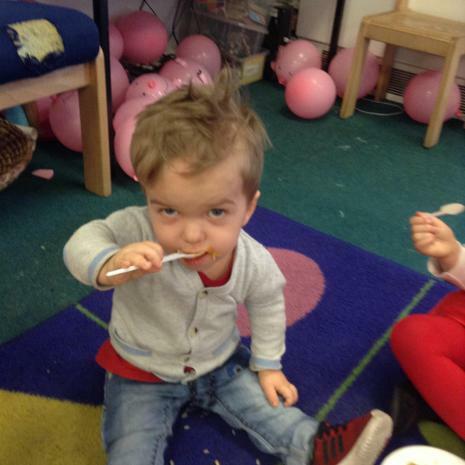 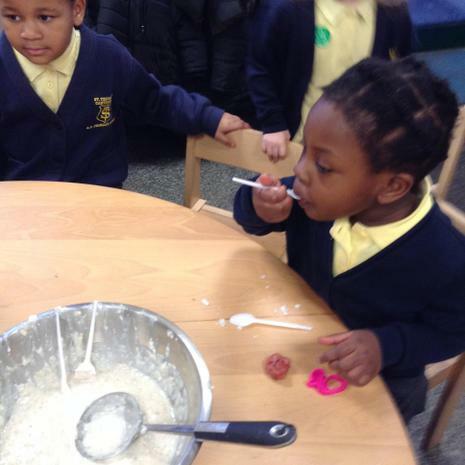 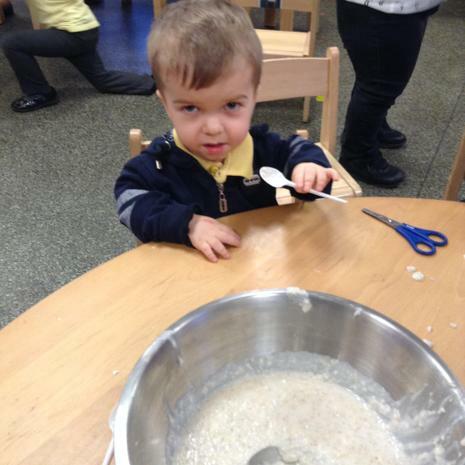 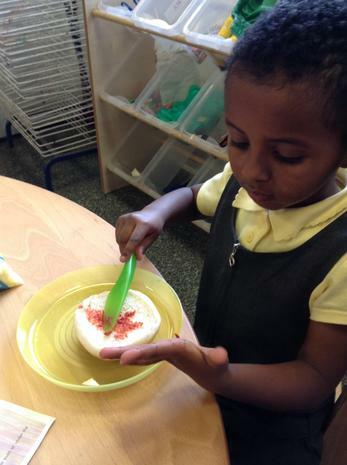 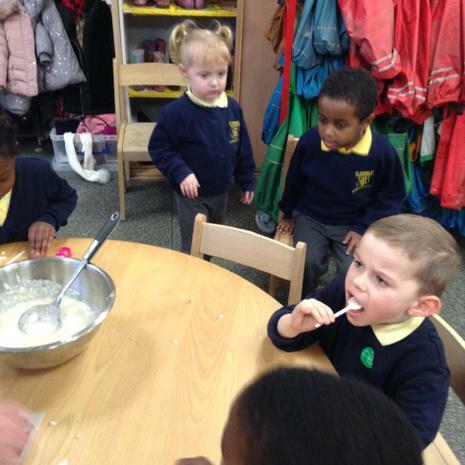 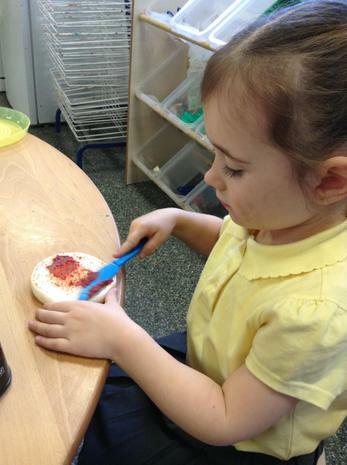 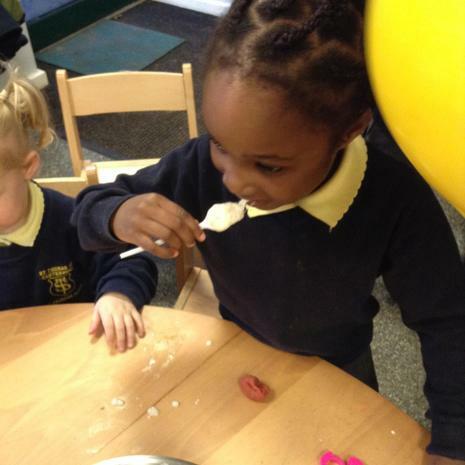 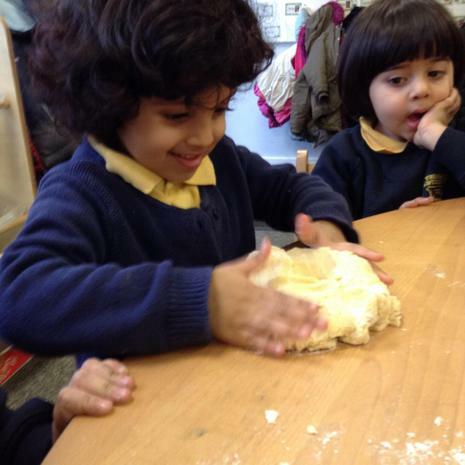 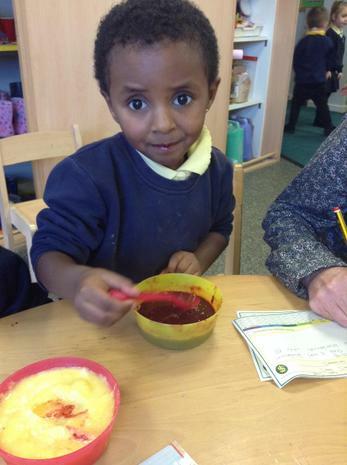 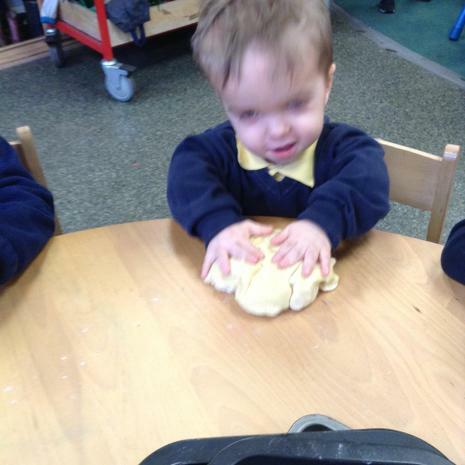 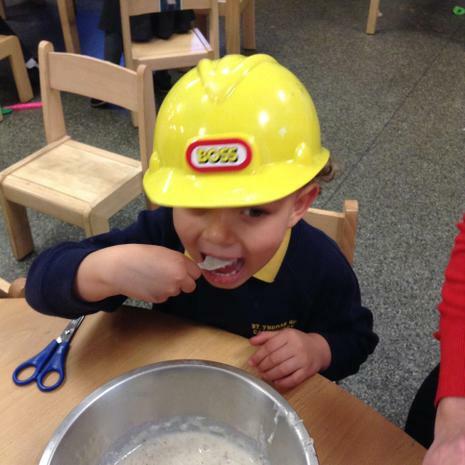 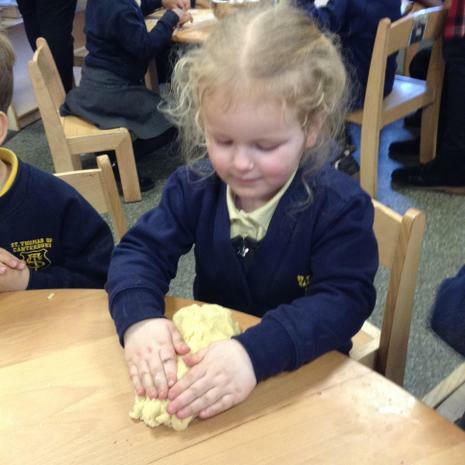 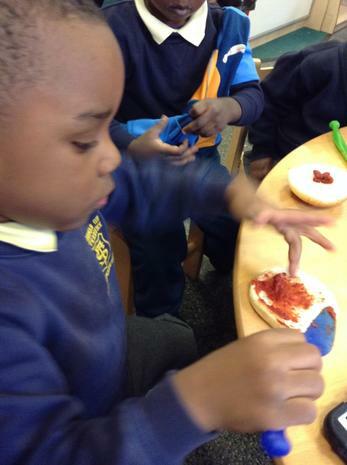 Of course, the children's favourite part of baking is decorating and eating the end product! 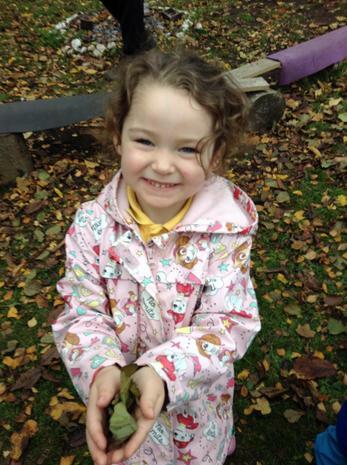 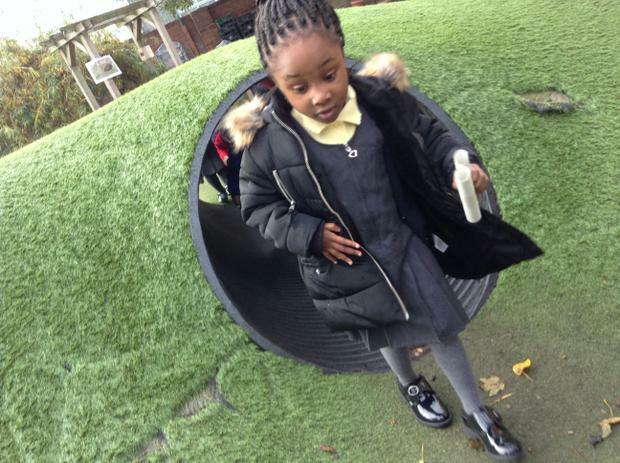 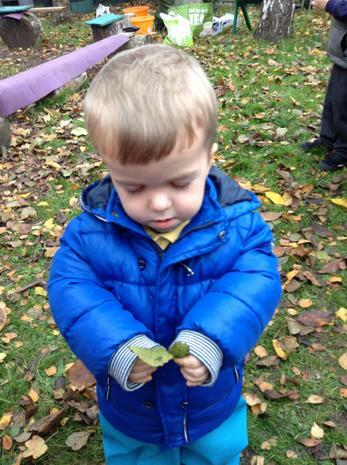 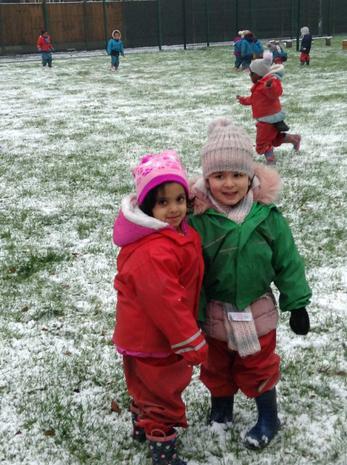 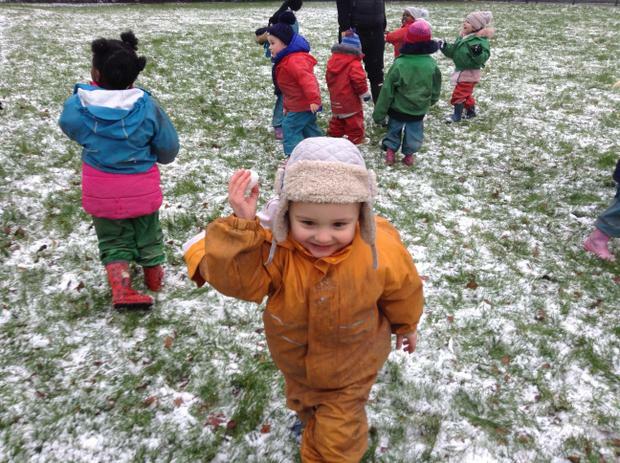 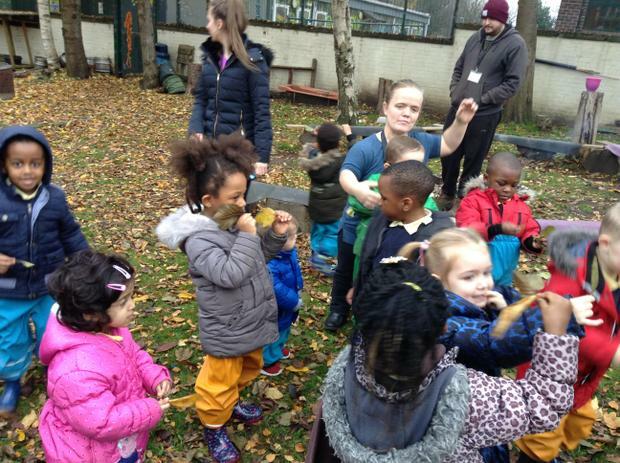 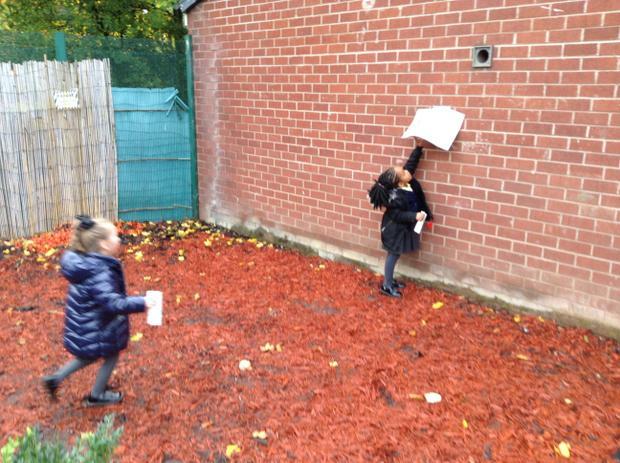 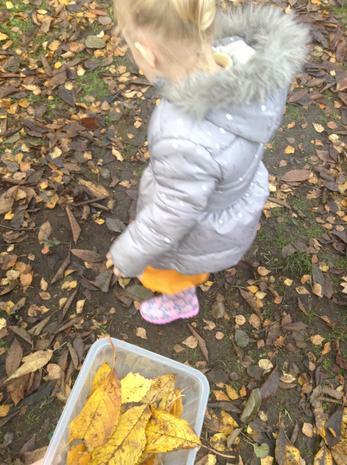 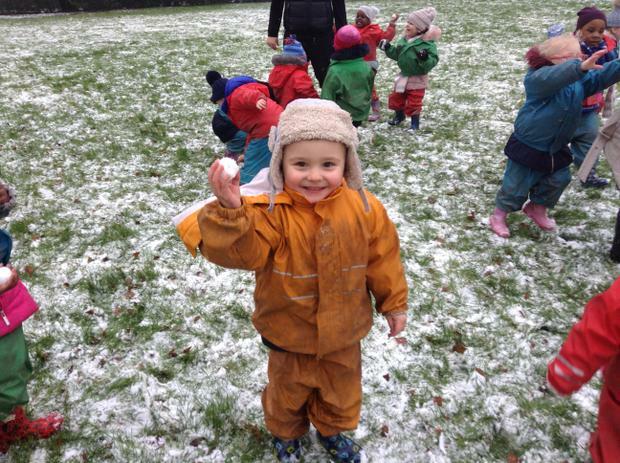 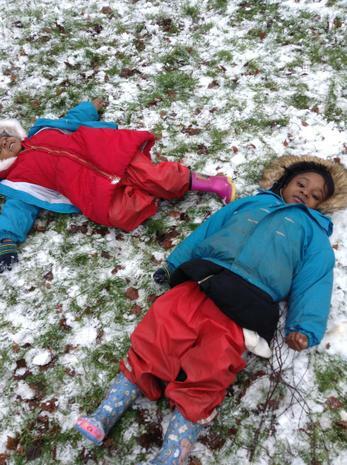 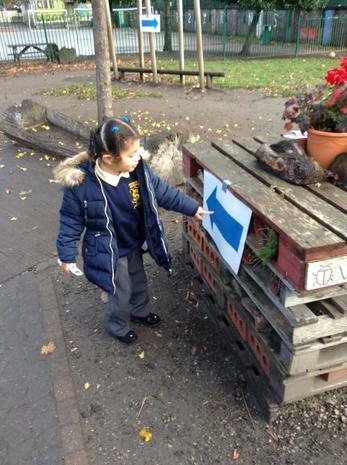 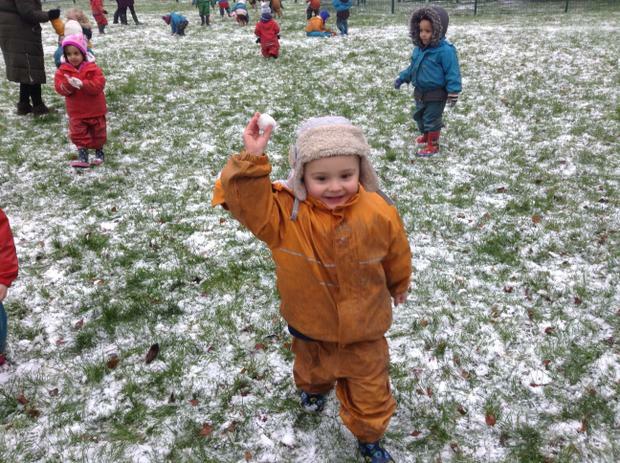 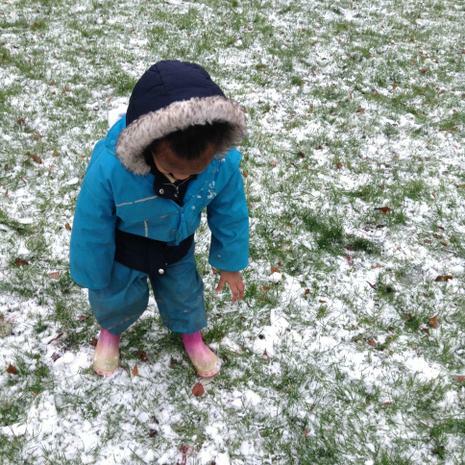 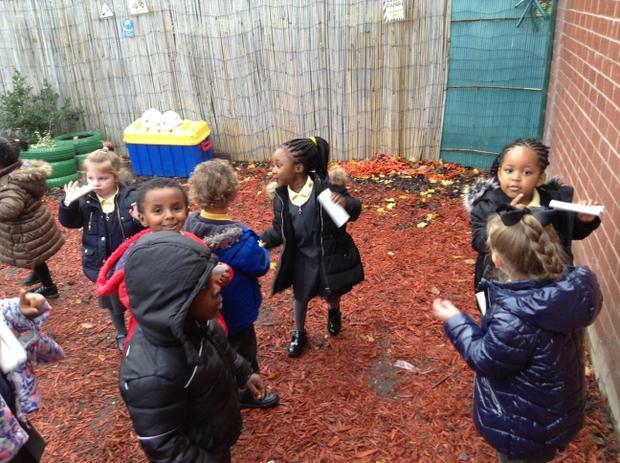 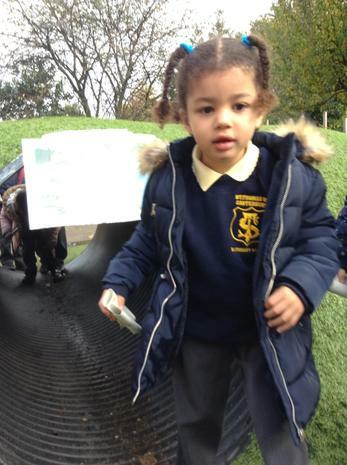 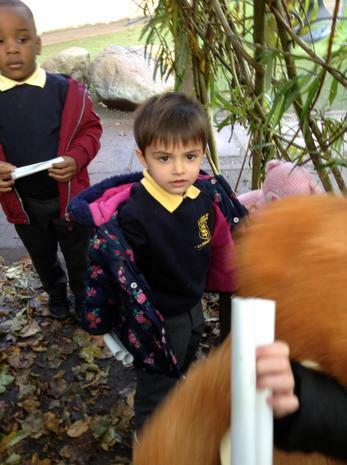 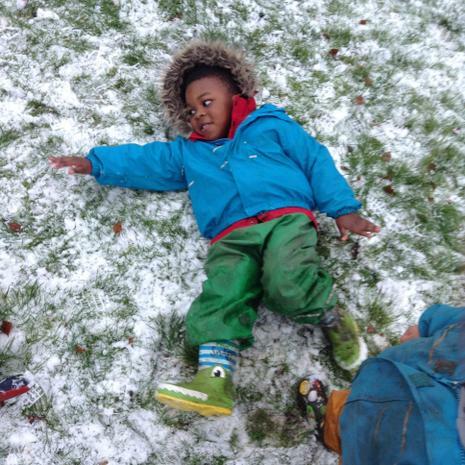 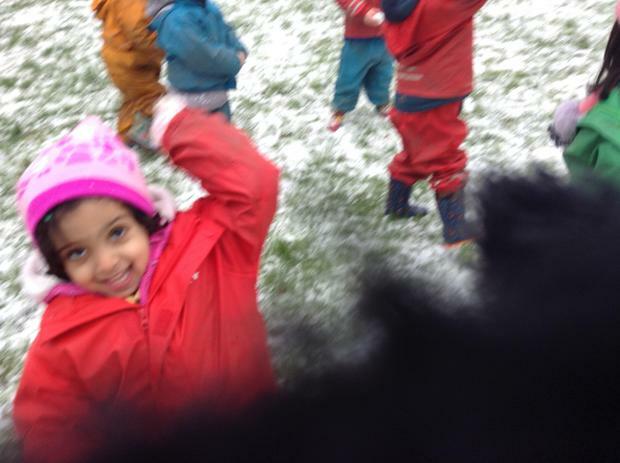 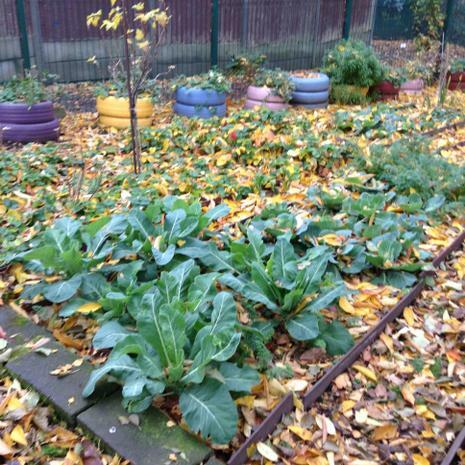 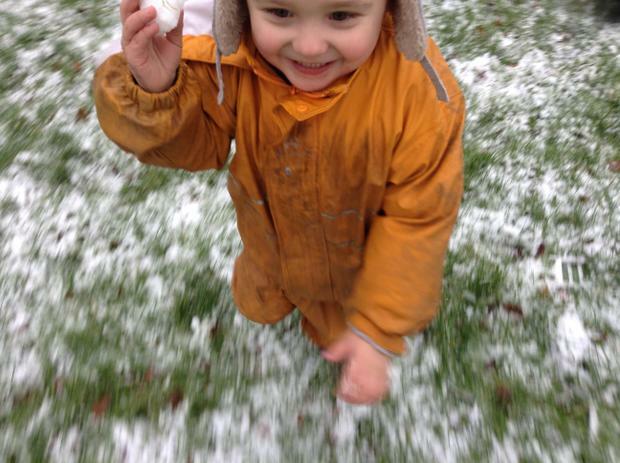 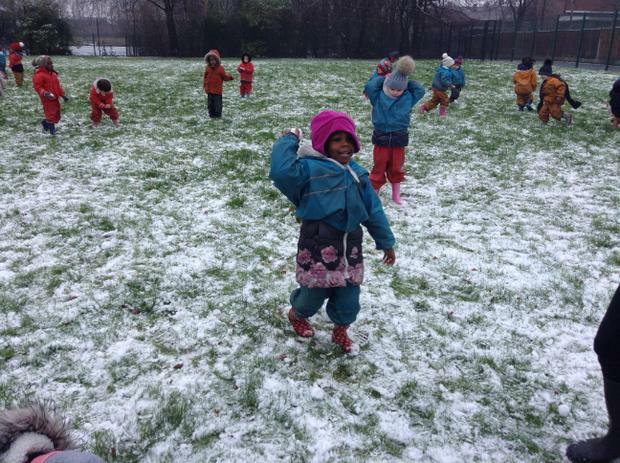 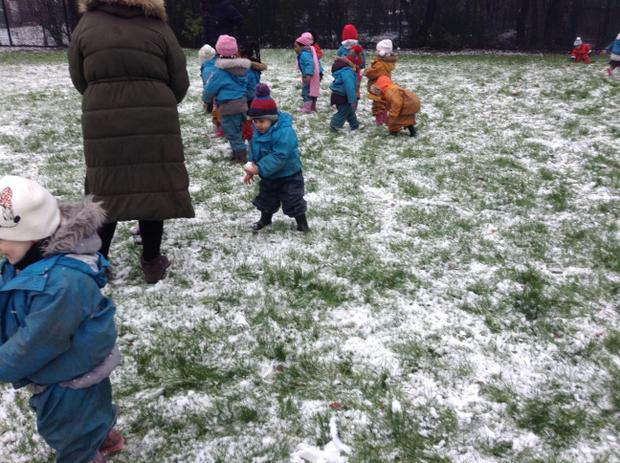 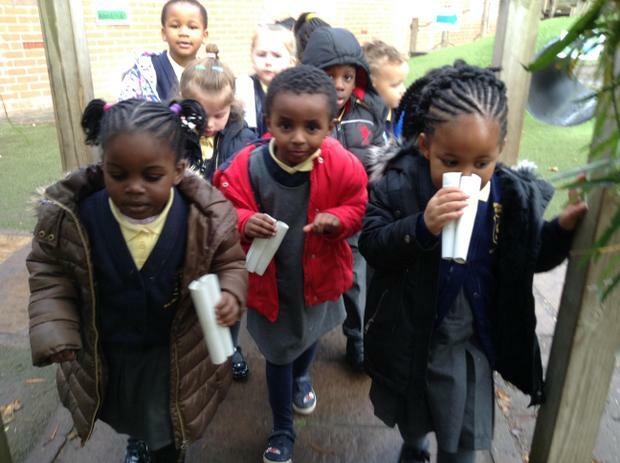 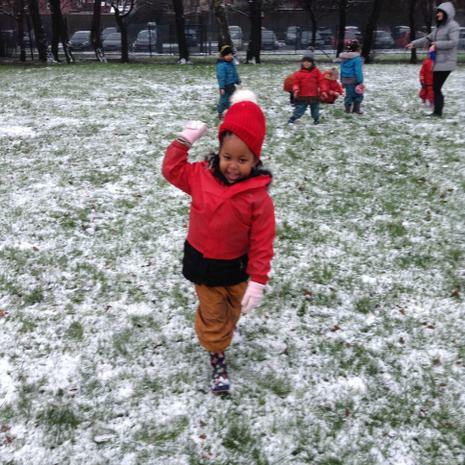 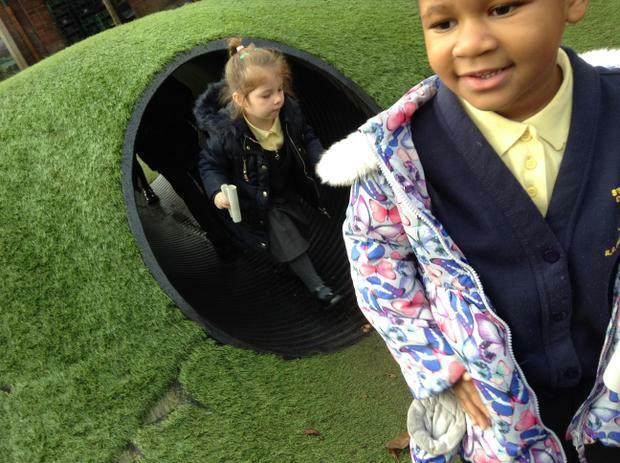 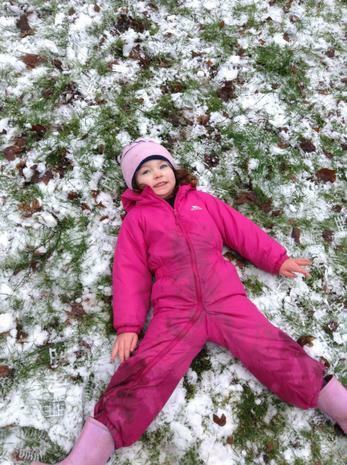 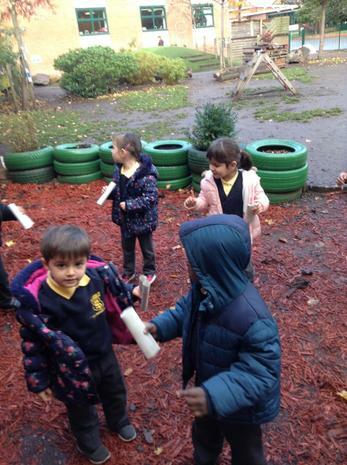 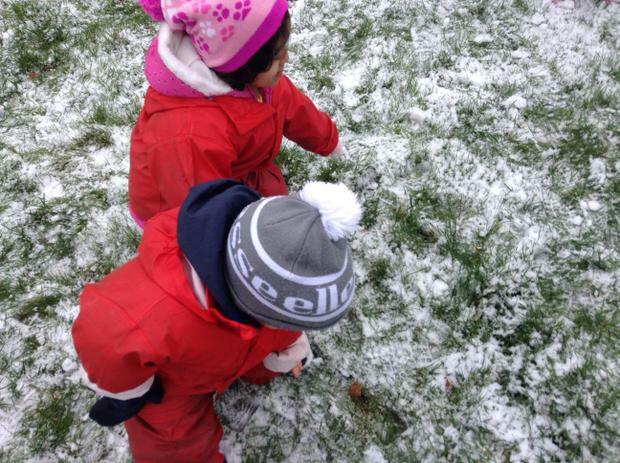 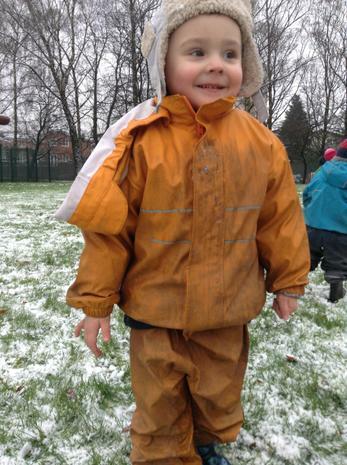 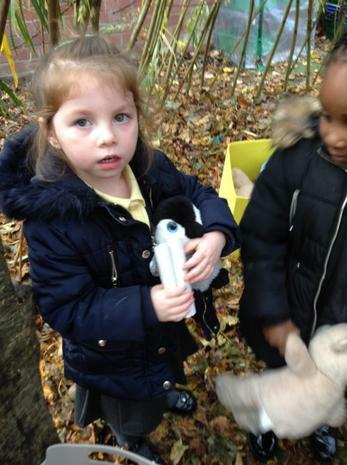 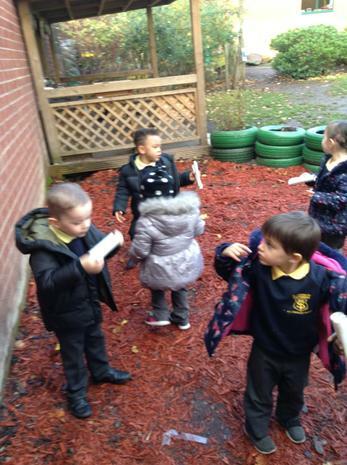 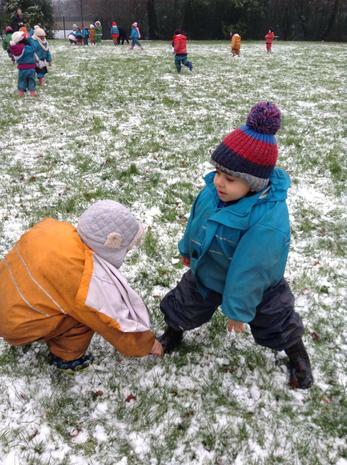 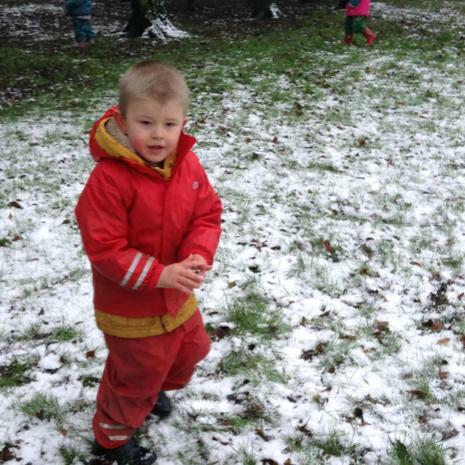 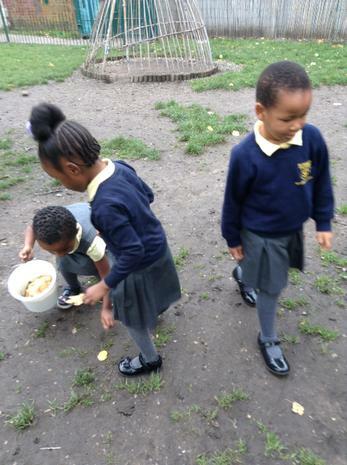 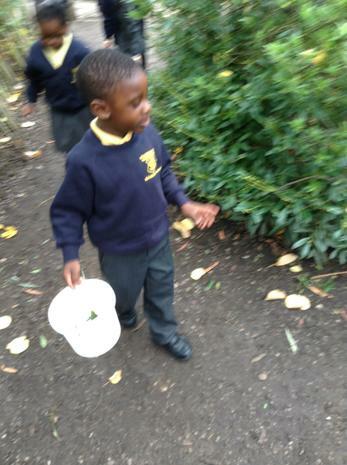 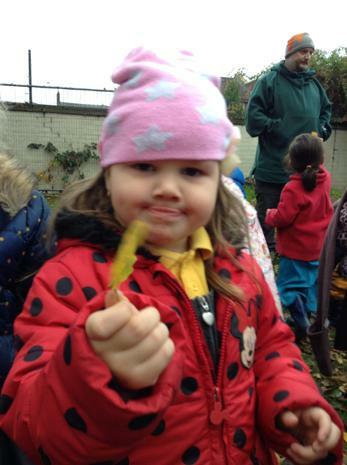 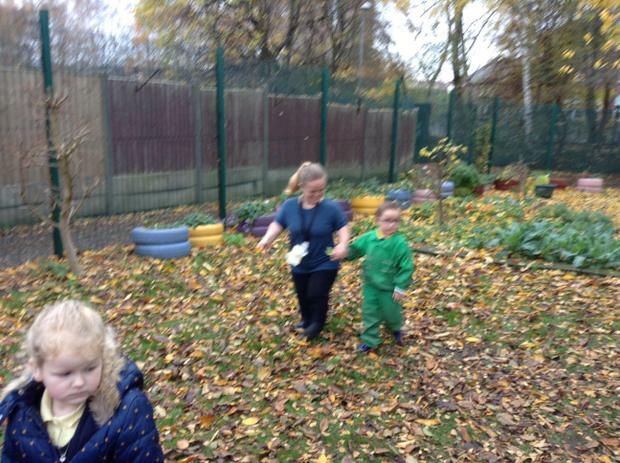 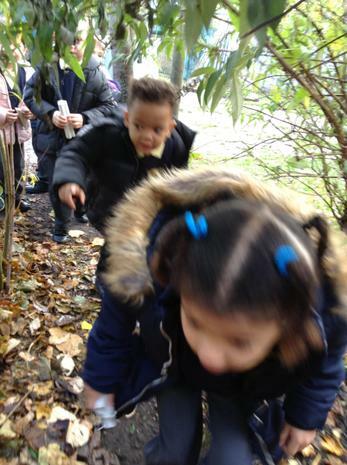 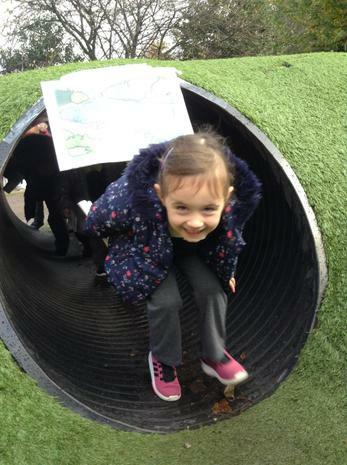 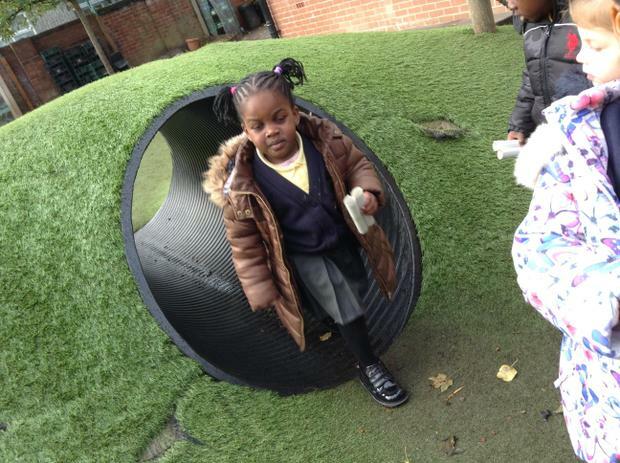 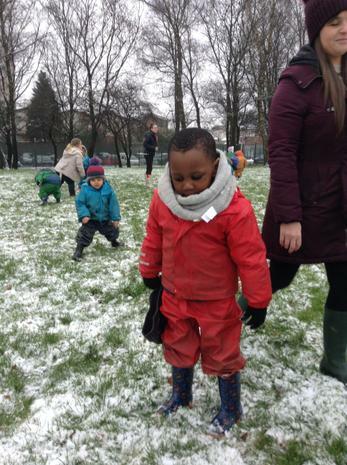 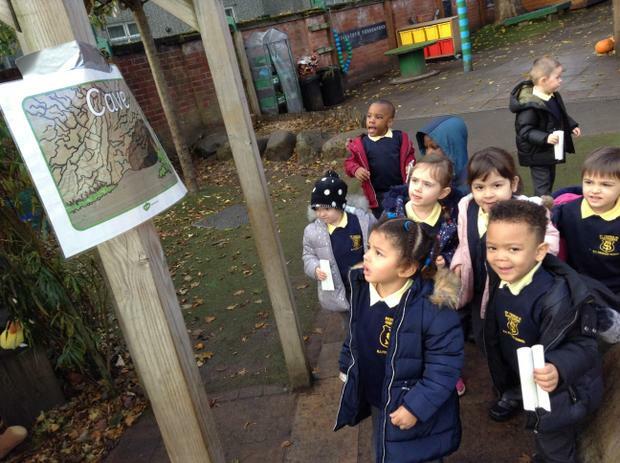 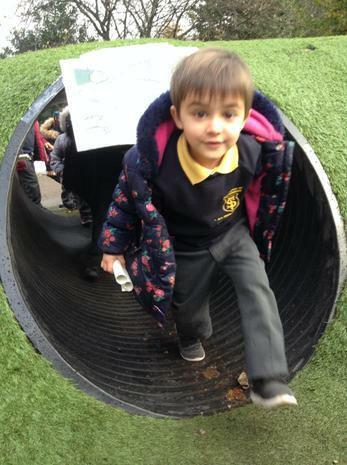 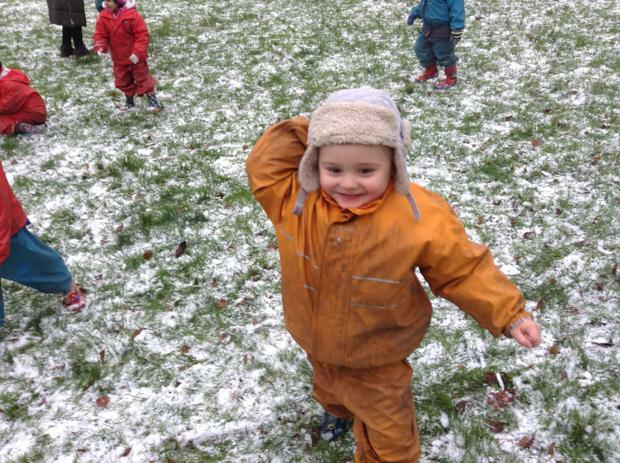 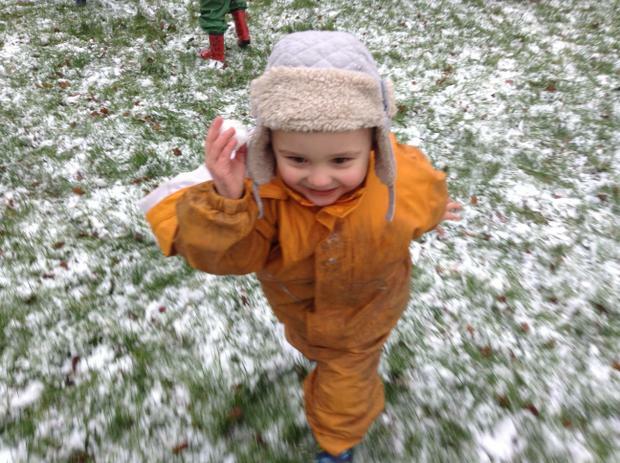 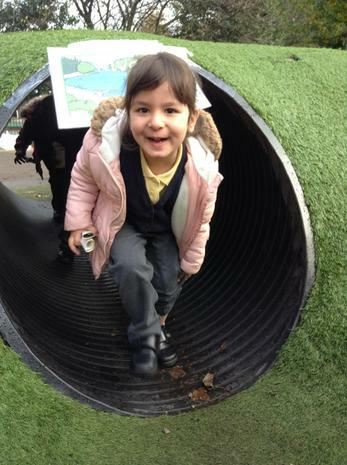 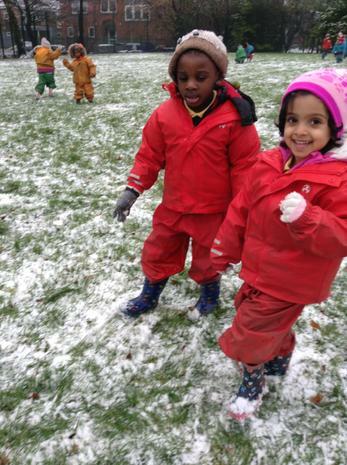 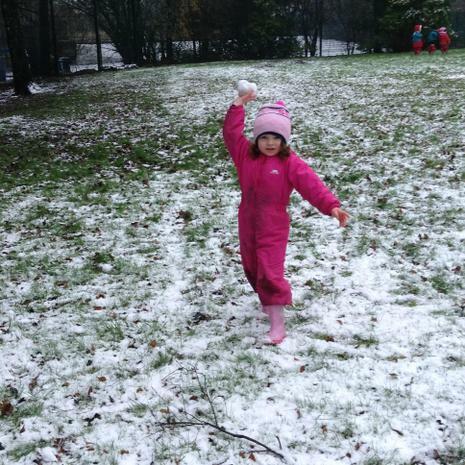 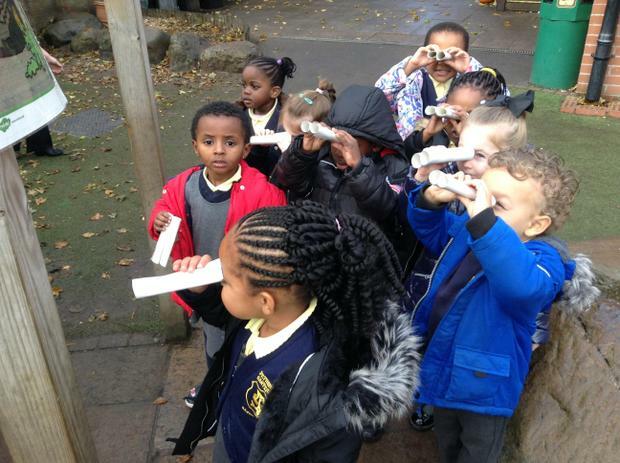 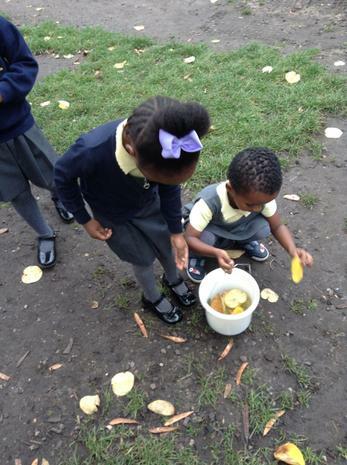 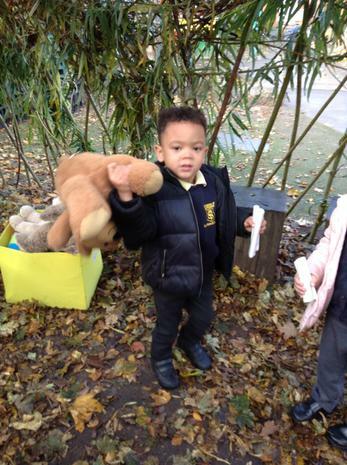 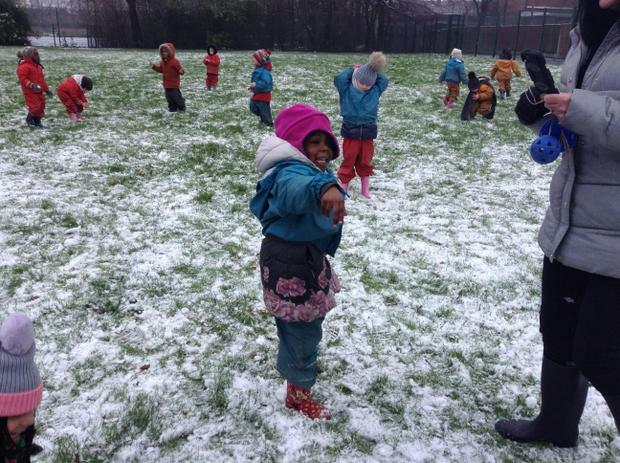 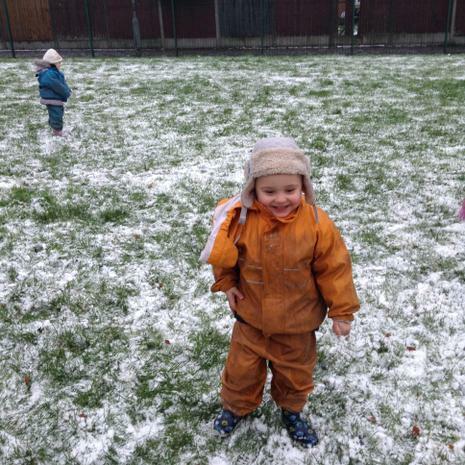 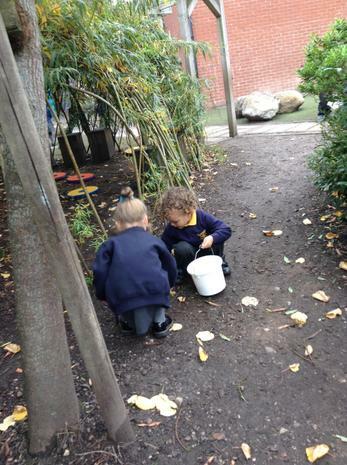 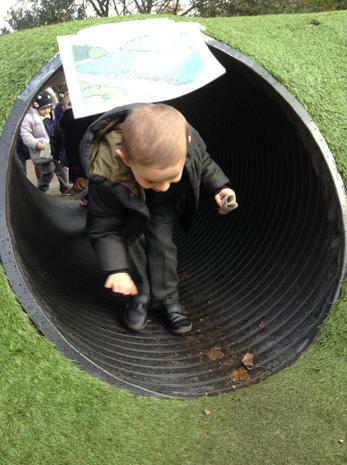 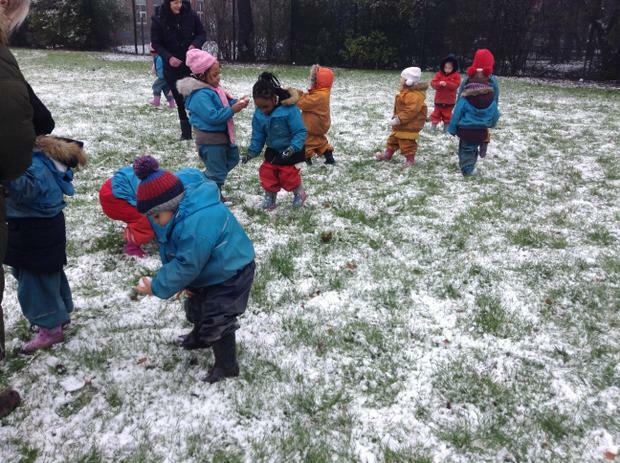 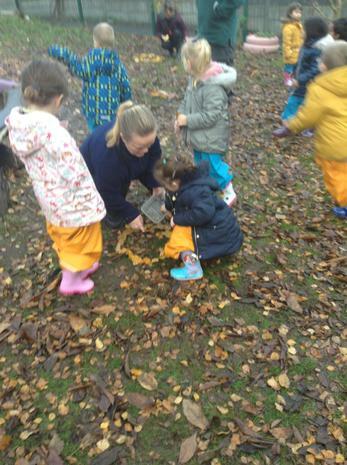 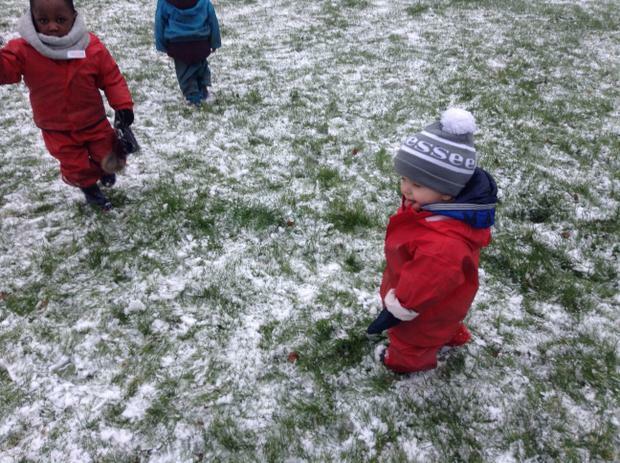 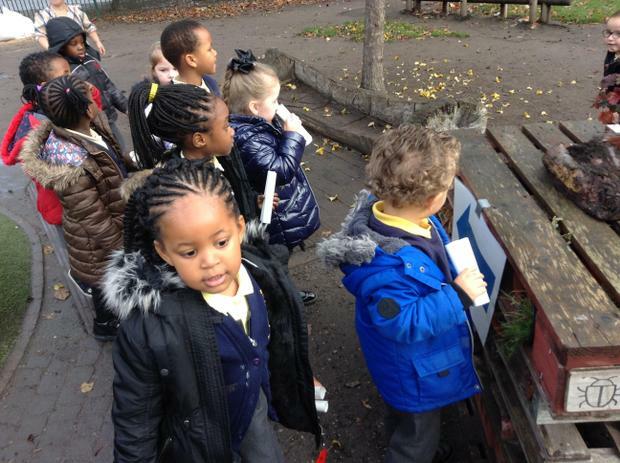 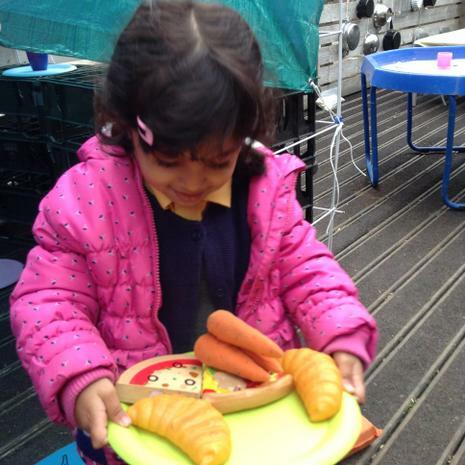 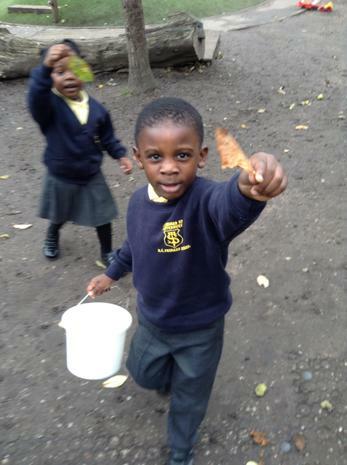 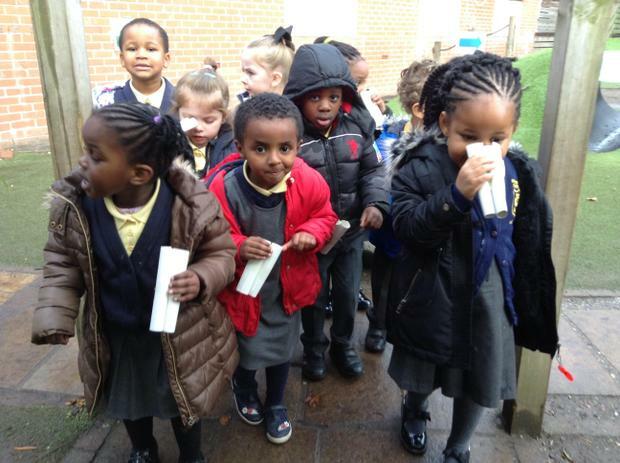 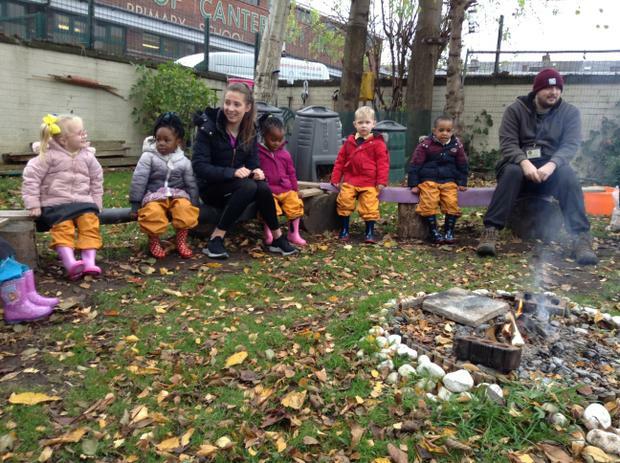 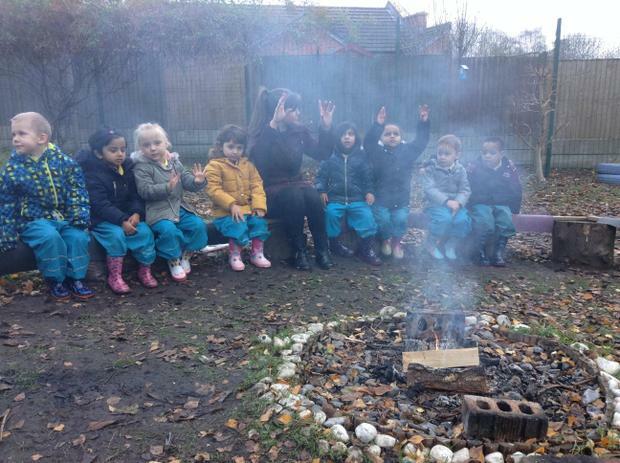 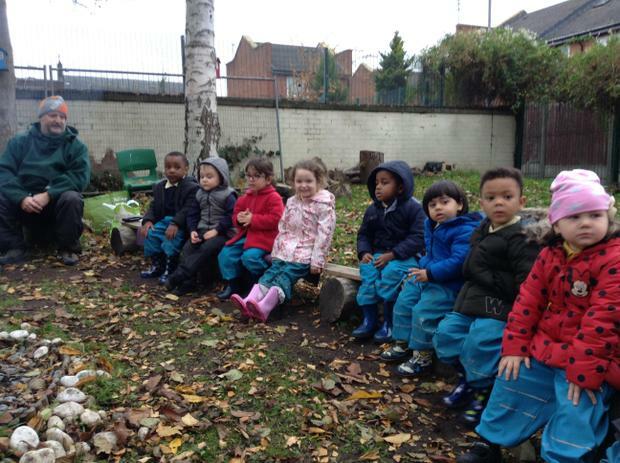 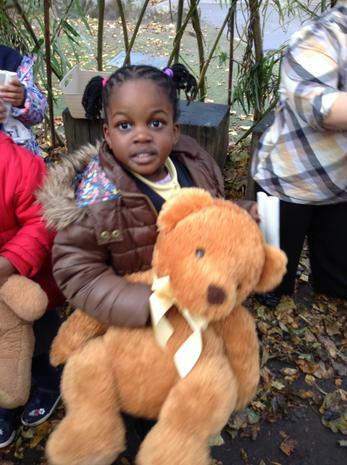 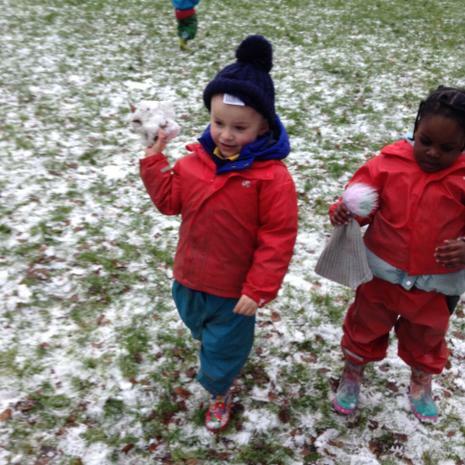 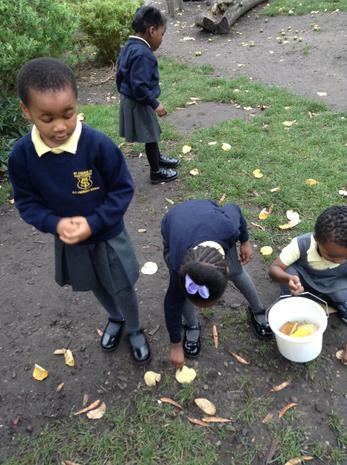 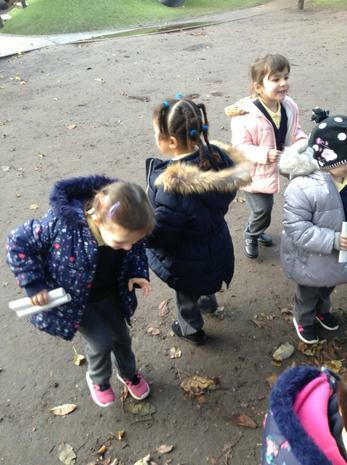 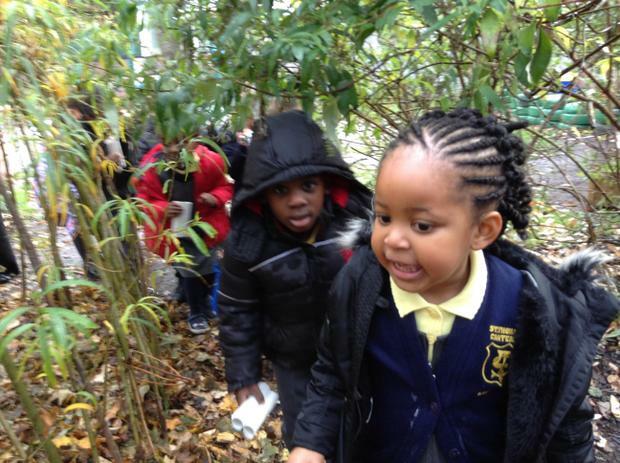 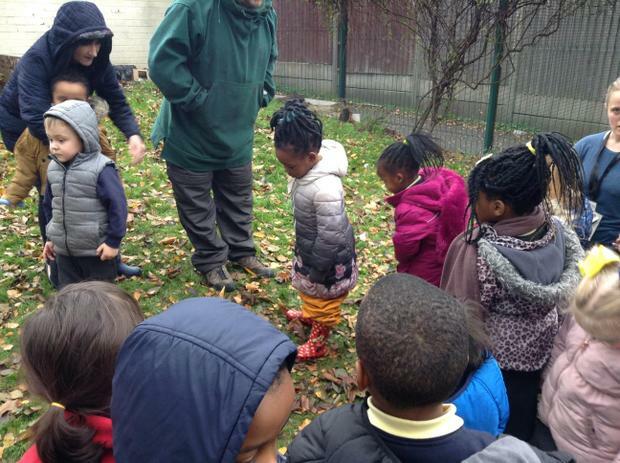 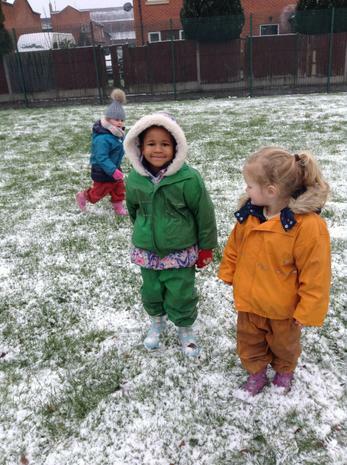 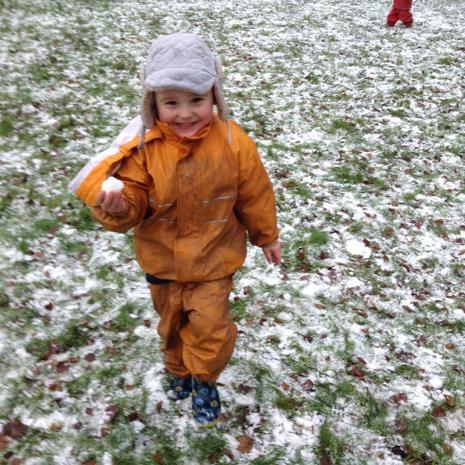 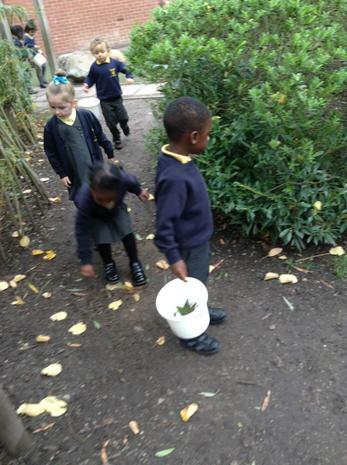 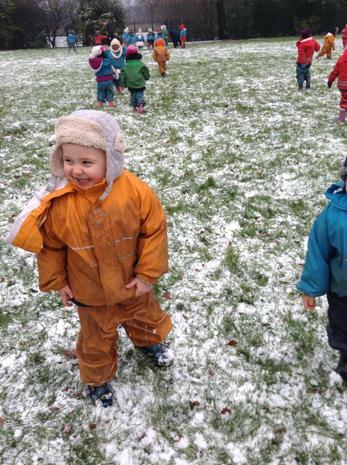 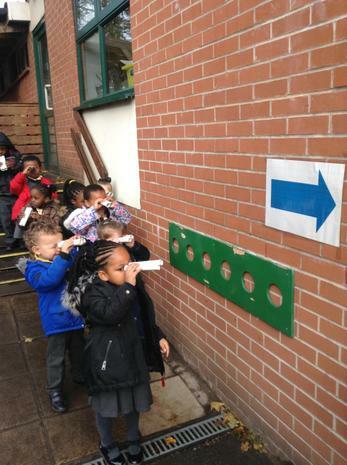 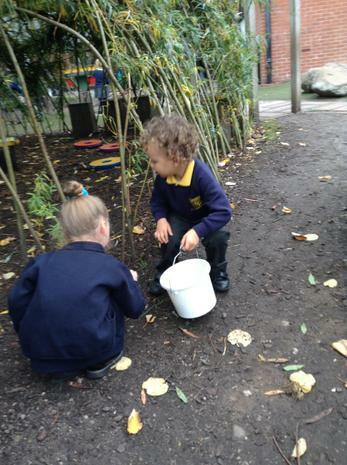 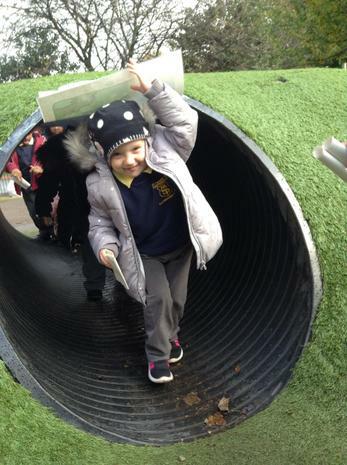 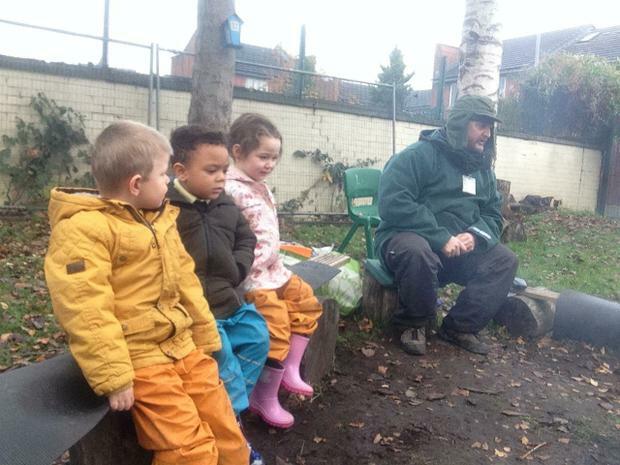 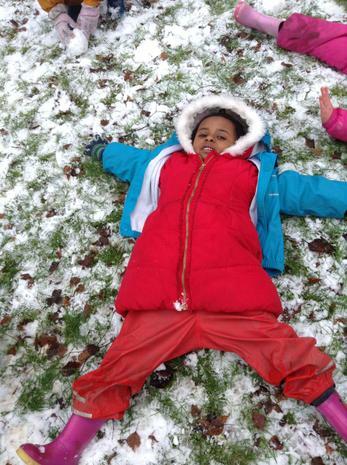 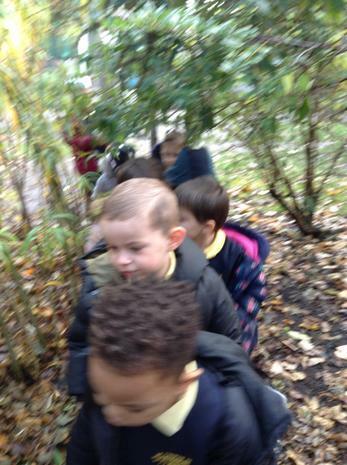 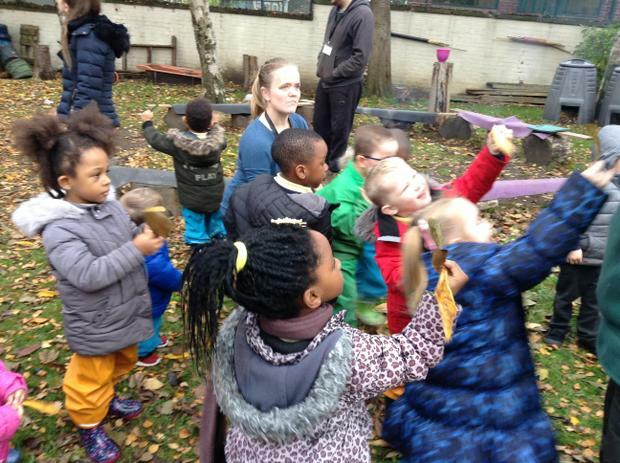 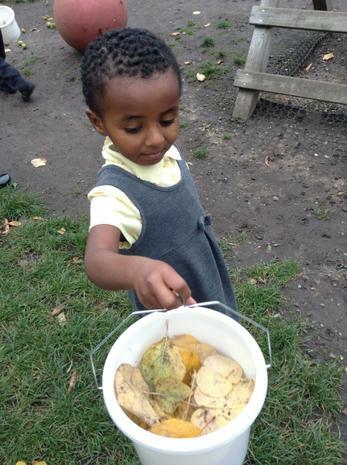 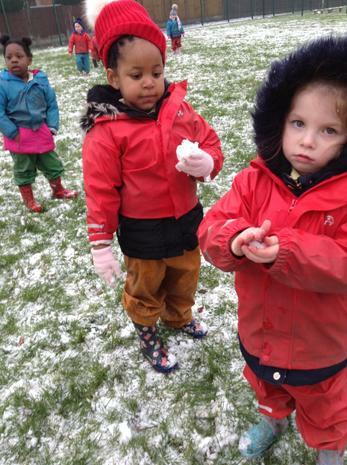 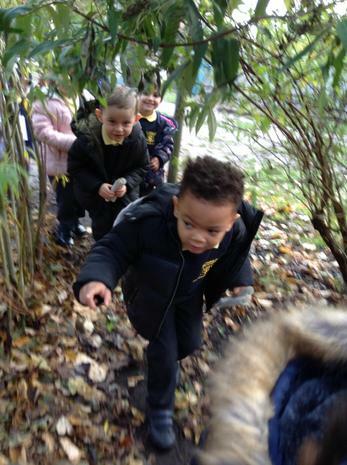 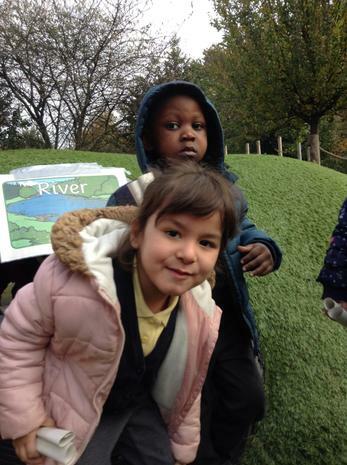 This term the children have been braving the wet Autumn weather to visit our very own forest school venue! 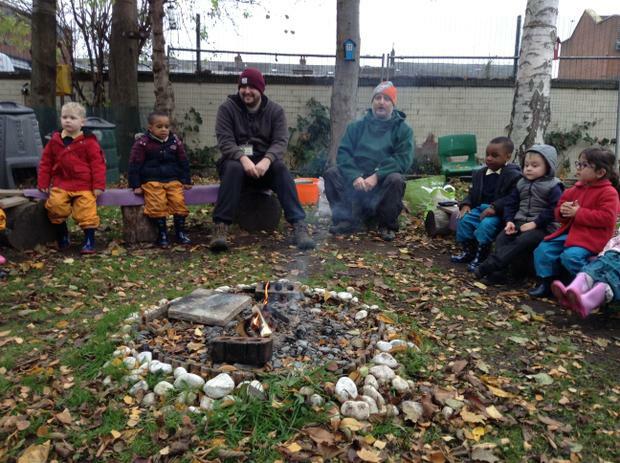 The sessions are led by our resident forest school lead Paul Brighouse, who will be spending some time with the children every Friday. 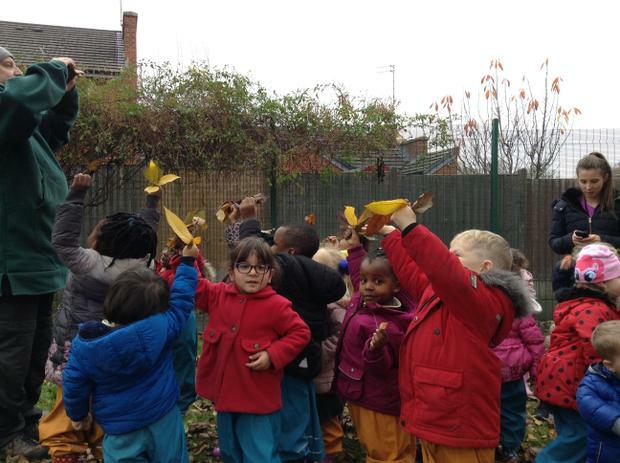 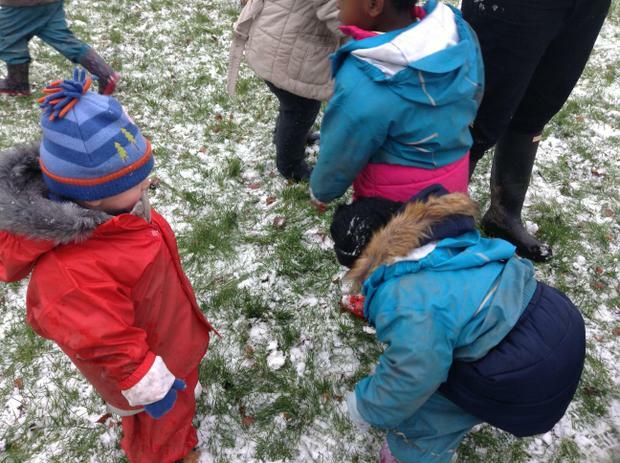 The sessions will act as an enhancement to their current curriculum, and recently we spent some time exploring the different coloured leaves that had fallen on the ground. 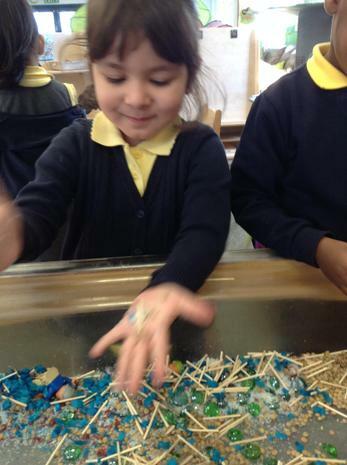 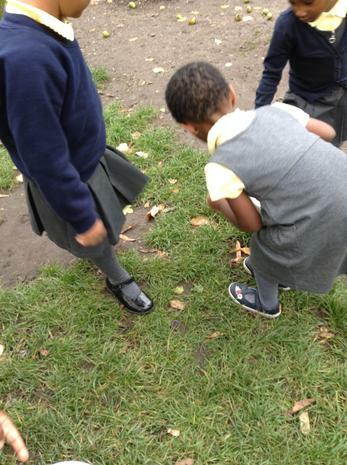 We also found some minibeasts that we safely held, and then put back into their natural habitat. 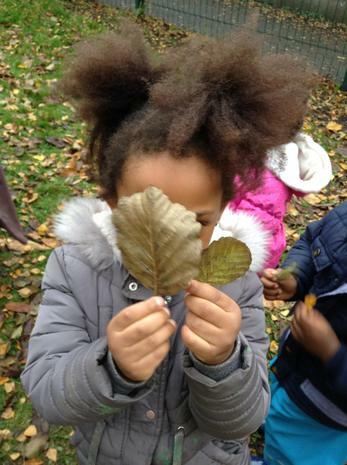 This half term we have be looking at Autumn! 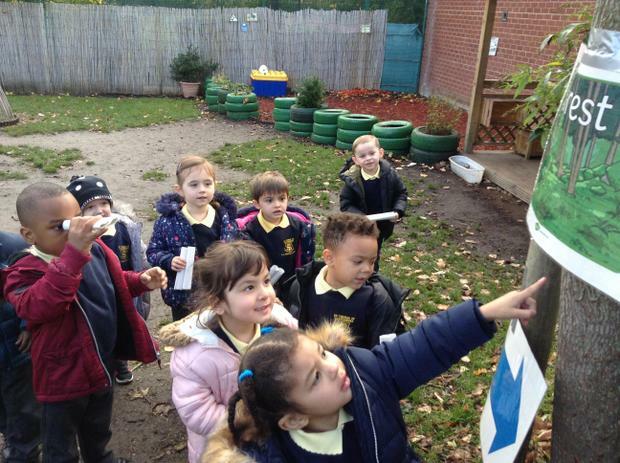 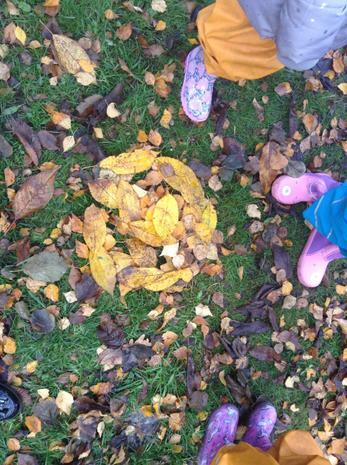 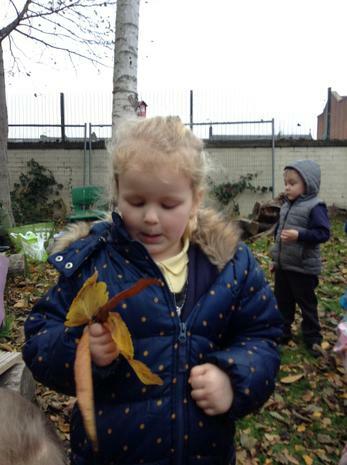 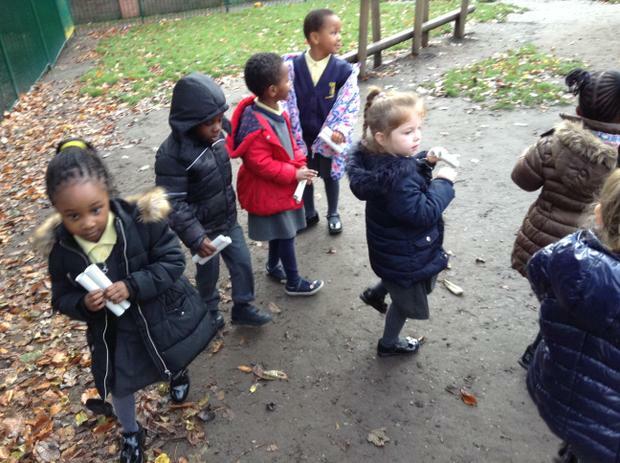 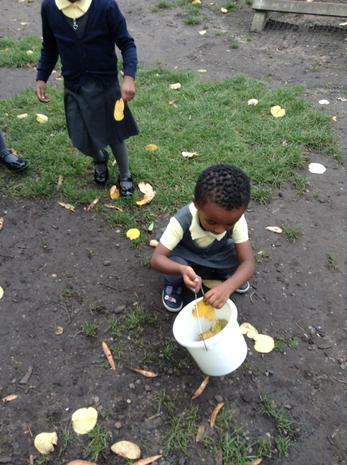 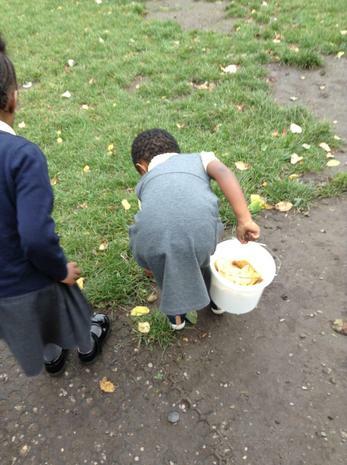 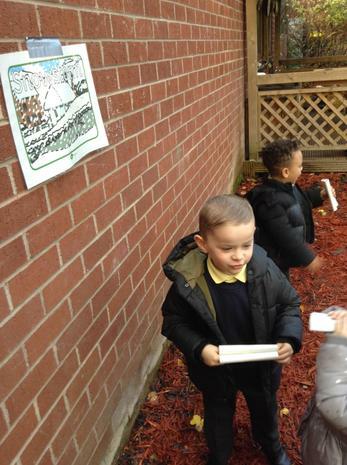 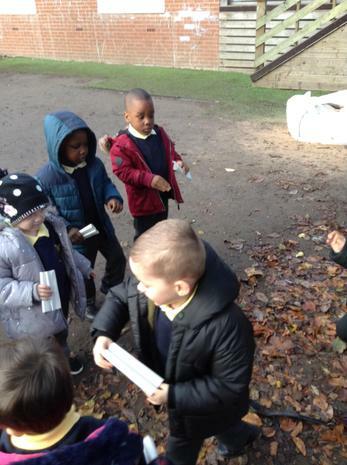 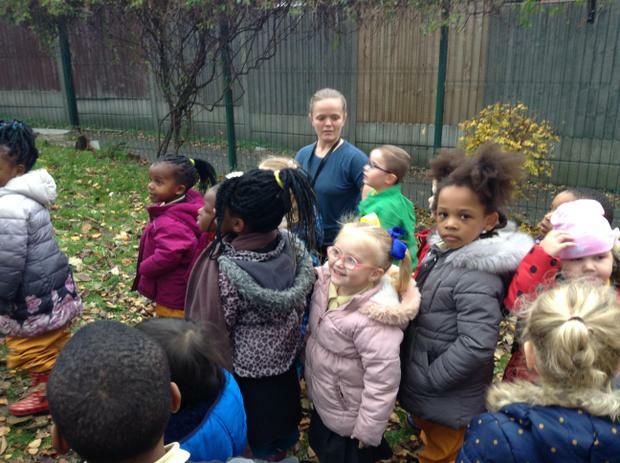 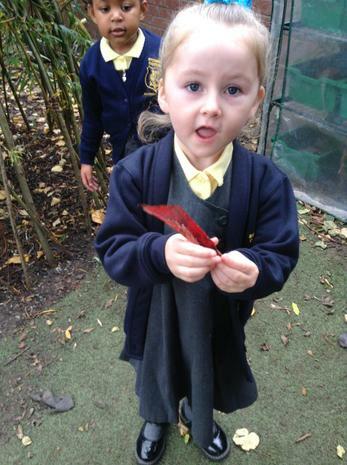 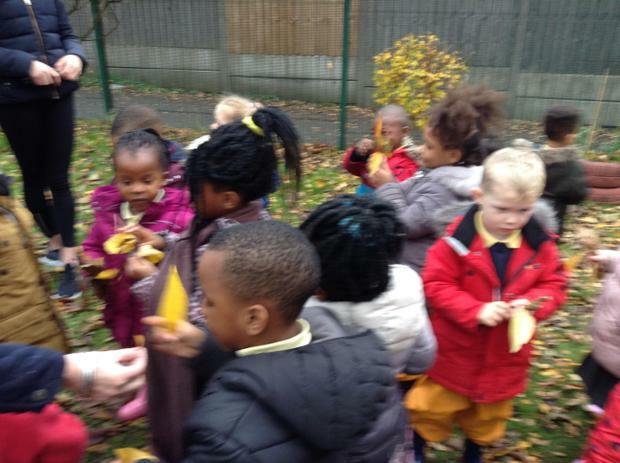 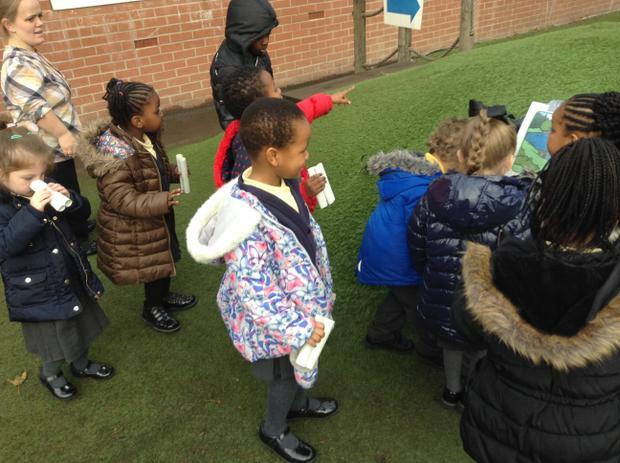 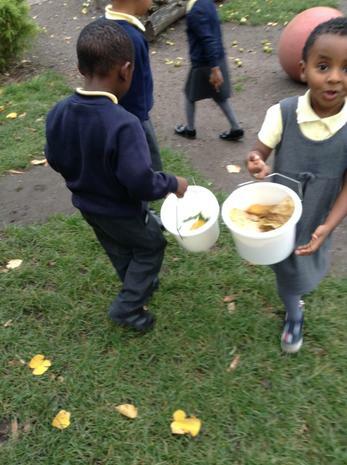 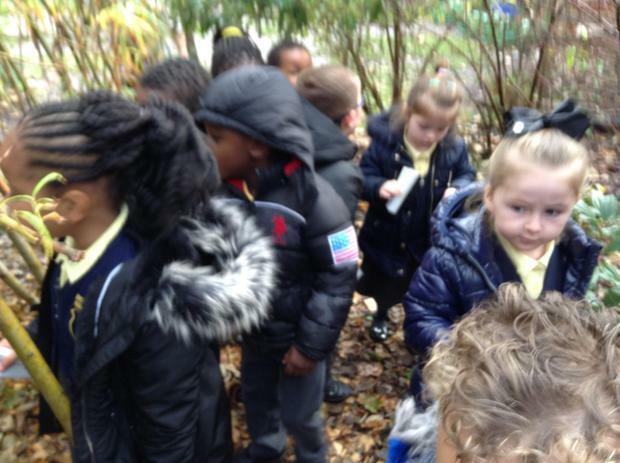 We've enjoyed spending time observing the changes in our outdoor environment through our Autumn walks, where we collected leaves and other things that had fallen from the trees. 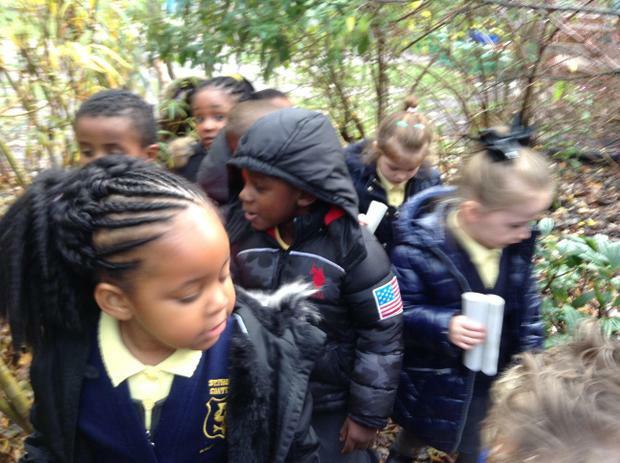 Back in class we even researched the different animals that get ready to hibernate during this time of the year. 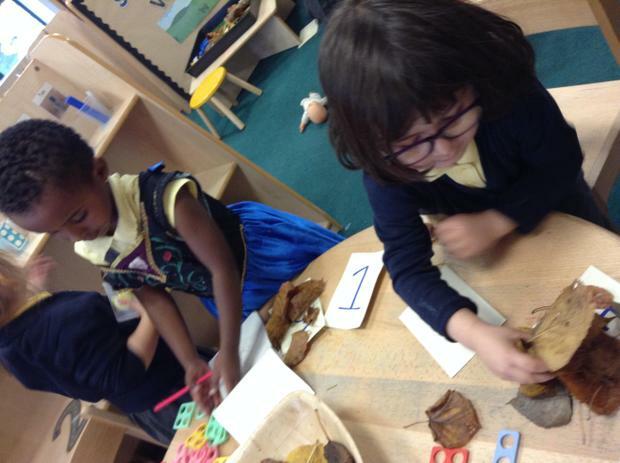 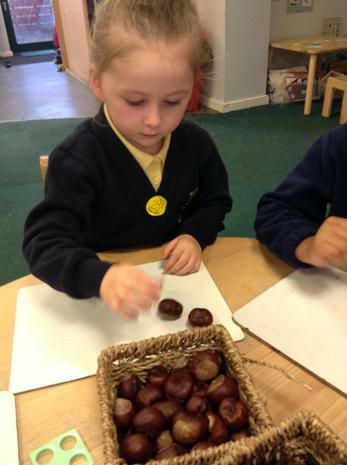 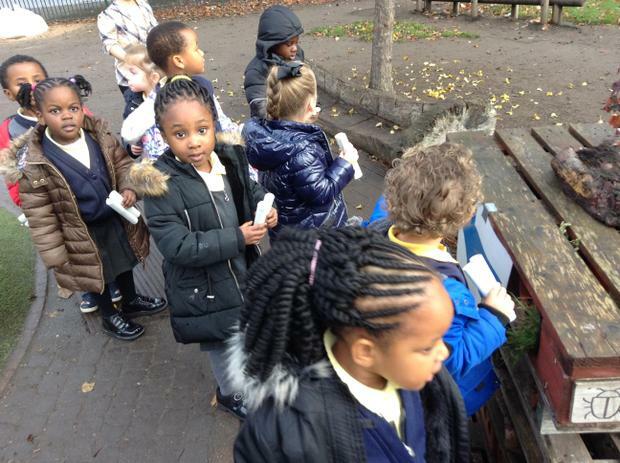 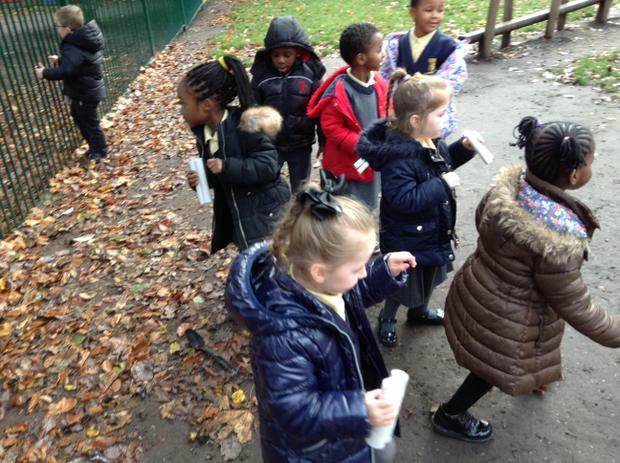 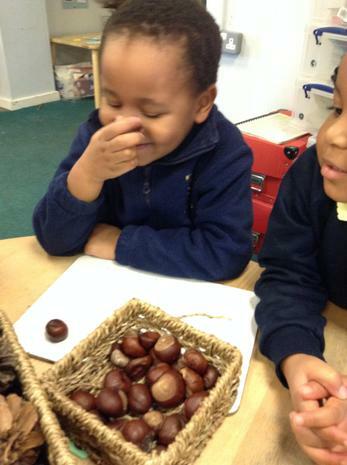 We had lots of fun using our findings from the Autumn walk for observational drawings, small world & craft activities. 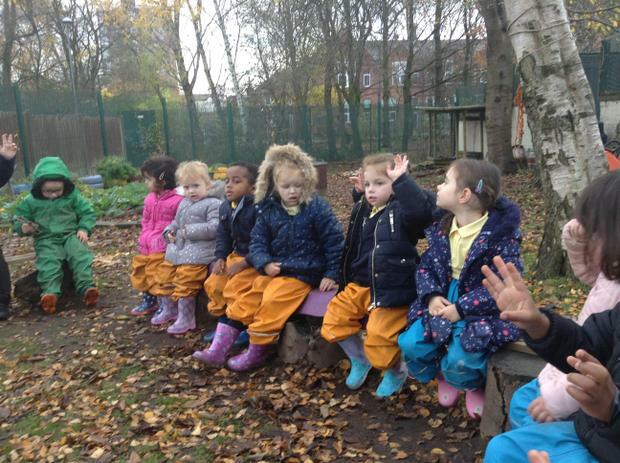 Storytelling is such a precious time in Nursery, which we use daily to expose the children to new language through high quality texts. 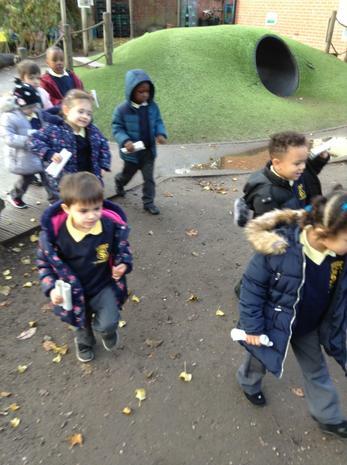 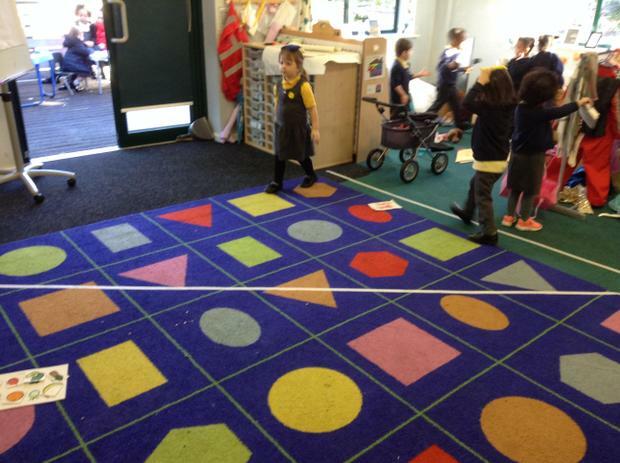 This week we have focused on Michael Rosen's 'We're Going on a Bear Hunt'. 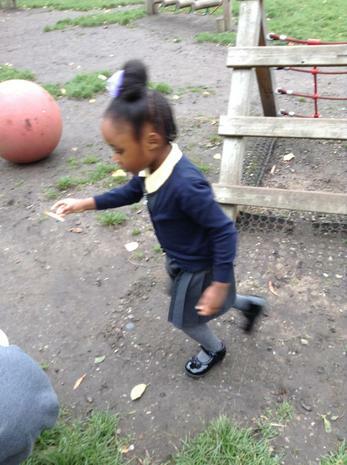 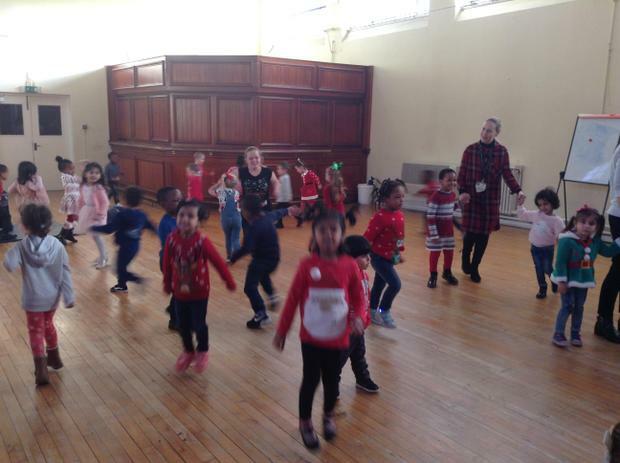 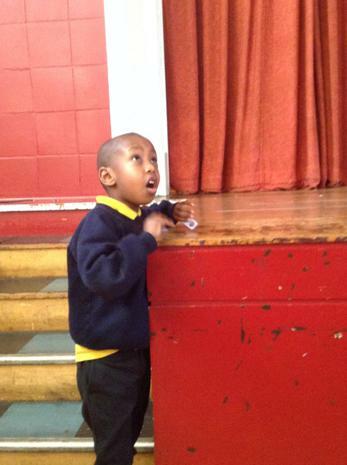 As is it already a familiar story for most of our children, we focused on the children being able to orally rehearse the story themselves, with a little help from Michael Rosen himself (take a look at the video below). 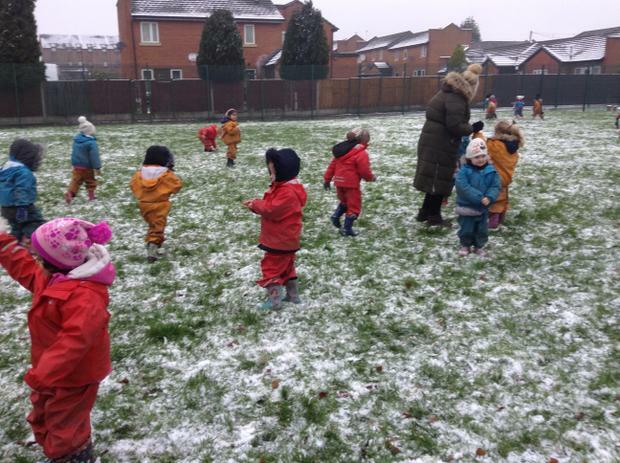 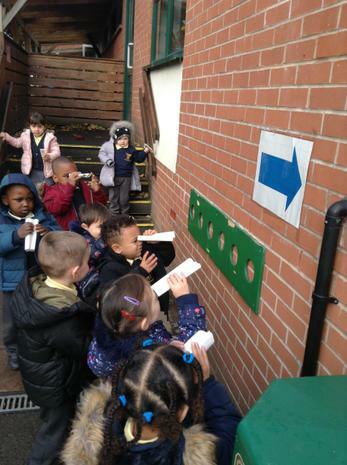 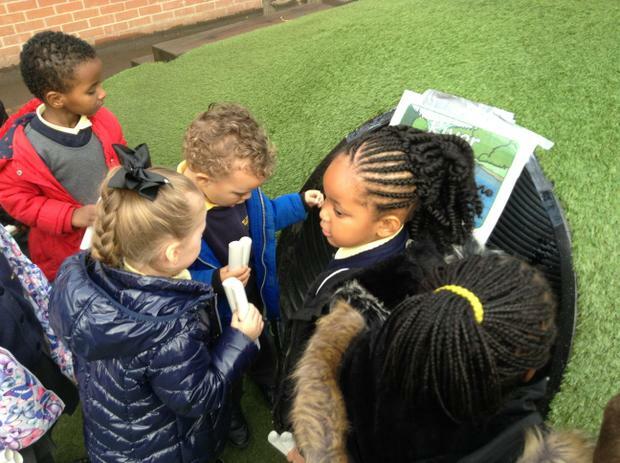 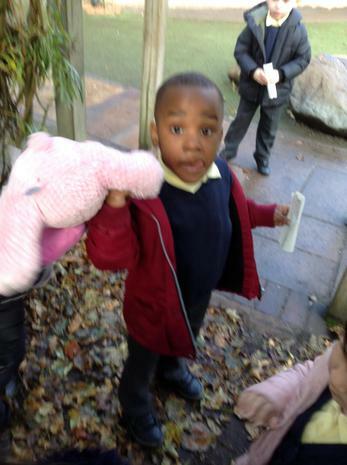 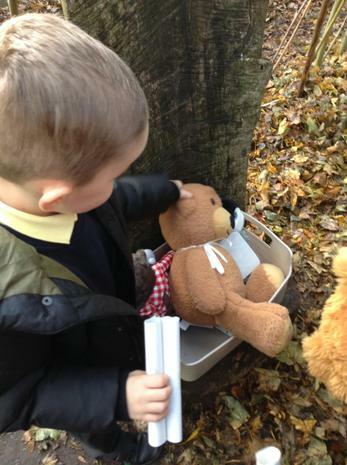 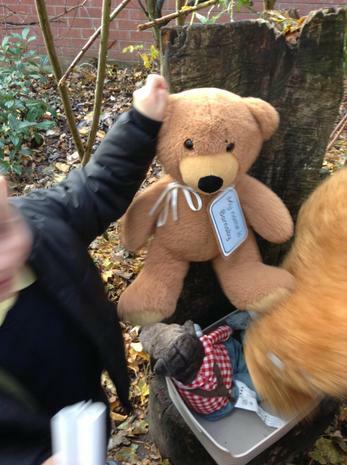 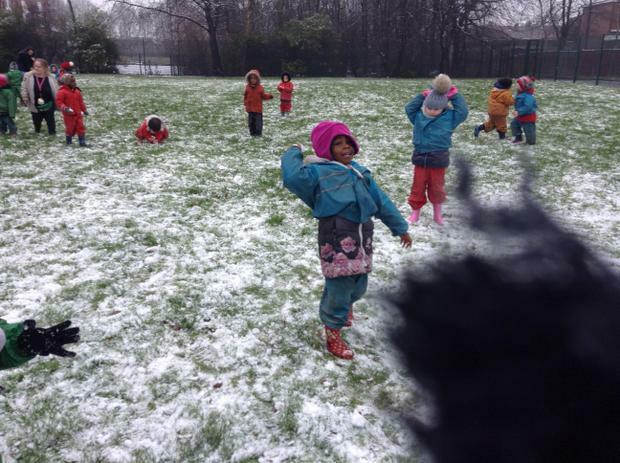 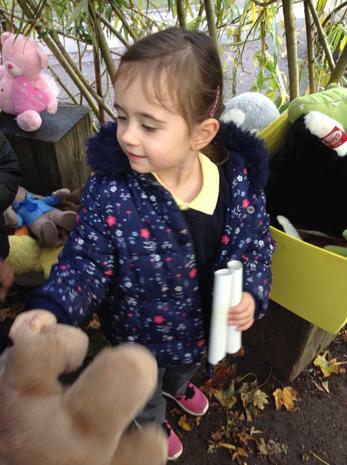 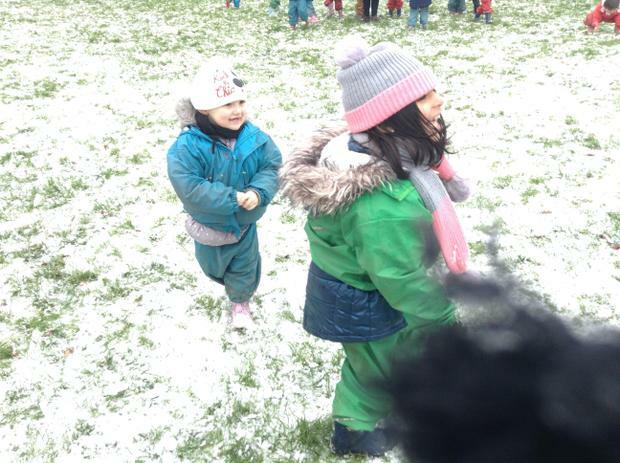 We even recieved a letter from all of our class teddy bears explaining that they were playing hide and seek outside, and that we had to go on a bear hunt to find them! 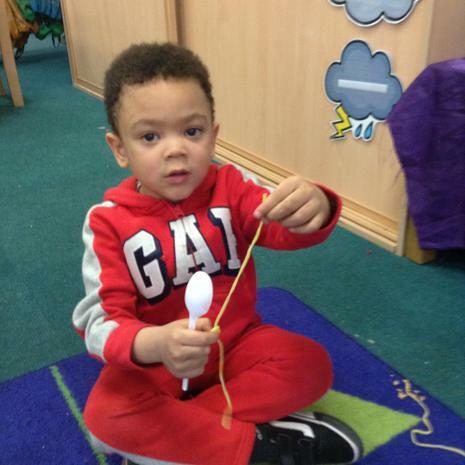 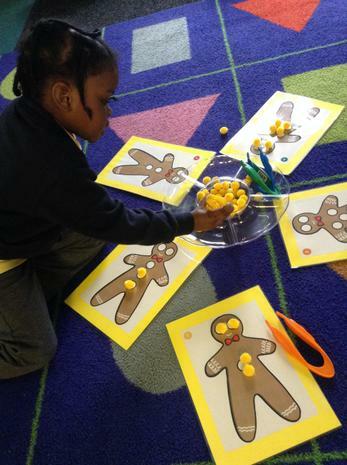 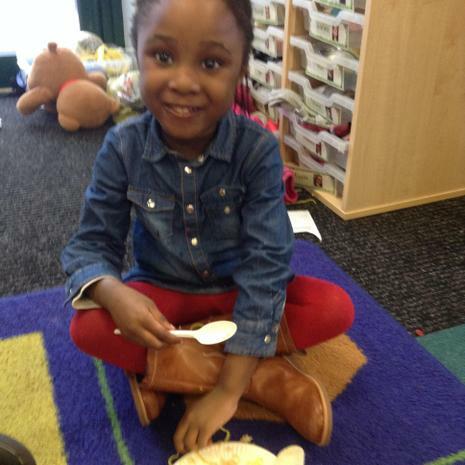 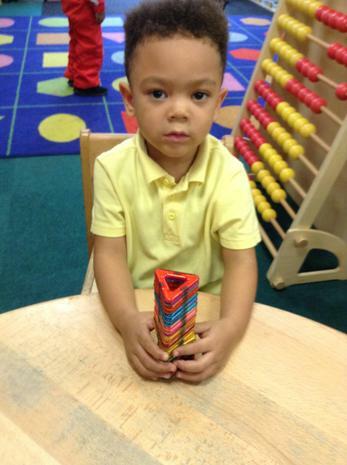 See if your child can retell the story at home! 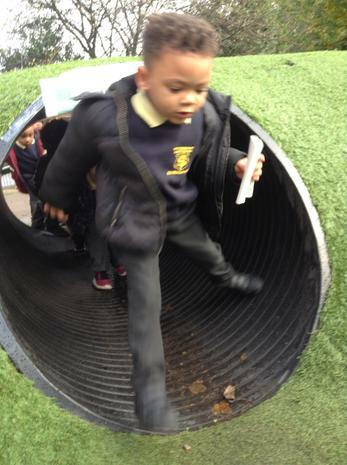 "we can't go over it, we can't go under it...we've got to go through it!!"